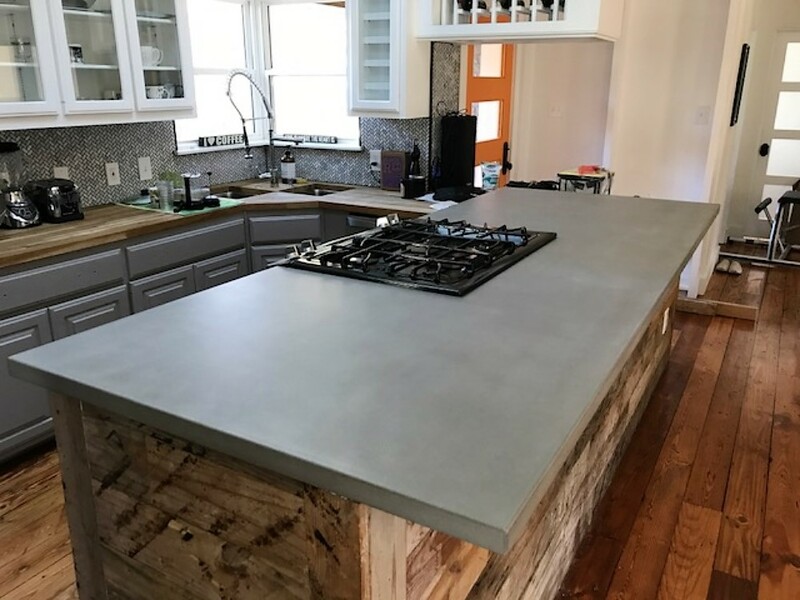 Grey concrete countertops wth our distressed edge. 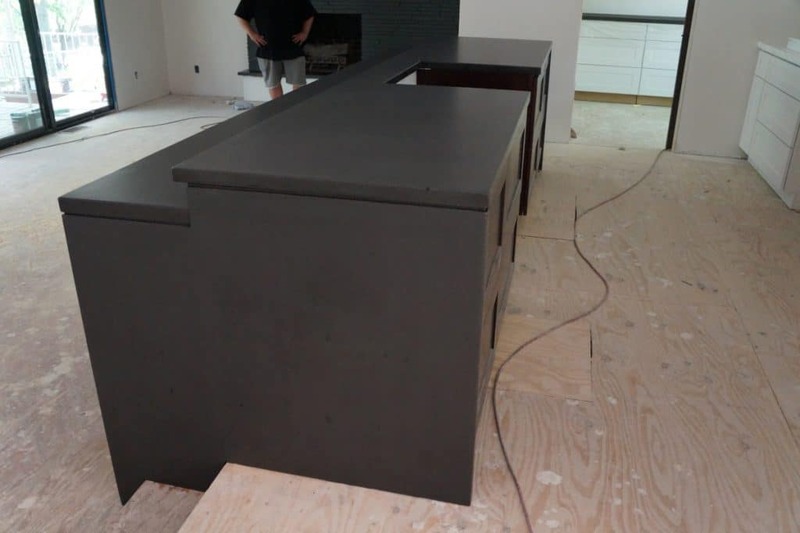 Great shot conforming to the countertops and stair steps. 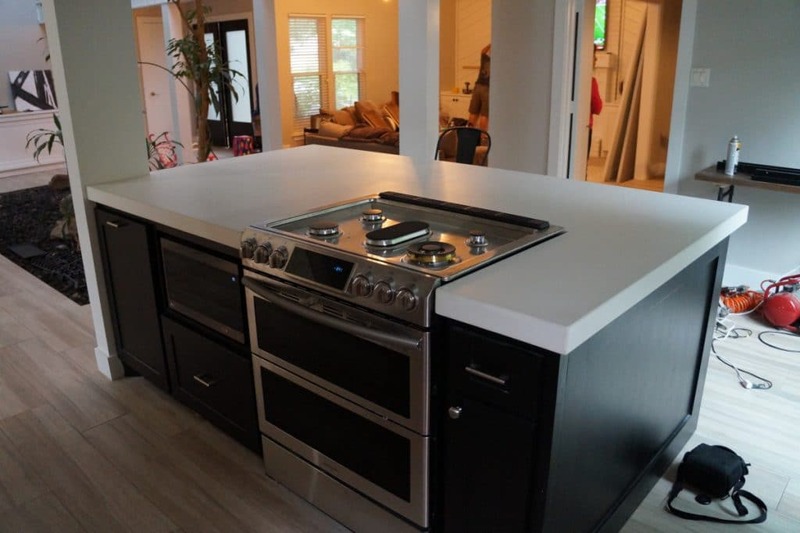 This kitchen included a very unique island design. 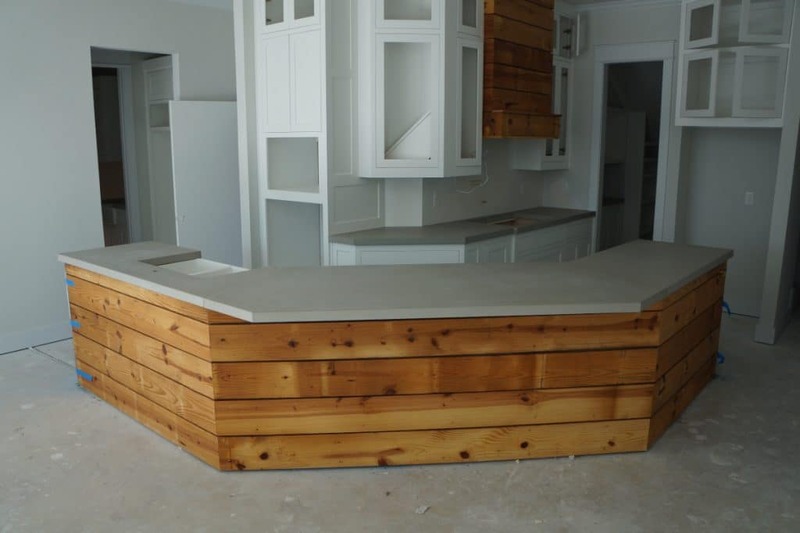 This is the very first job with our wood style concrete countertops. 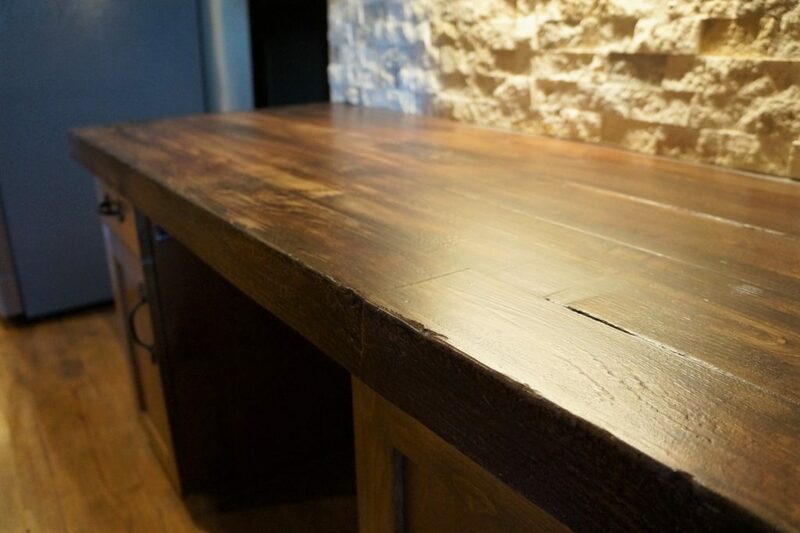 With this wood look, we were able to make the bar countertop 11' long. 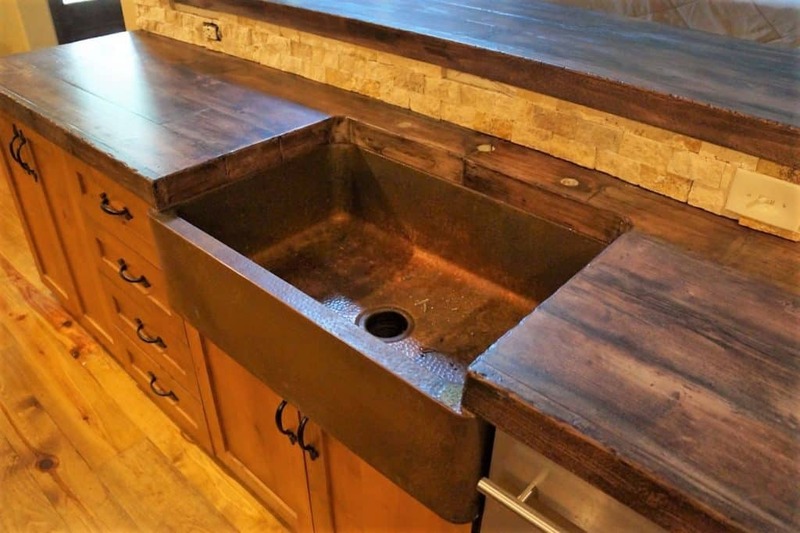 We were able to capture the end grain and side grain inside the sink to add to the effect of real wood. 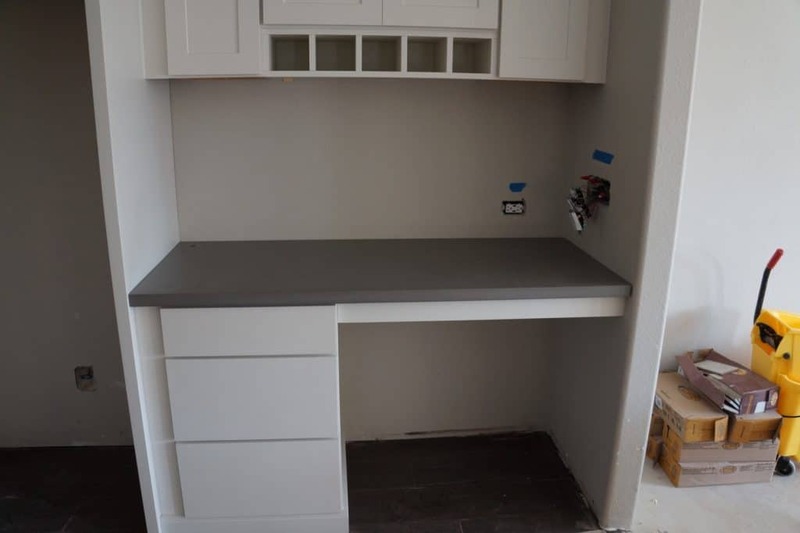 This was a small desk area on the side of their kitchen. 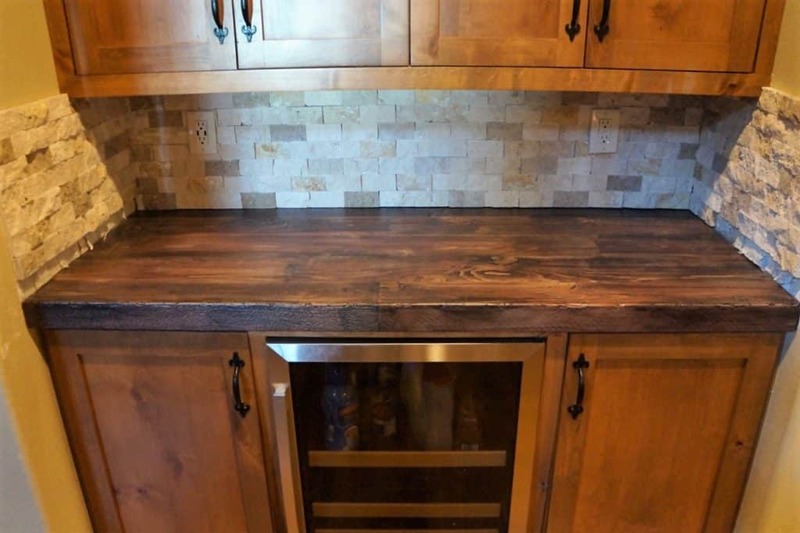 A close up view of the wood grain. 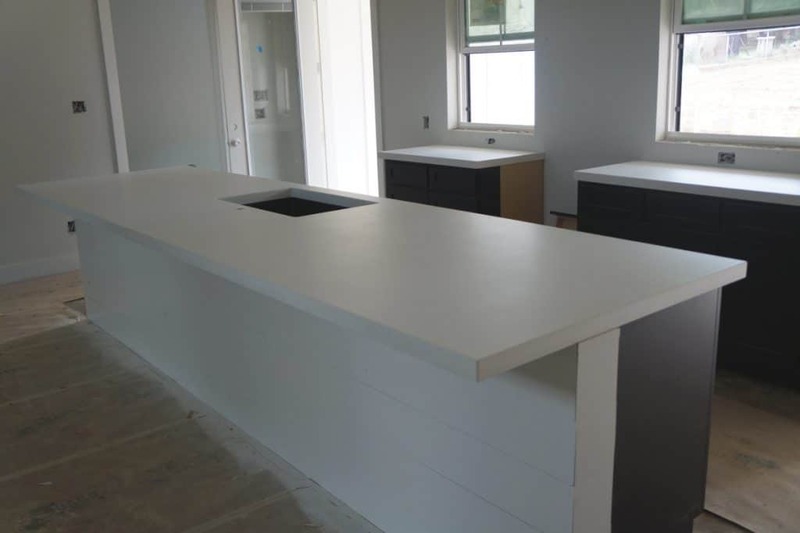 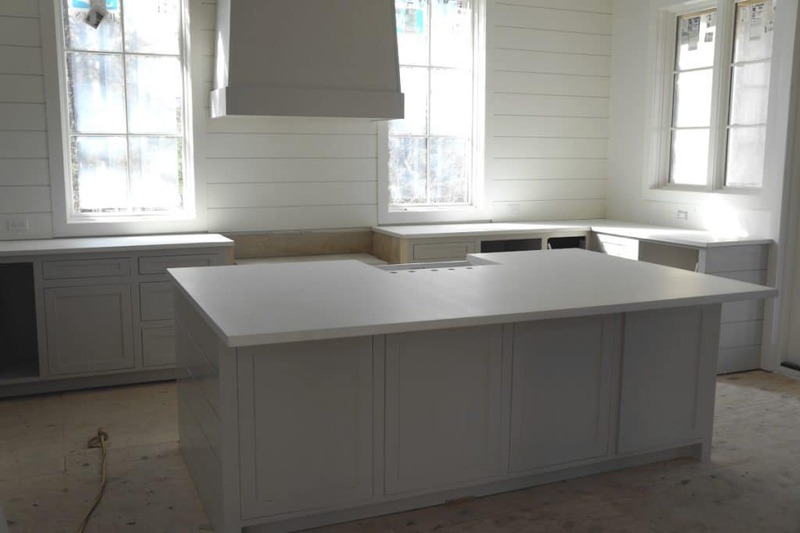 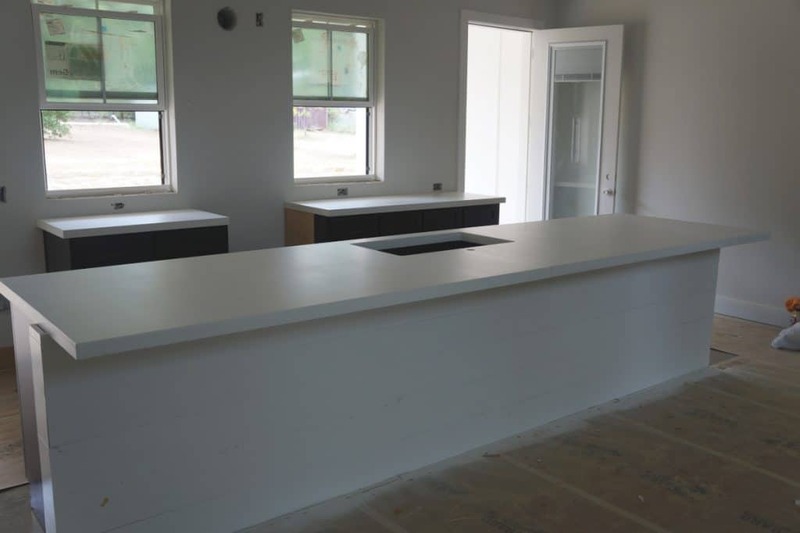 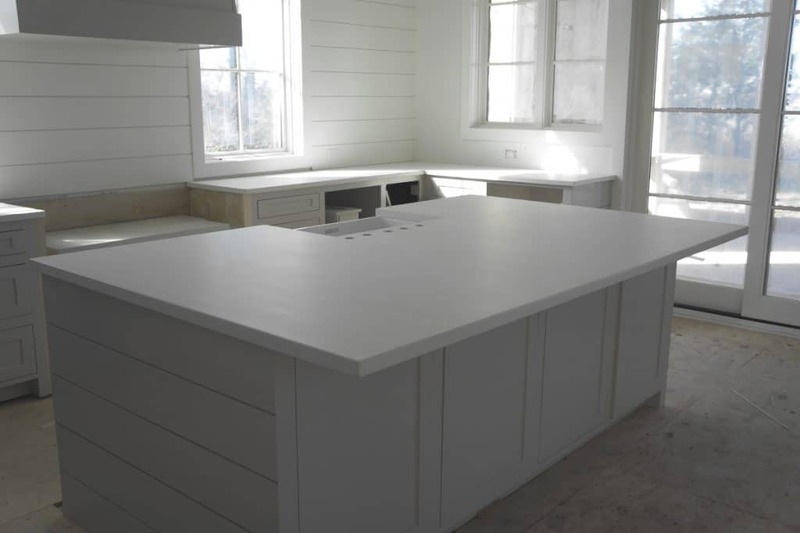 This is a large kitchen with all white concrete countertops for a ranch house in Celina, Tx. 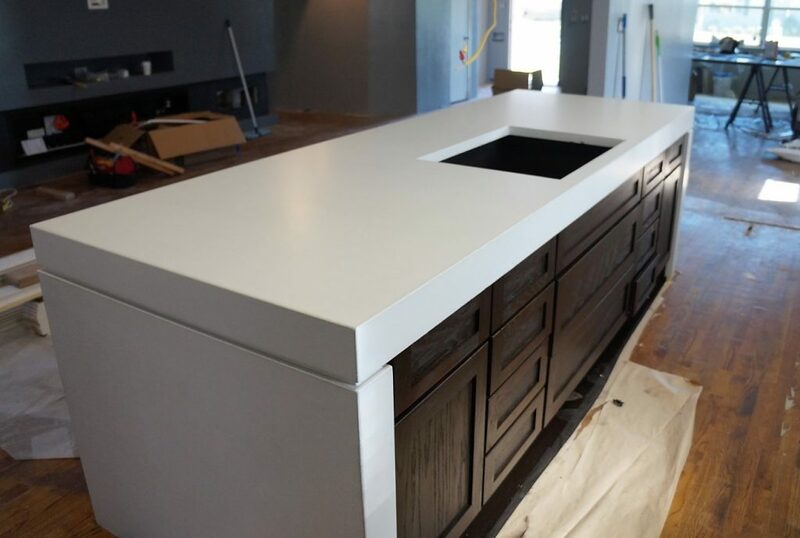 This island had to be lifted to the second story via sky lift. 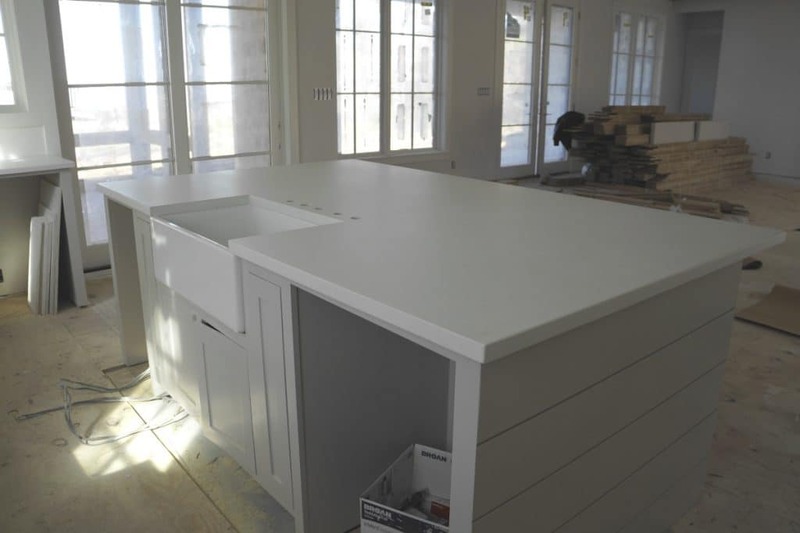 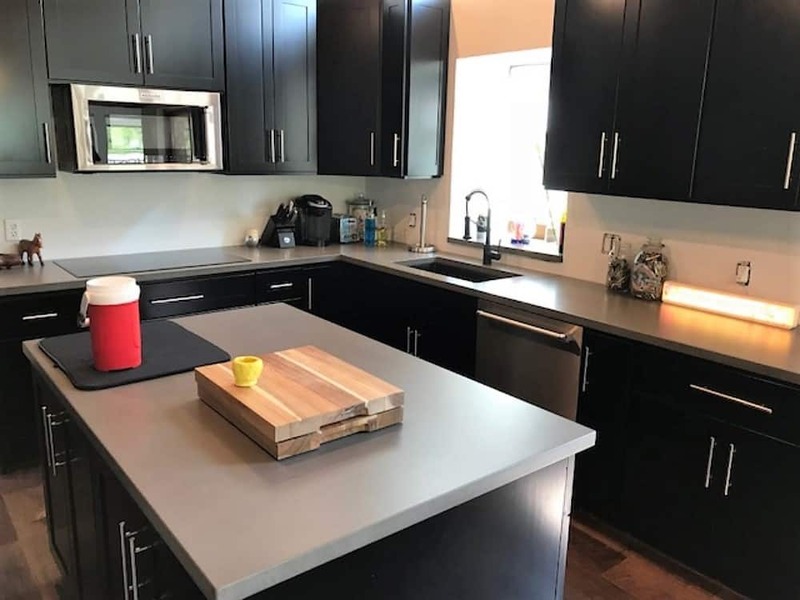 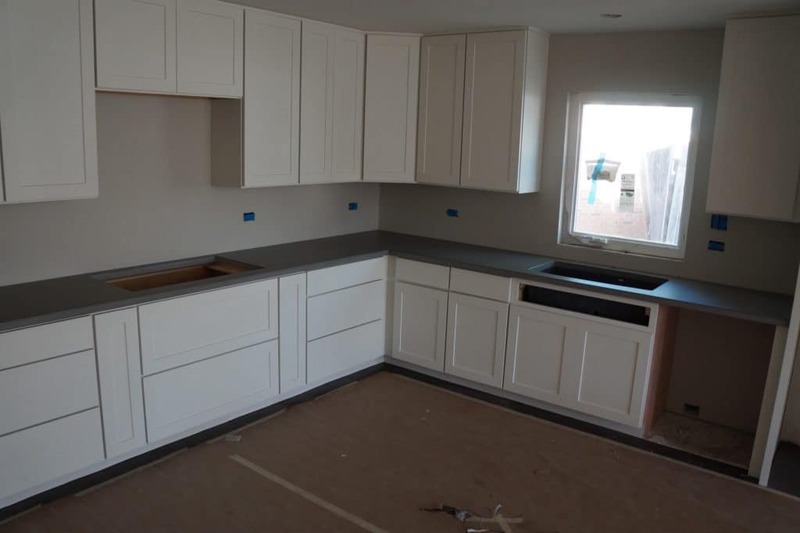 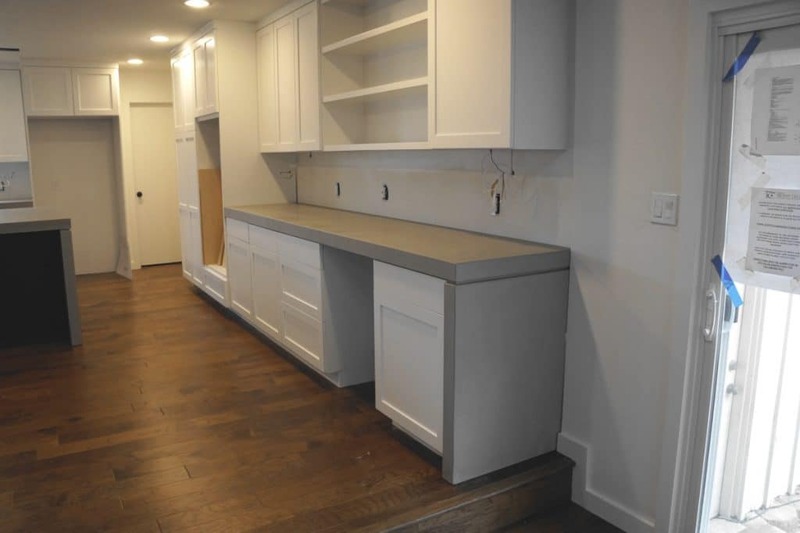 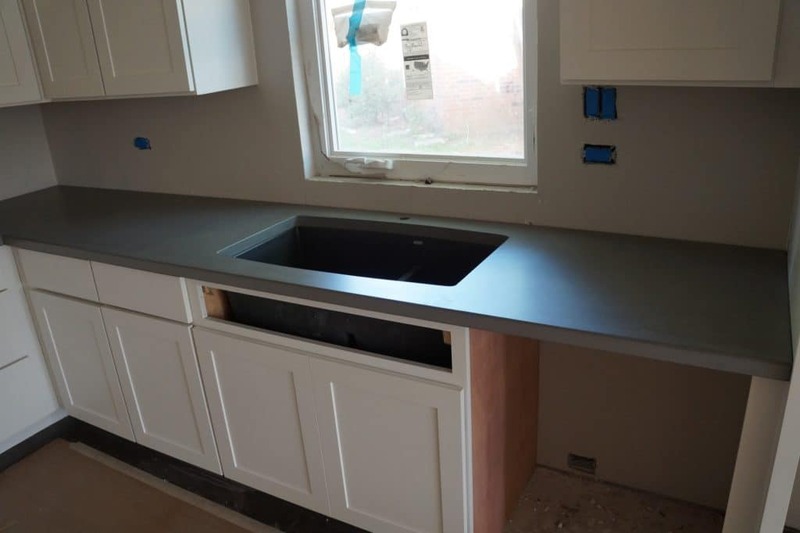 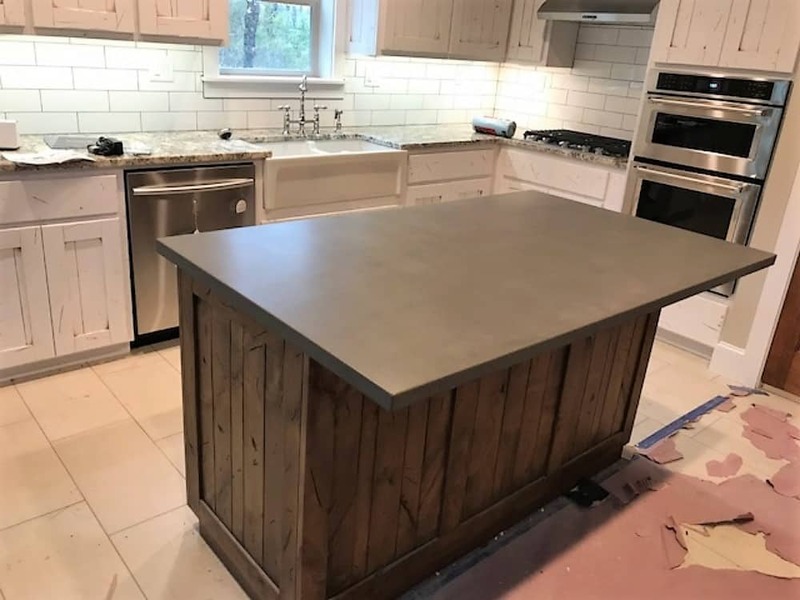 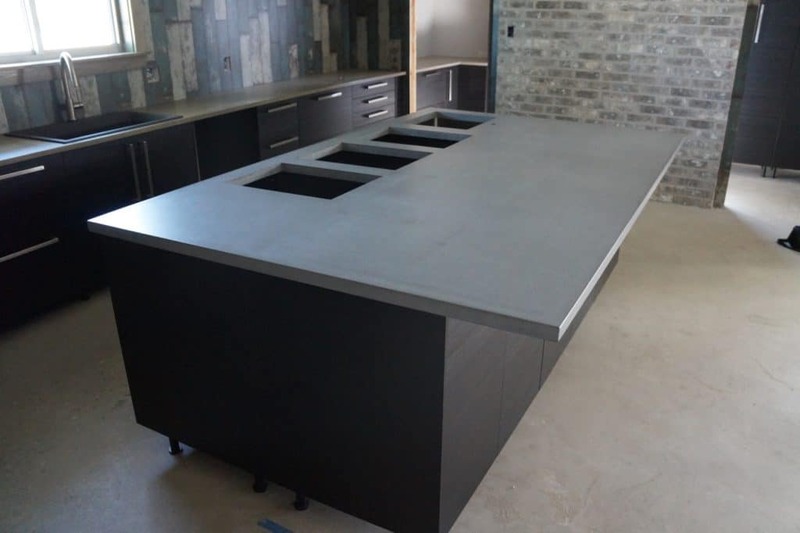 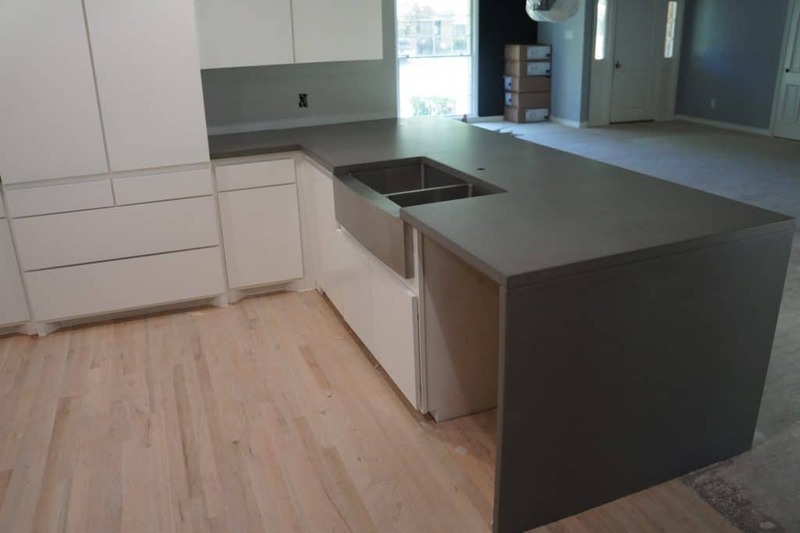 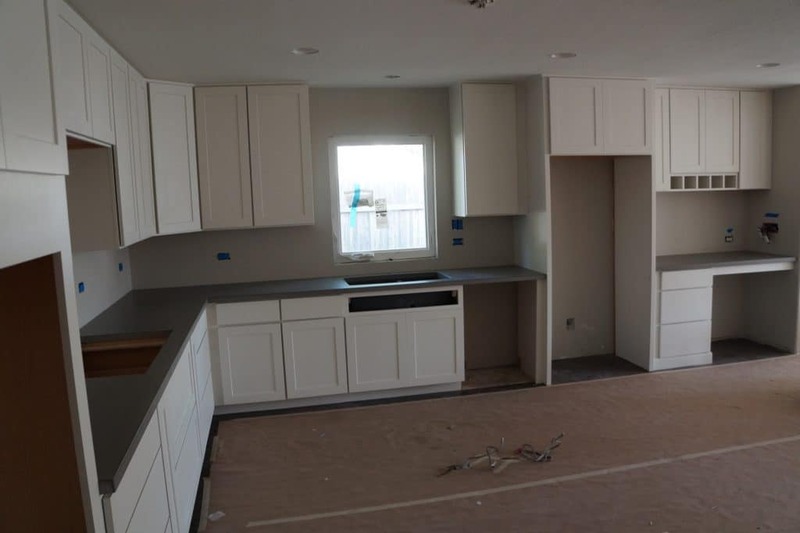 Beautiful grey concrete countertops with lots of preperation space. 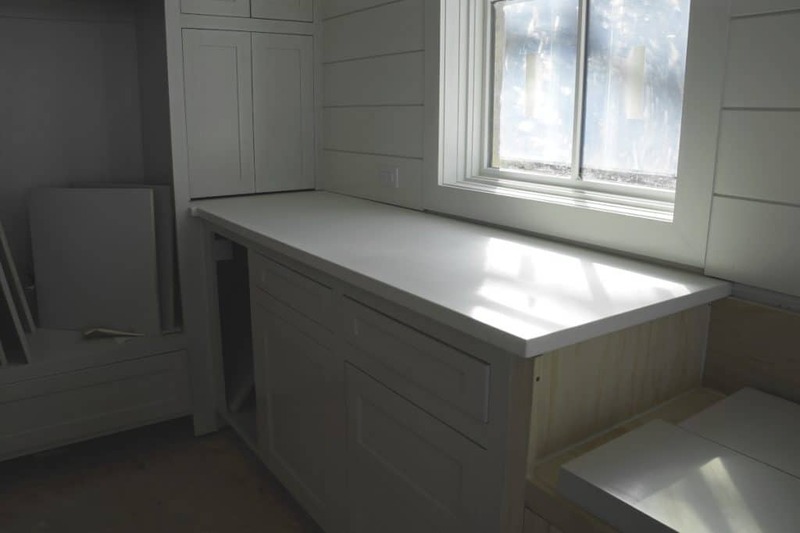 A small buffet area to the side of the kitchen. 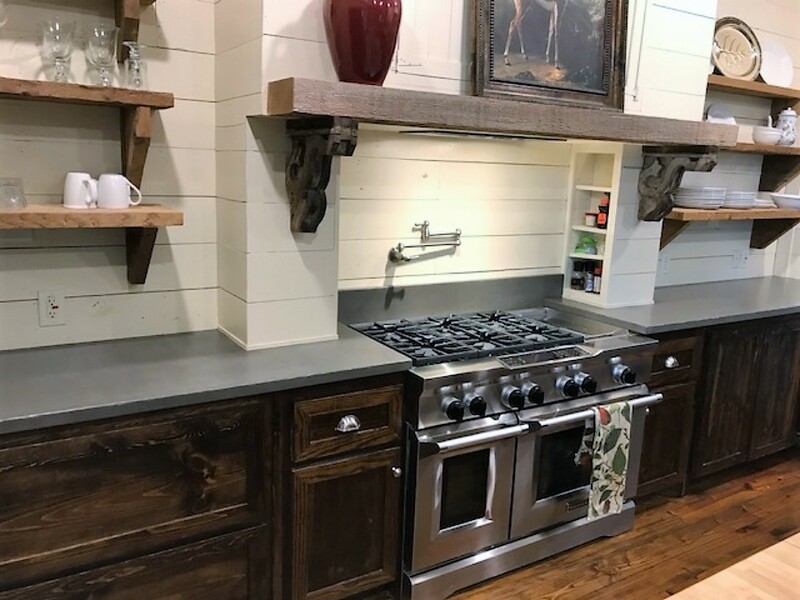 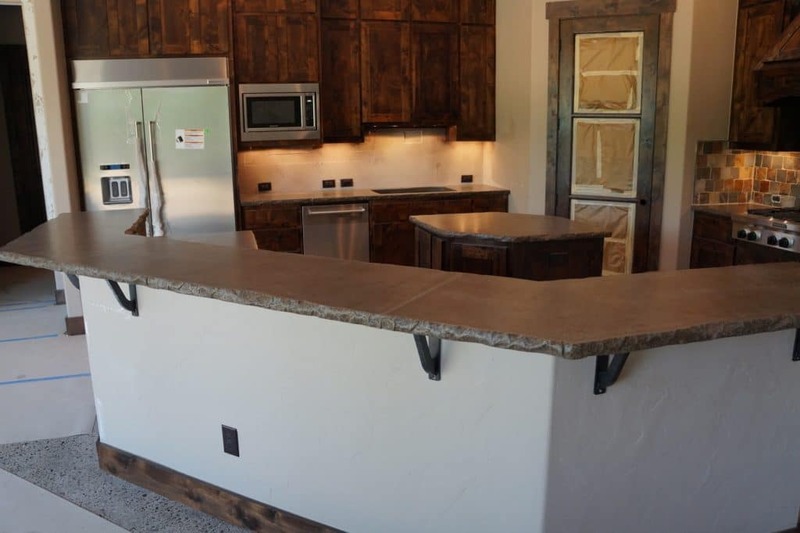 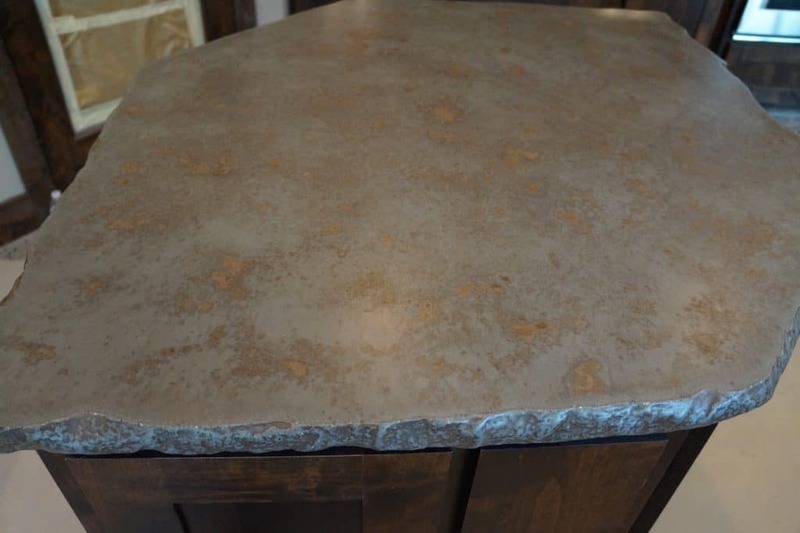 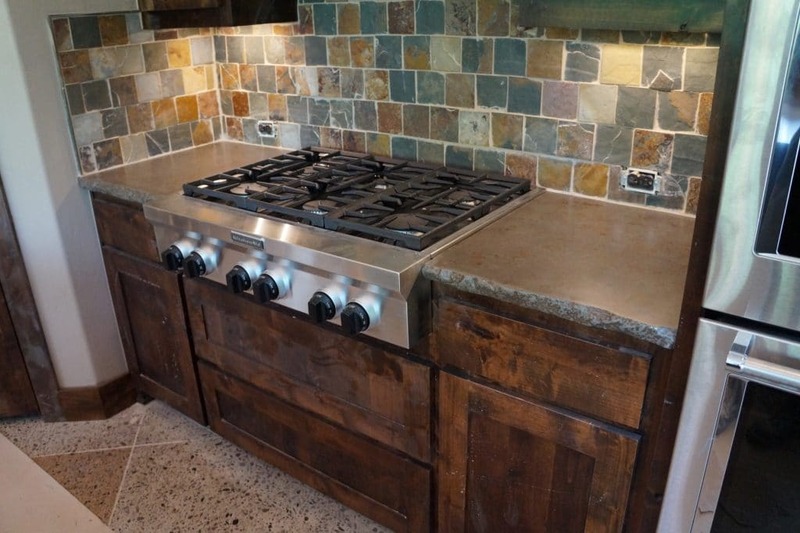 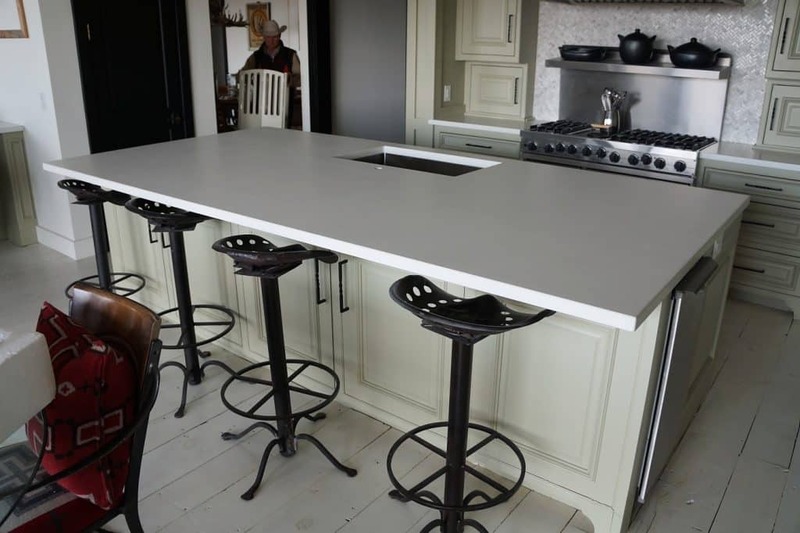 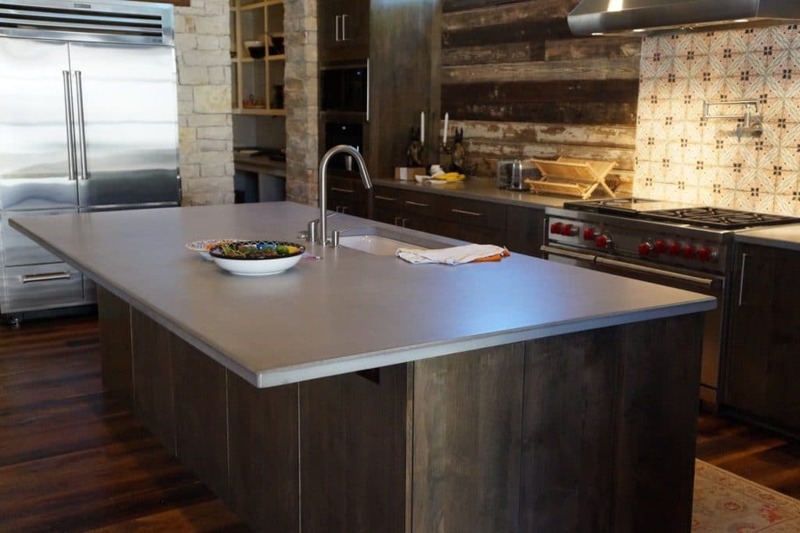 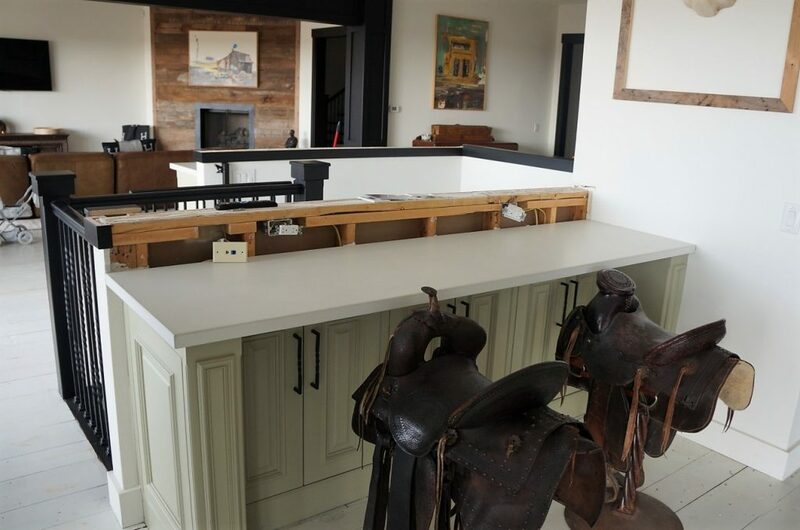 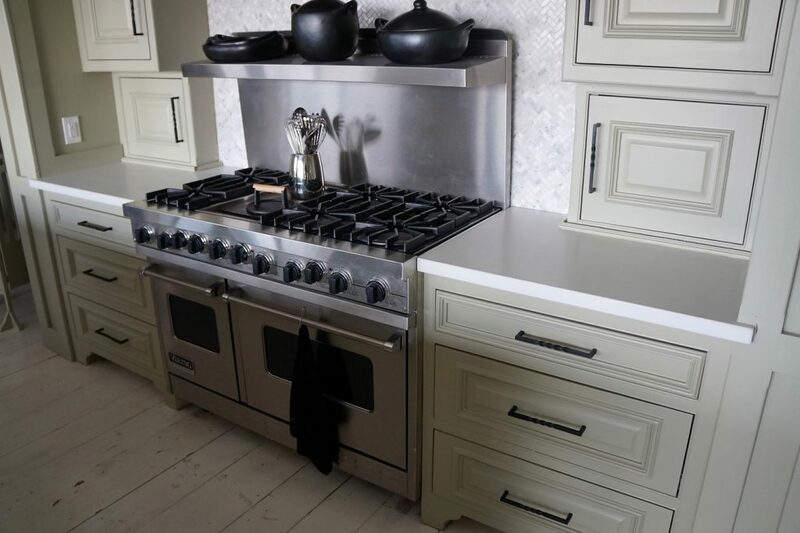 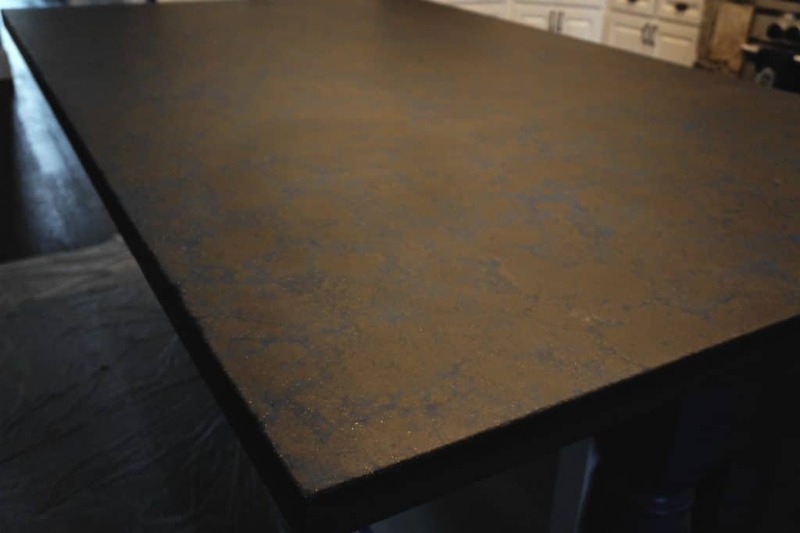 Concrete countertops with our distressed egde to add to the rustic feel of the home. 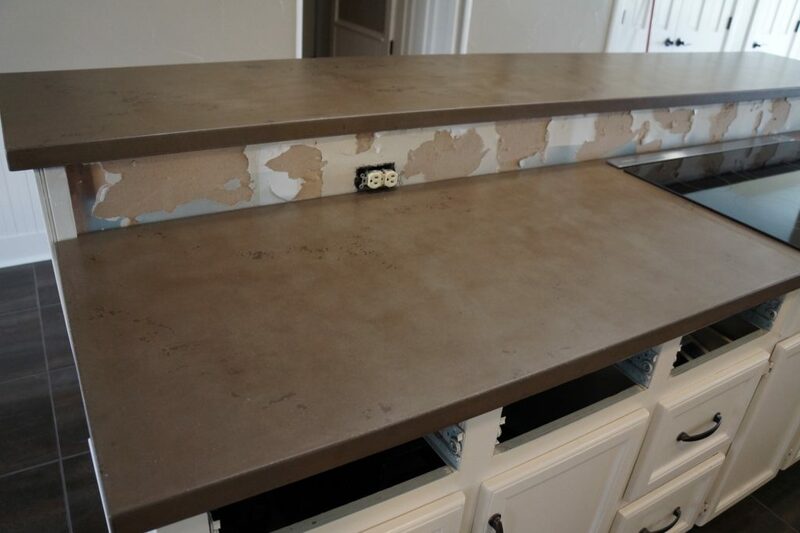 Grey concrete countertops with our distressed edge and various levels of sand exposed on the top. 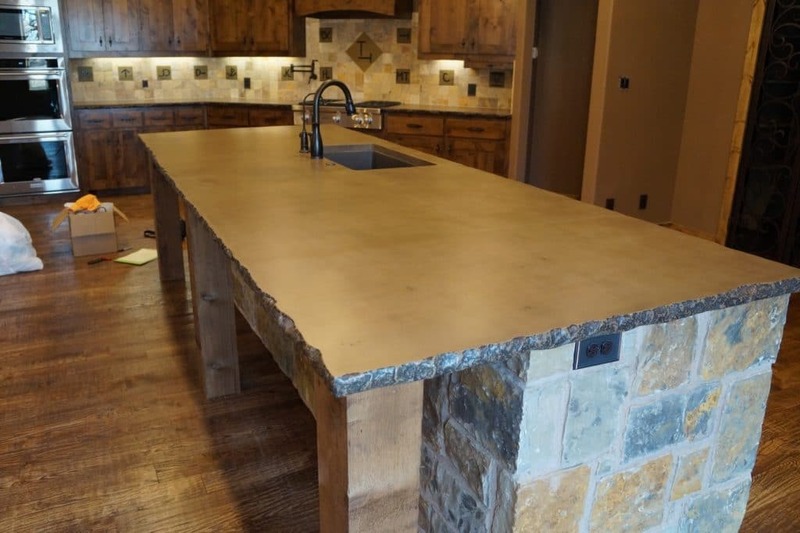 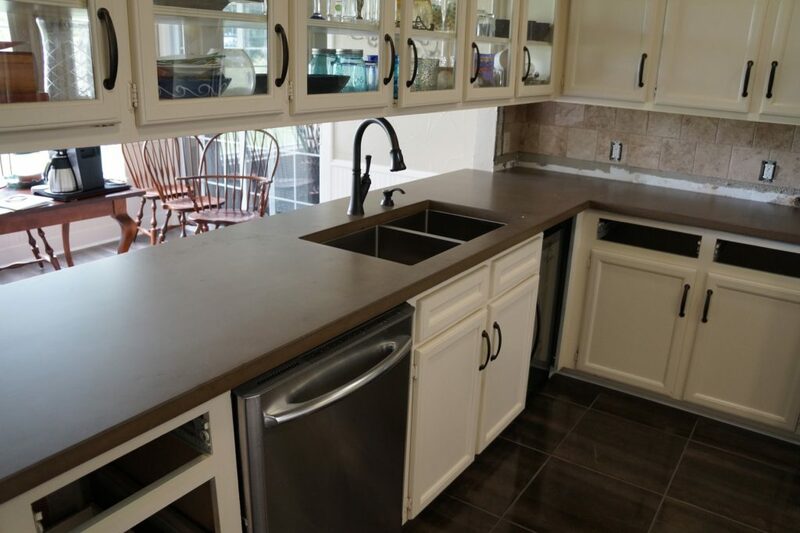 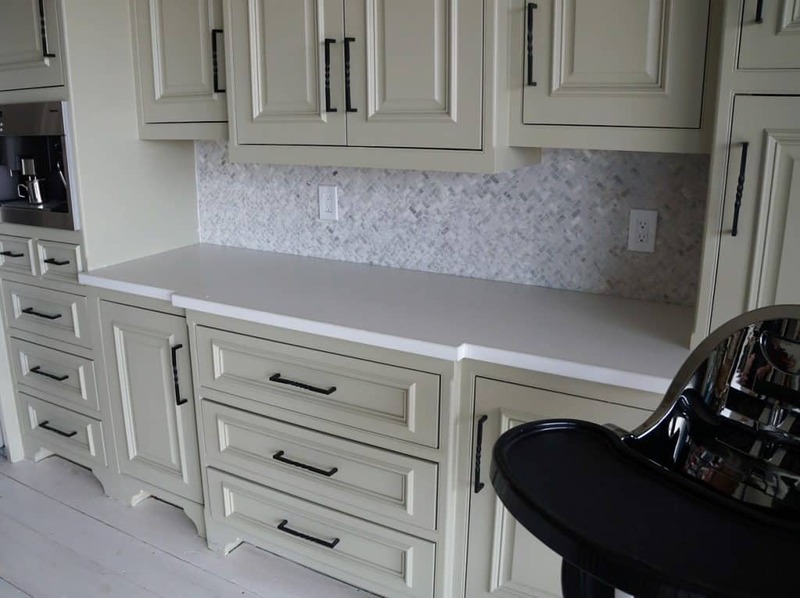 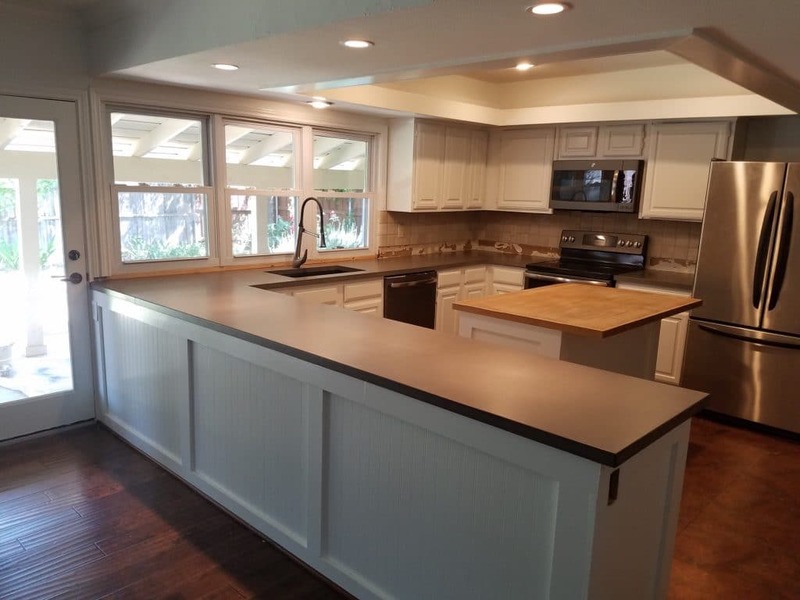 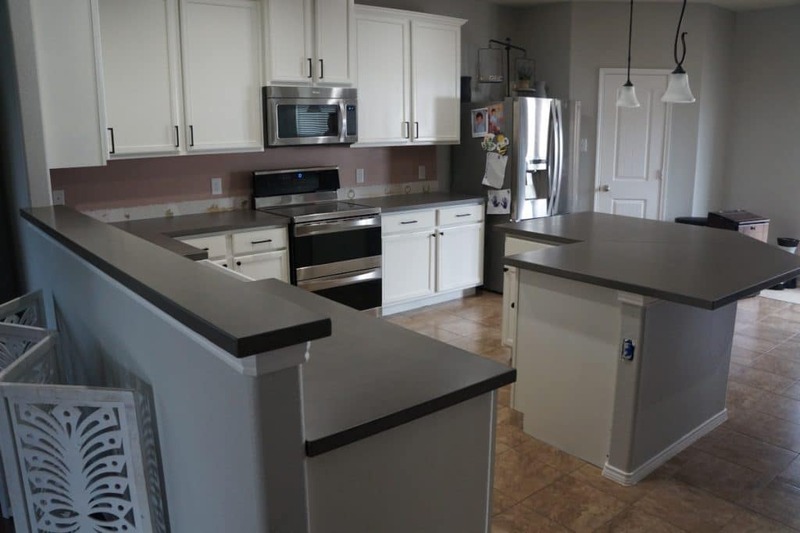 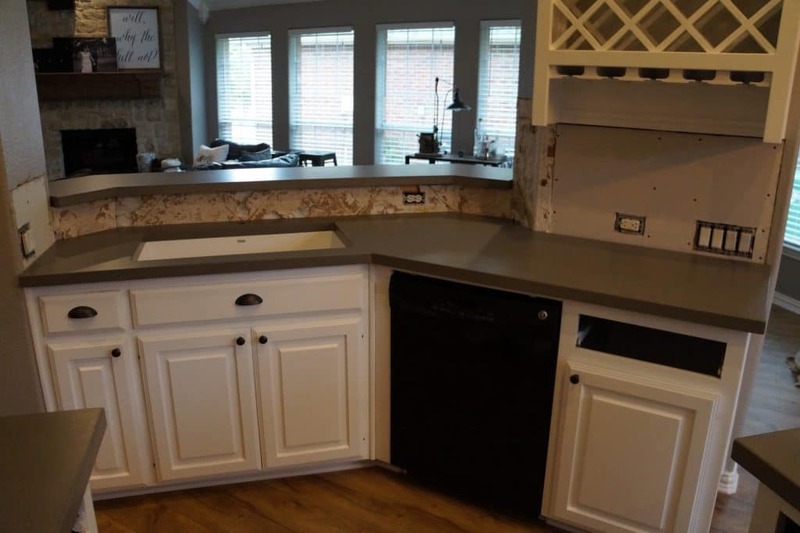 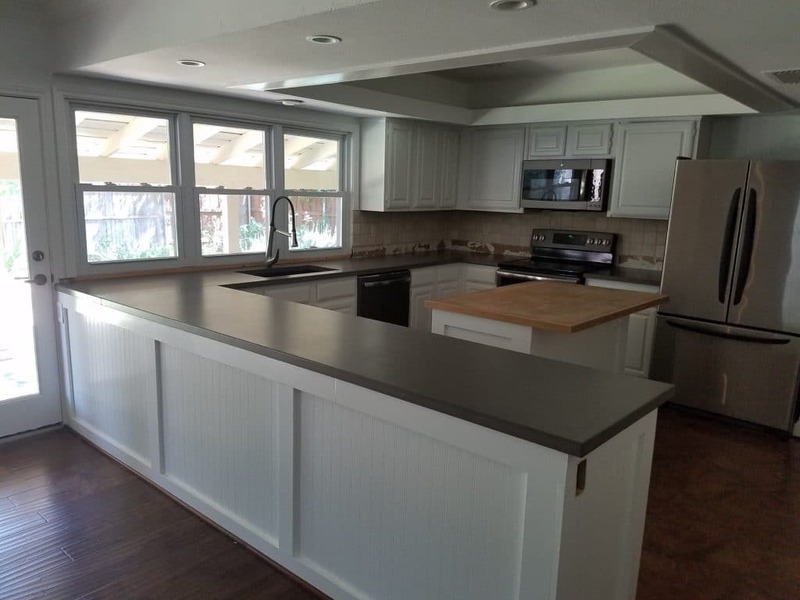 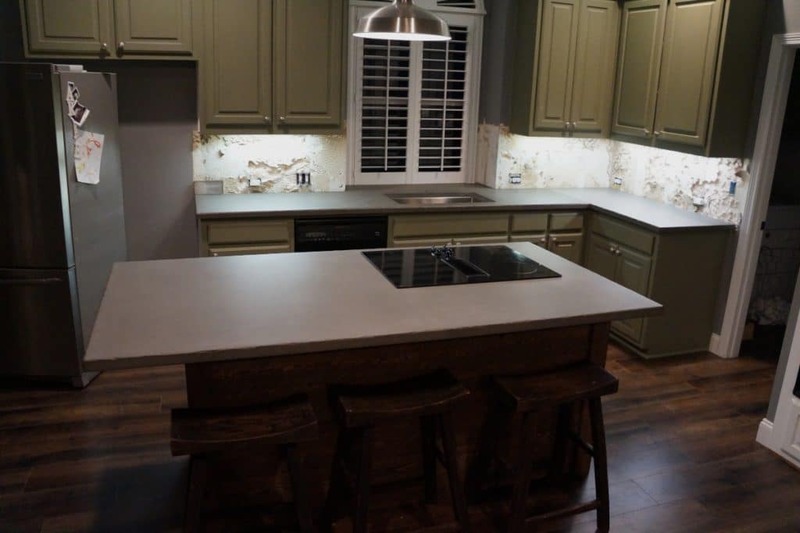 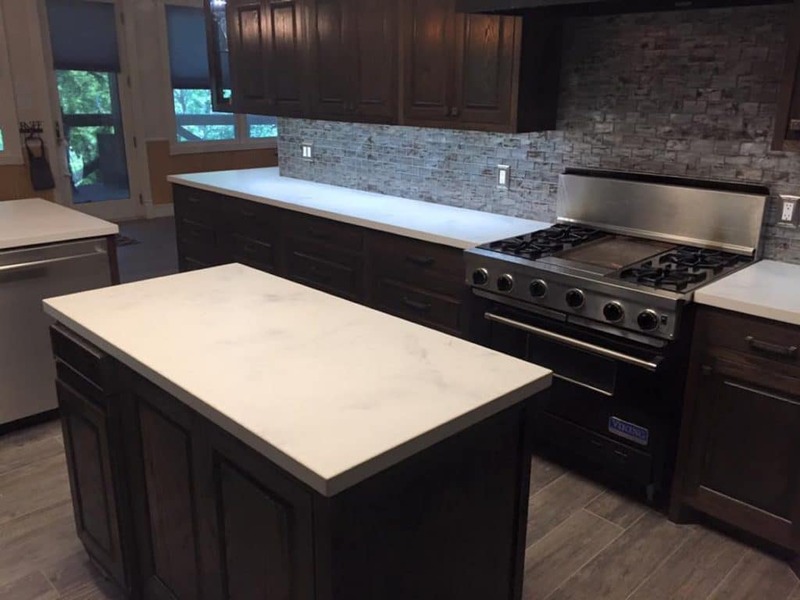 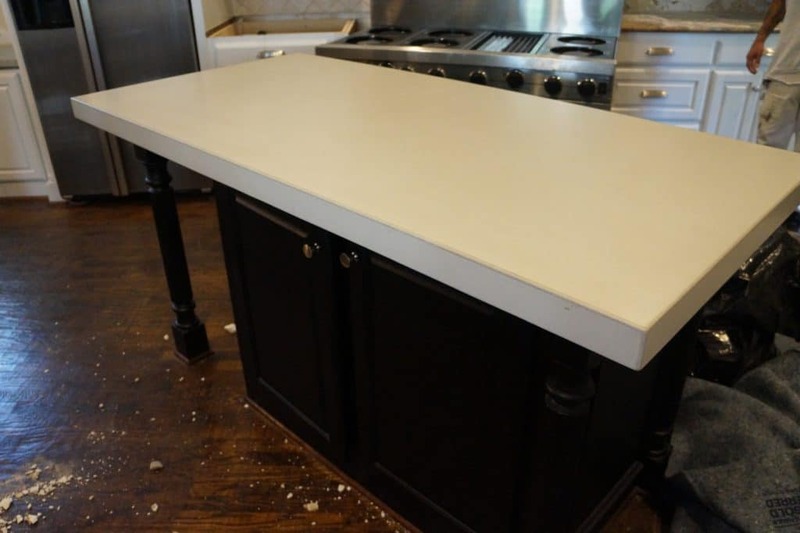 The goal of these countertops was to make them look old and rustic, while still having a high quality look and feel. 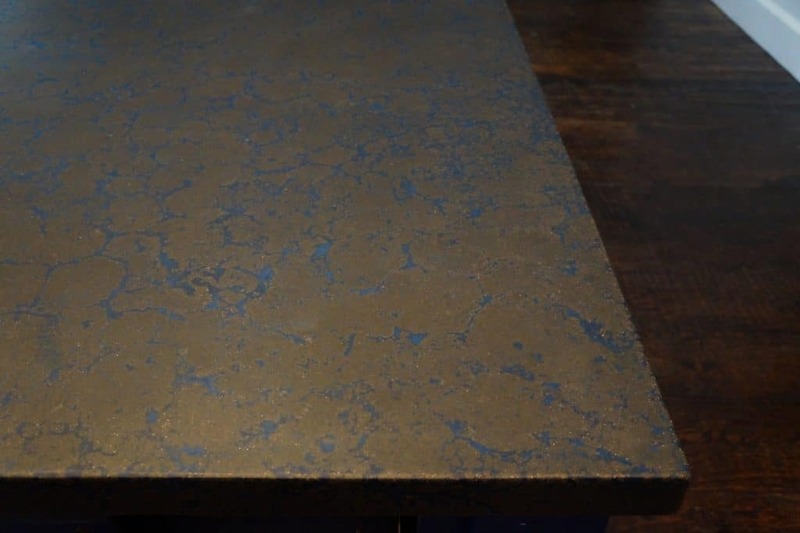 Close up view of our distressed edge. 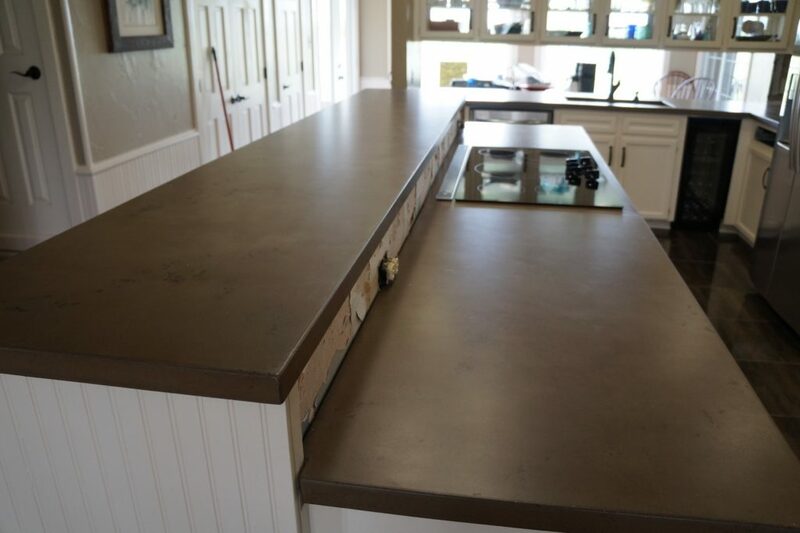 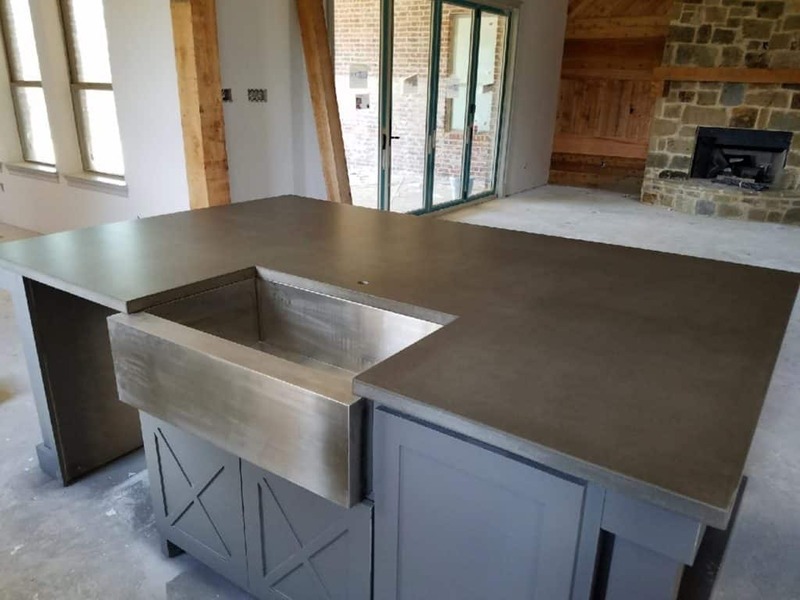 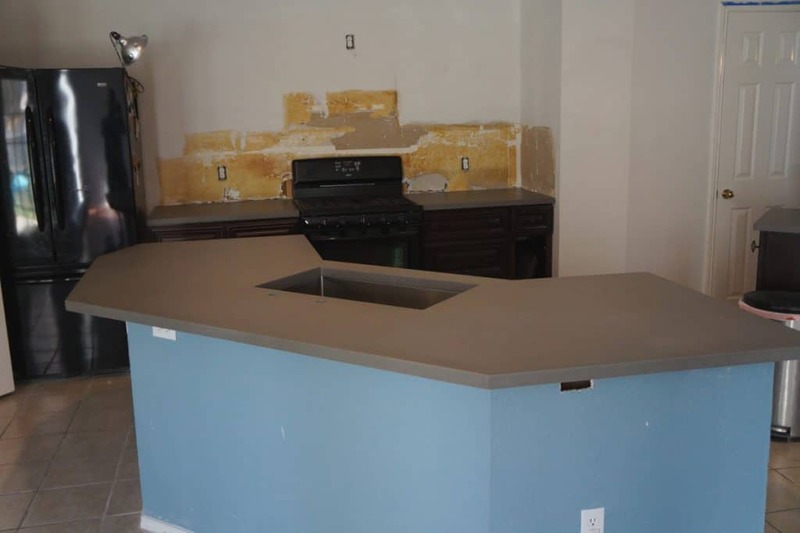 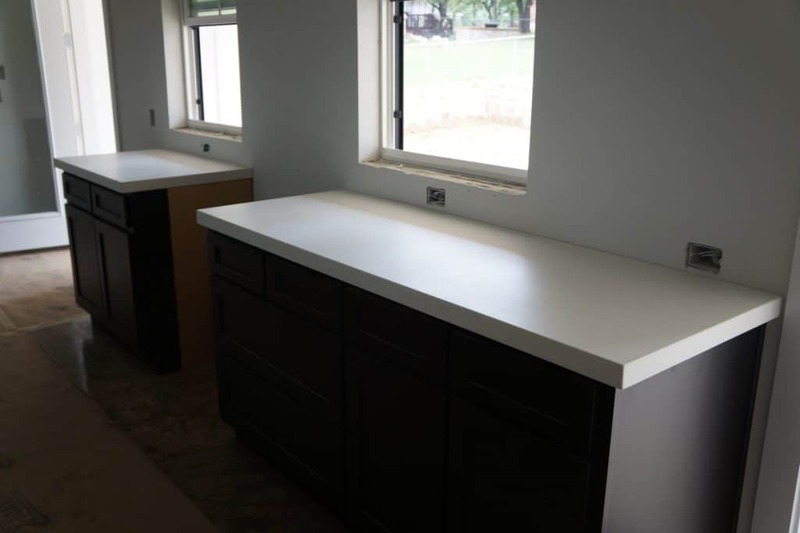 Grey concrete island countertop for a cabin at Bearpen Creek in Royce City, Tx. 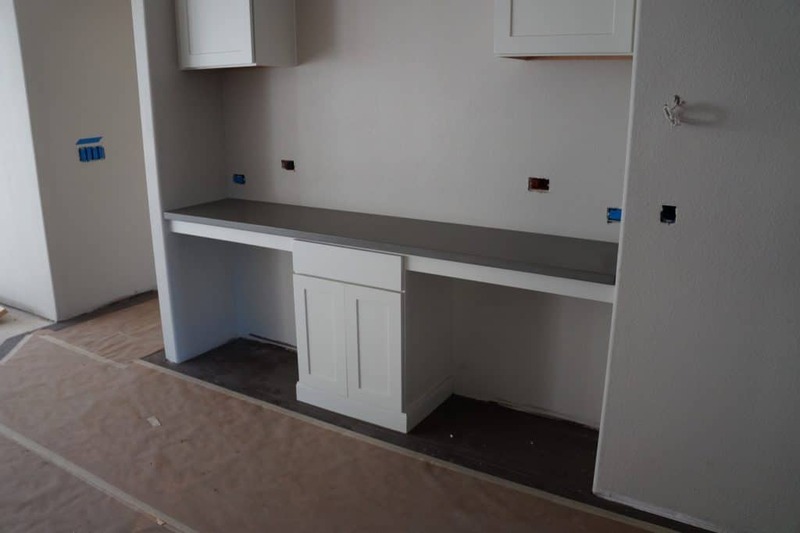 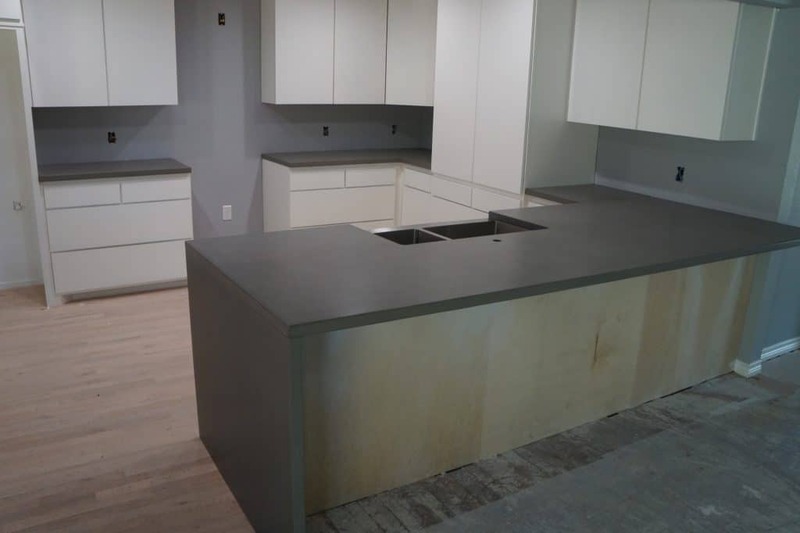 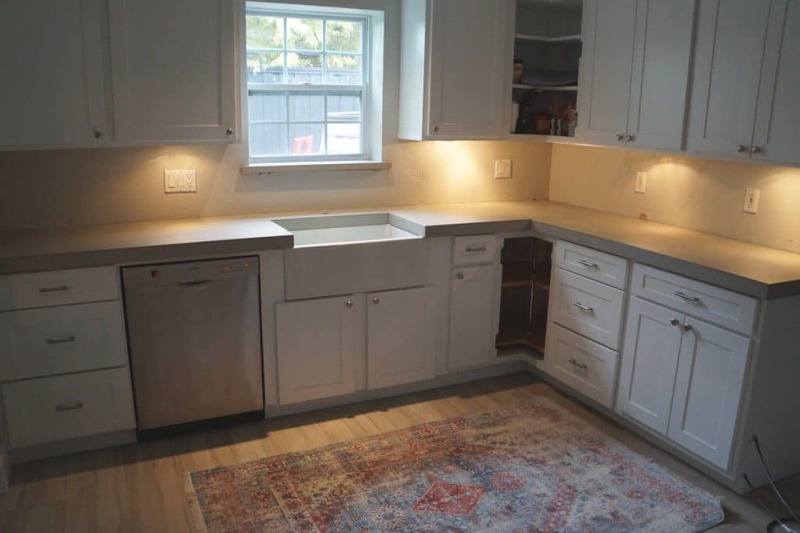 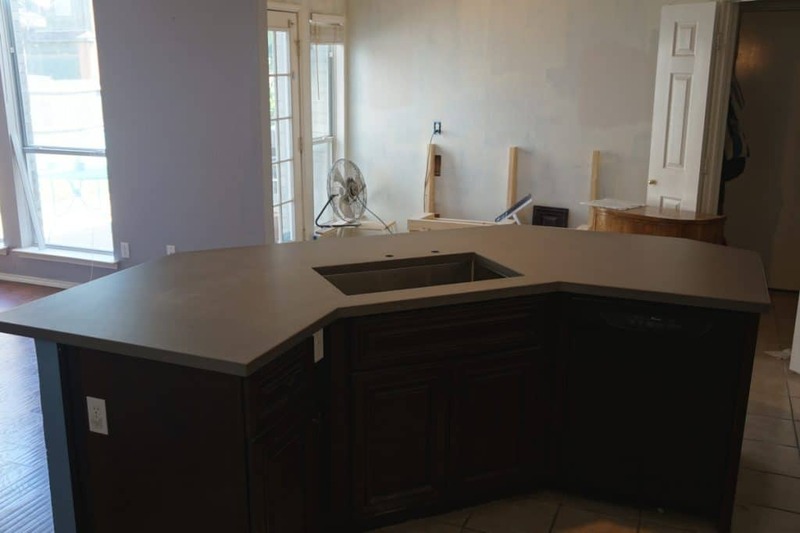 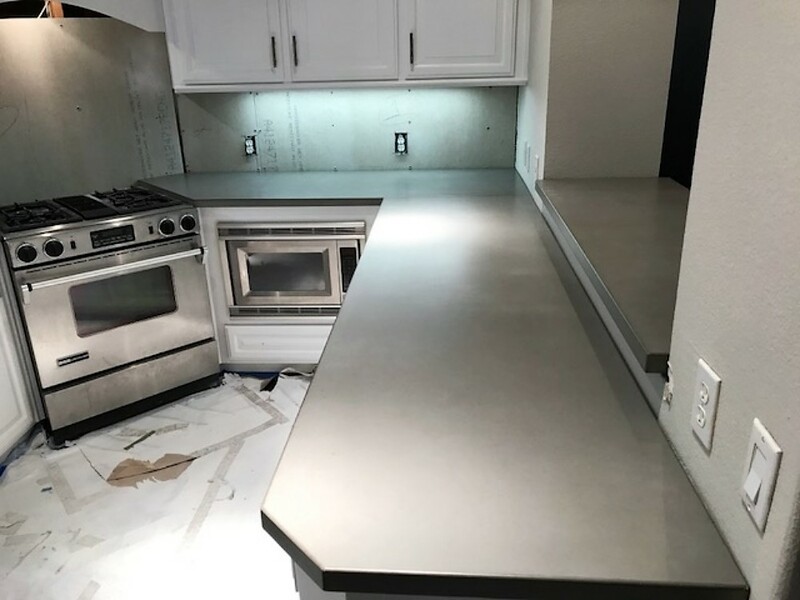 This client had us remove the granite countertop she had to make way for this beautiful grey concrete countertop. 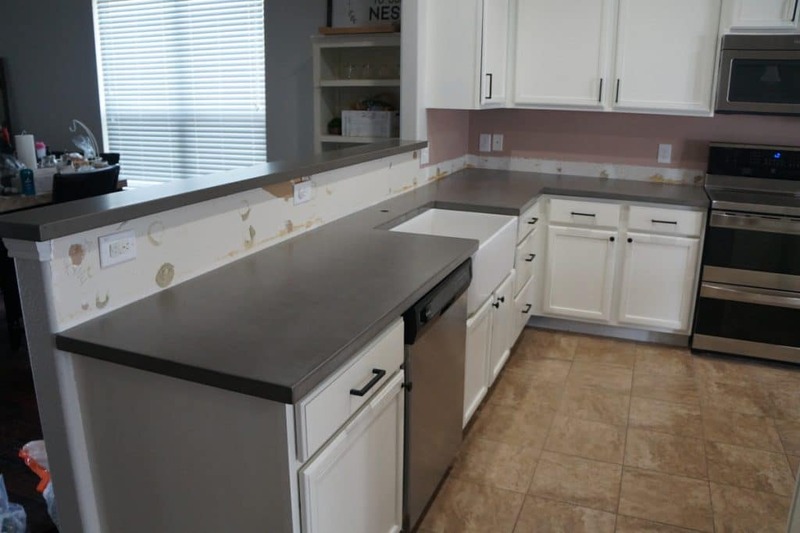 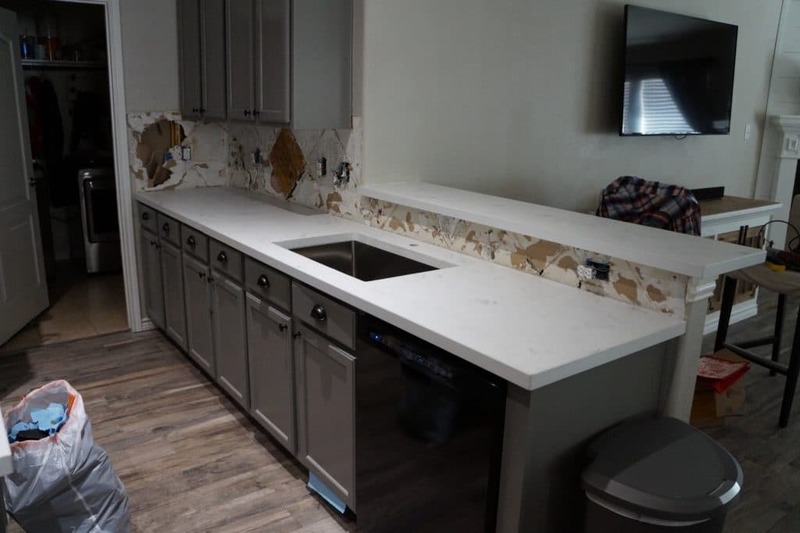 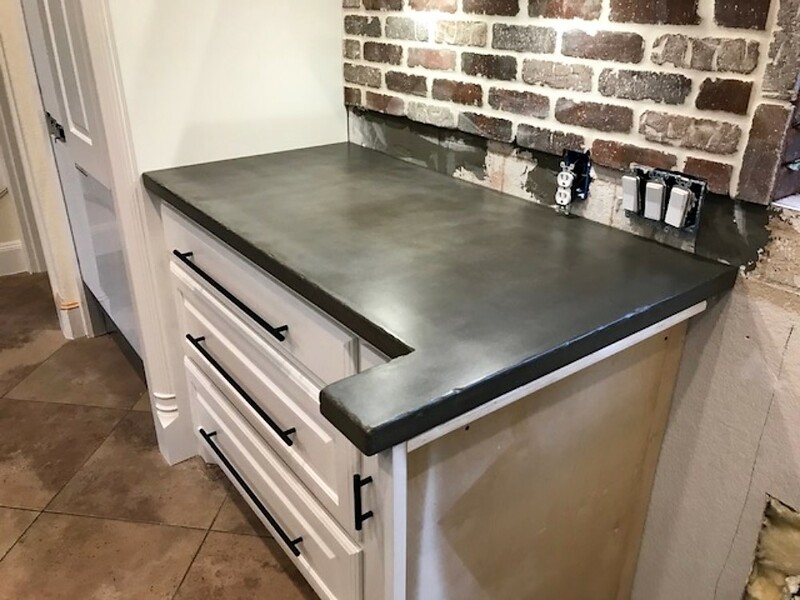 Nice grey concrete countertops is a townhouse in Dallas, Tx. 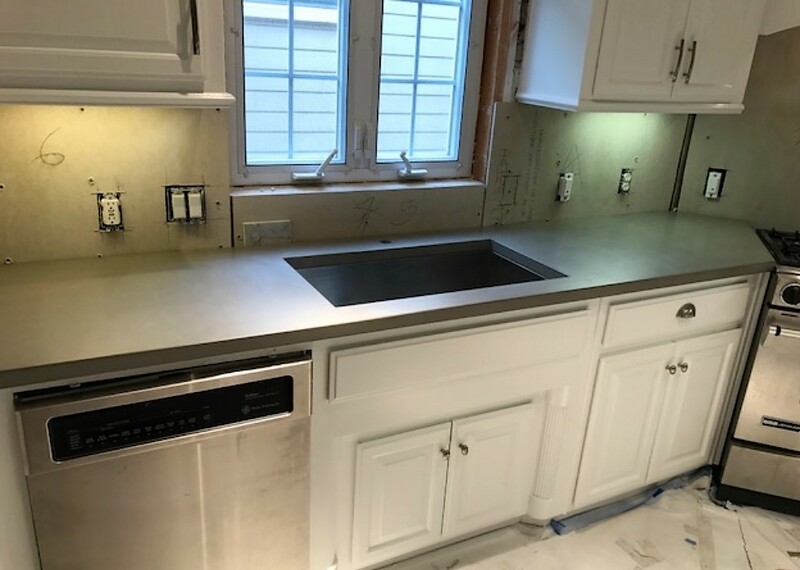 This install proved to be quite challanging as this kitchen was on the second story with very small staircase being the only access point. 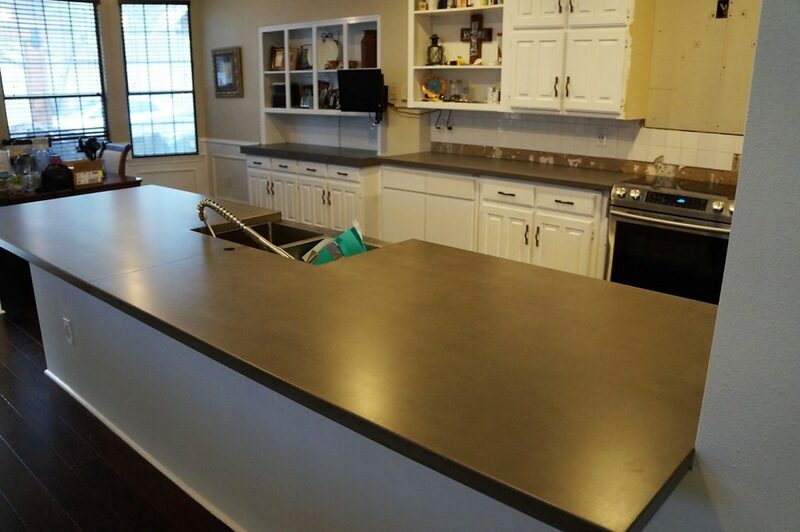 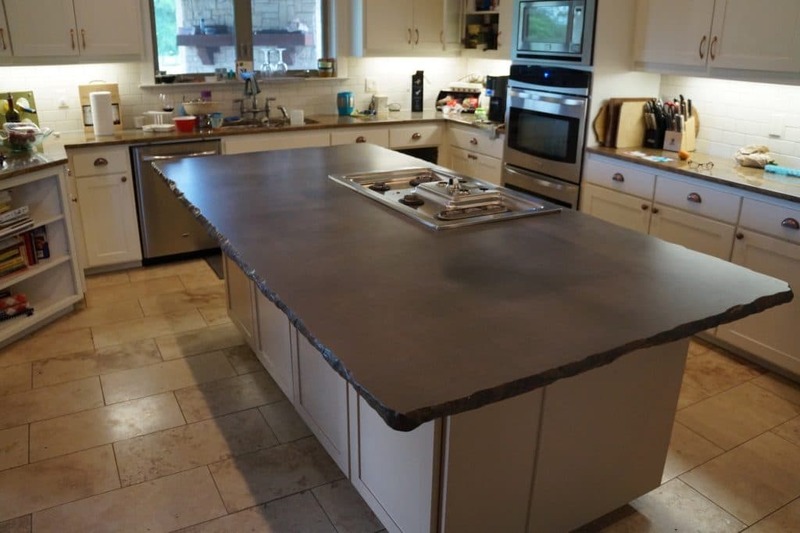 This is a large grey concrete island we installed in a home in Prosper, Tx. 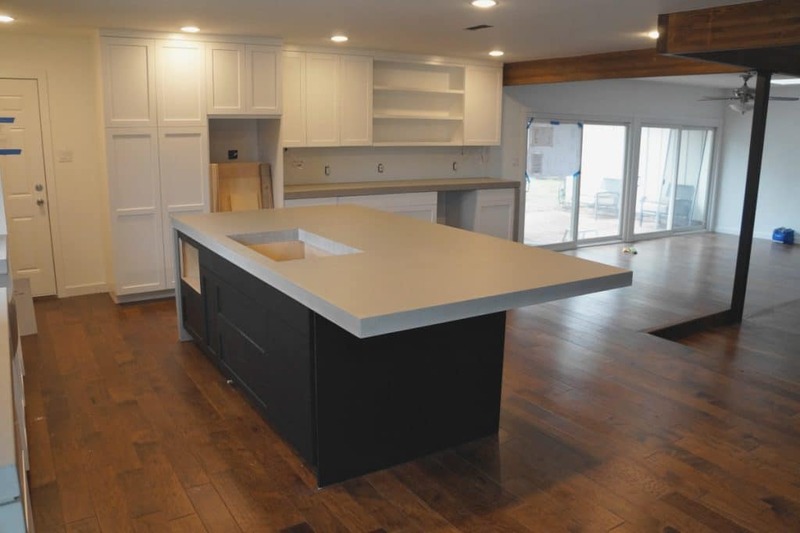 We were brought on to this job by custom home builder Gary Camp. 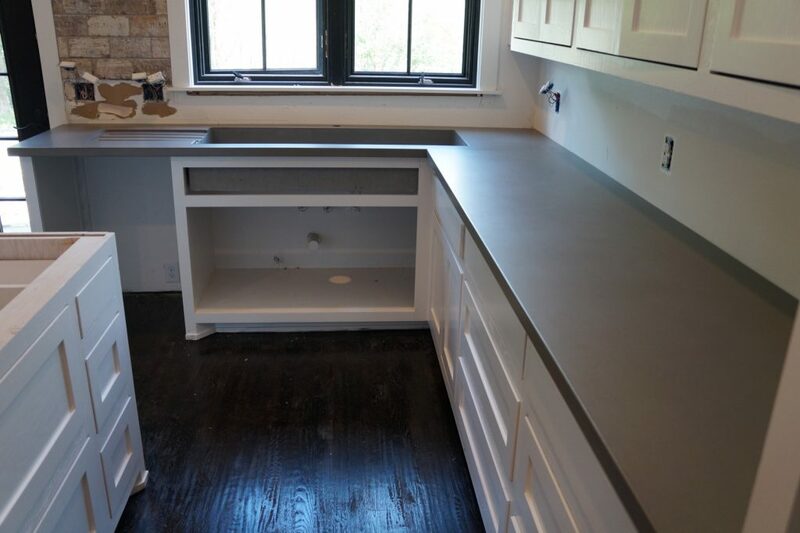 Grey concrete countertops looking great with the white cabinets and black accents. 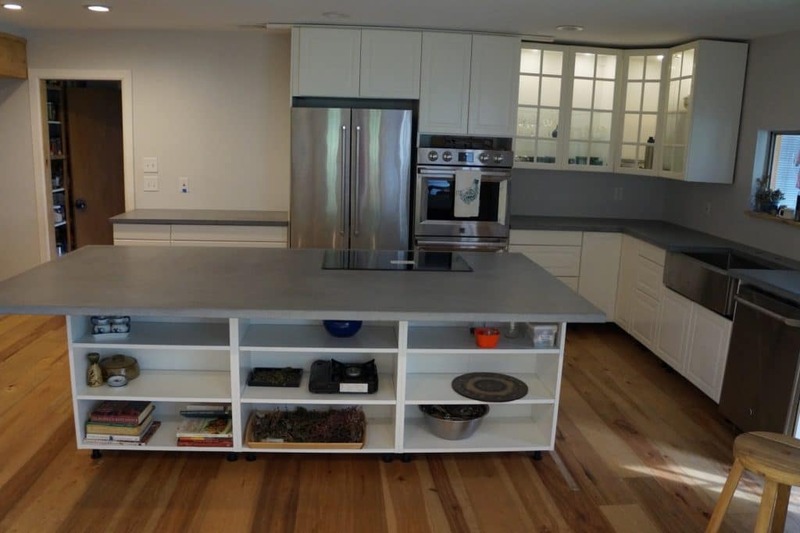 This is a beautiful thick white concrete island with waterfall panels on eachside. 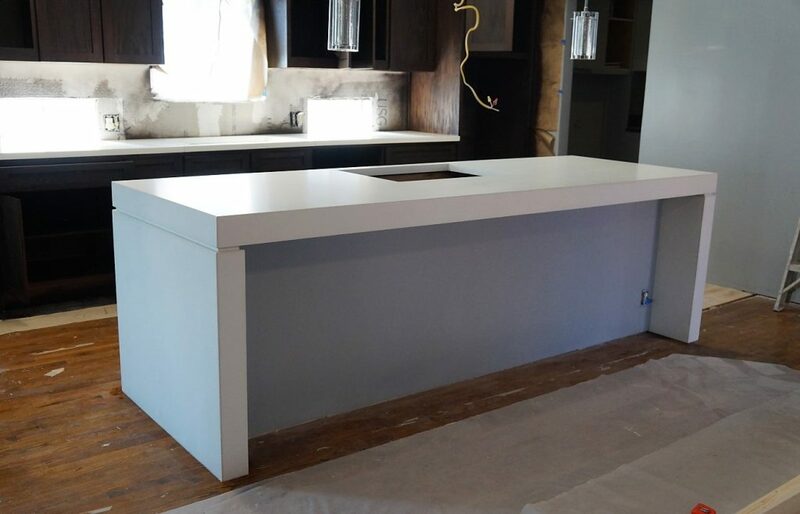 The client knew there would be a seam between the countertop and the waterfall panel, so he decided we should turn the seam into an accent. 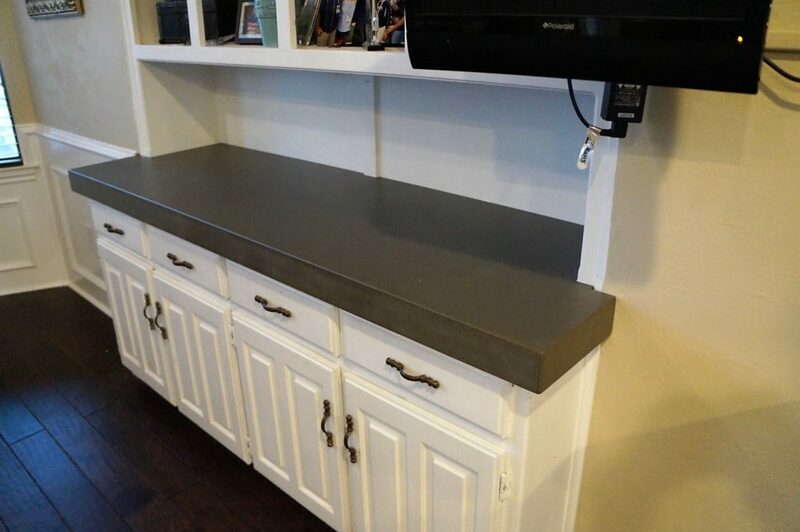 Old countertop hung over to create a bar, but it intruded into the dining room. 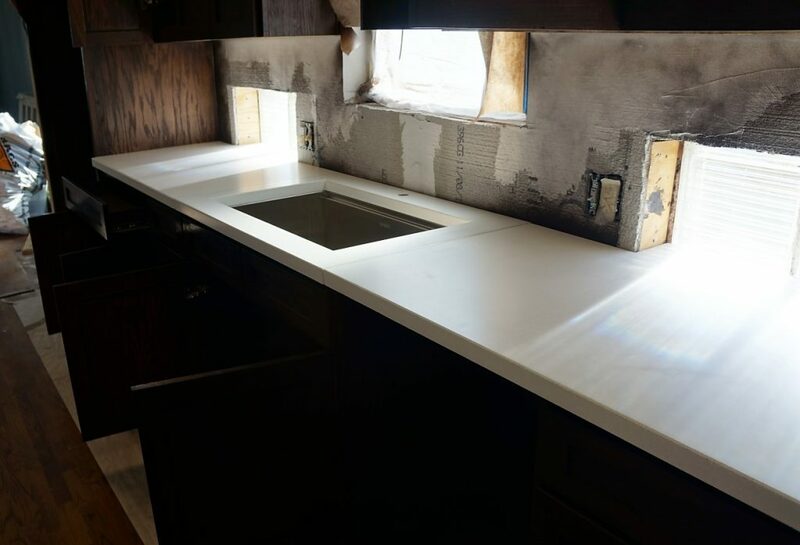 Now it's a nice clean looking pass through. 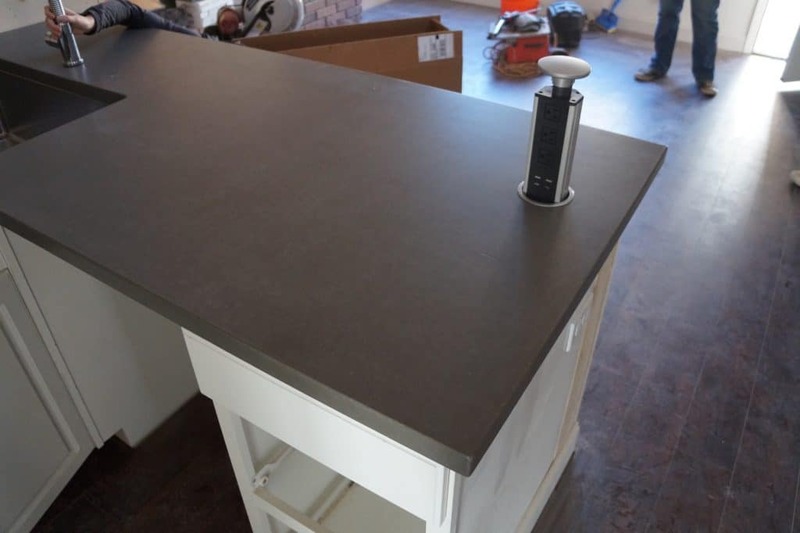 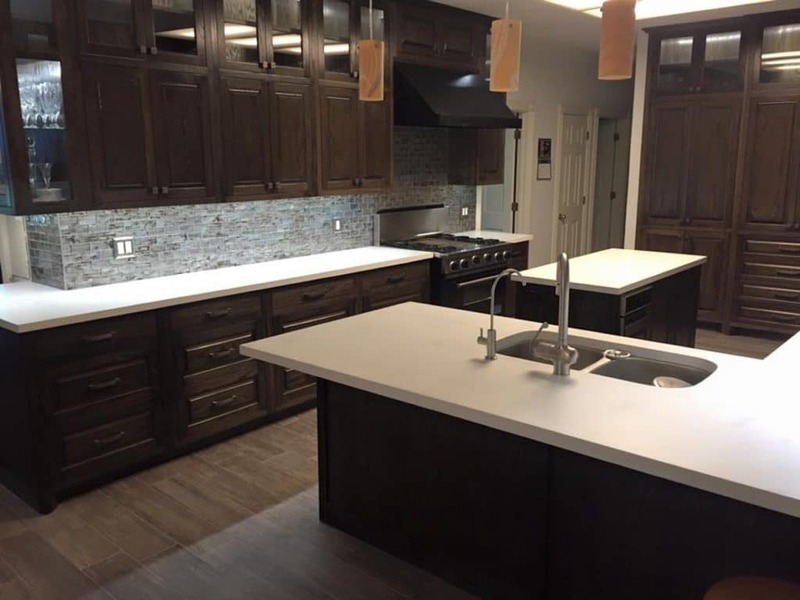 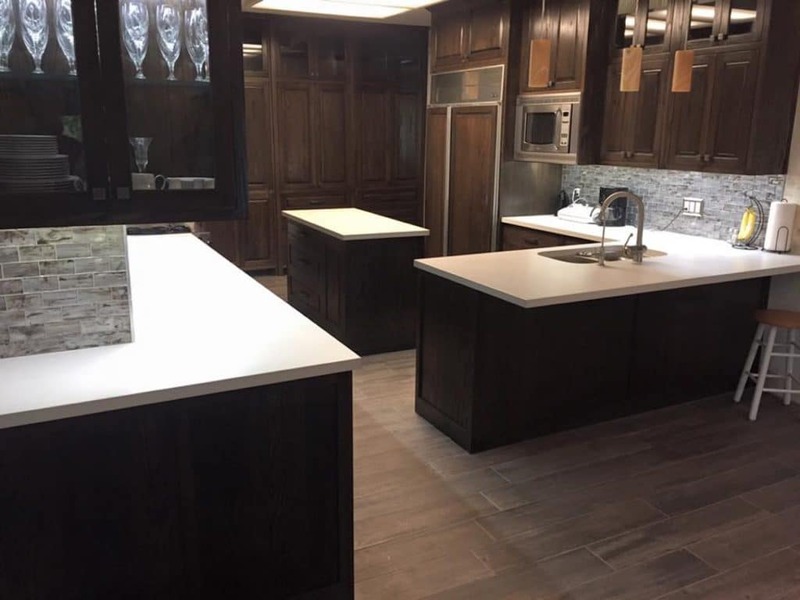 Brown with dark Brown fill, Kitchen Countertops installed in Ponder, Texas. 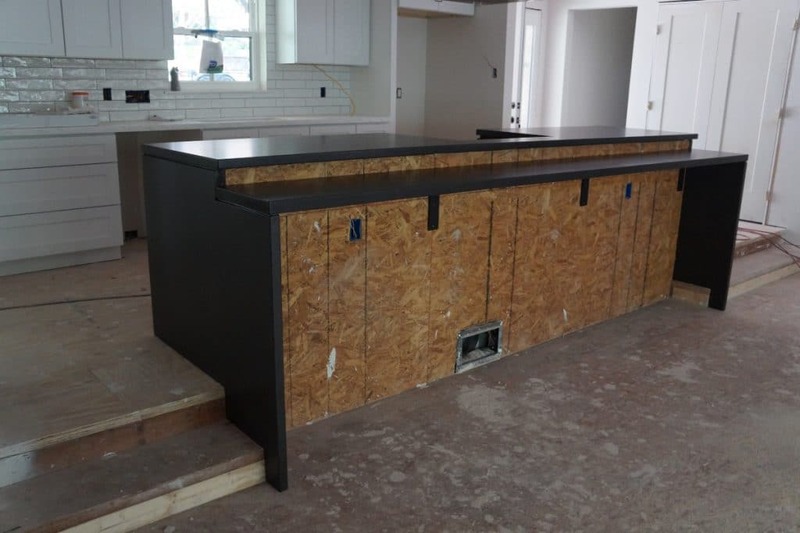 The home owner and her mother were right in there helping the guys with the install. 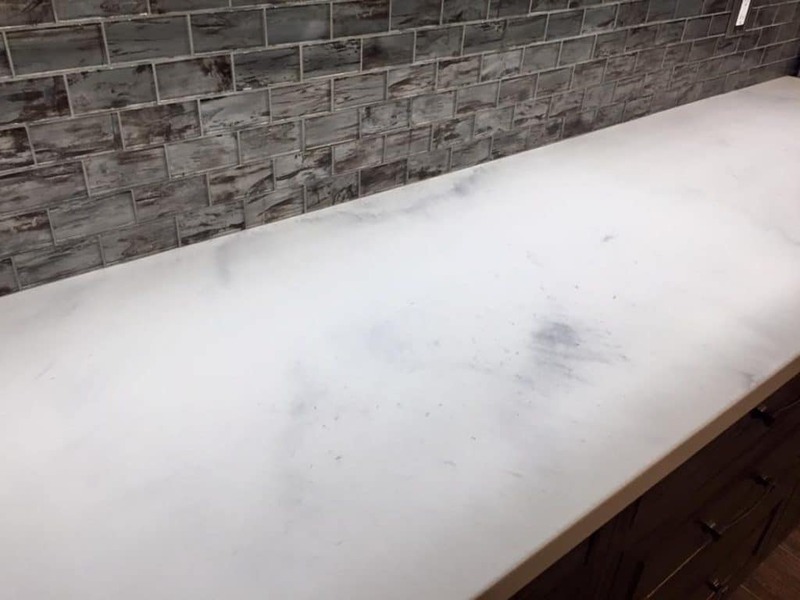 It was a lot of fun. 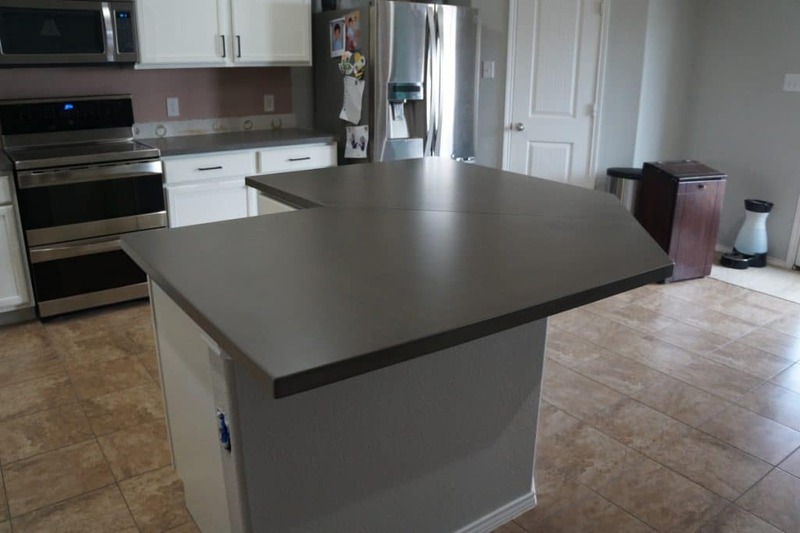 Brown with dark Brown fill, Kitchen Countertops installed in Ponder, Texas. 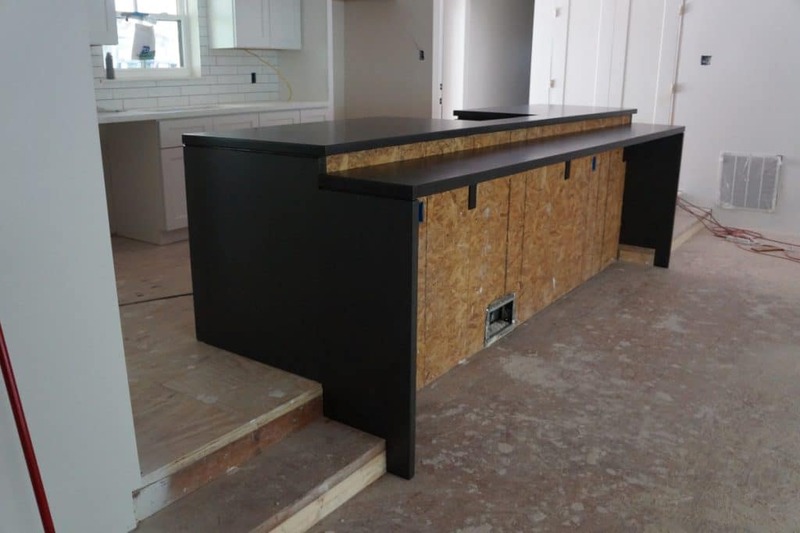 Ten foot bar top, perfect for bar top dancing. 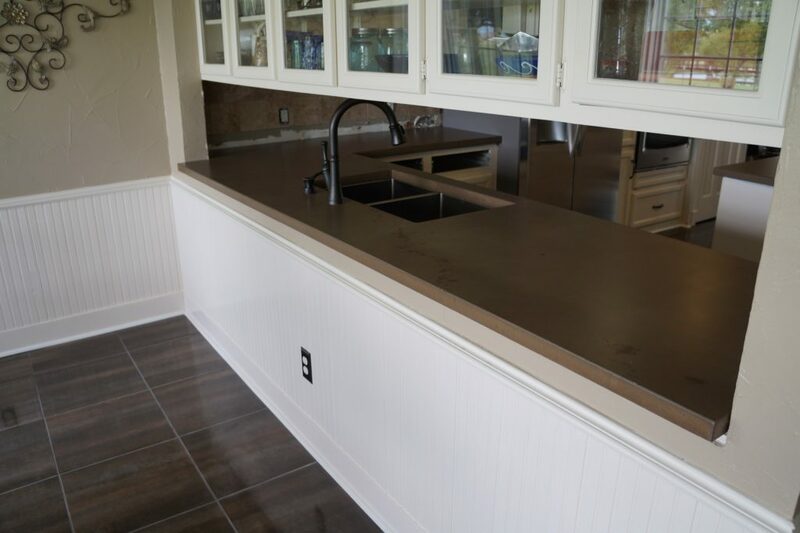 Brown with dark Brown fill, Kitchen Countertops with cooktop and pop-up down draft installed. 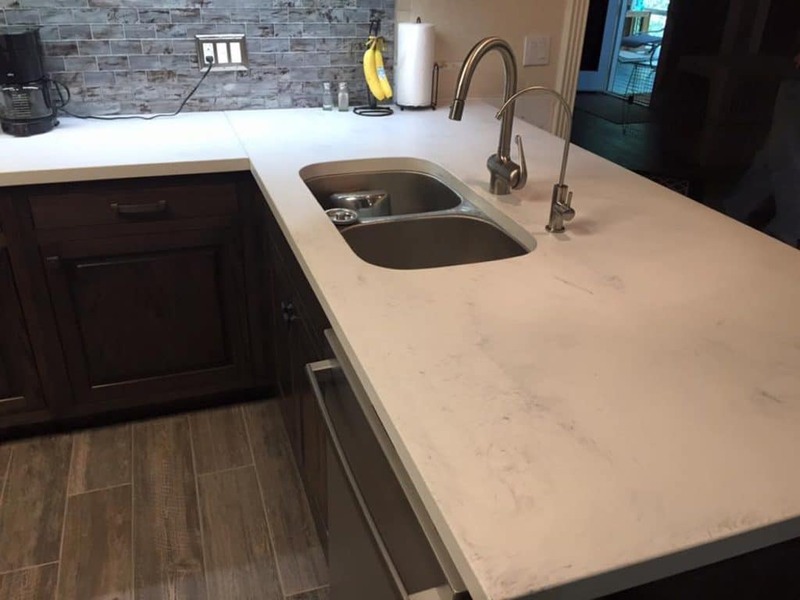 Our sink openings are formed not cut by a computer controlled saws like granite and quartz. 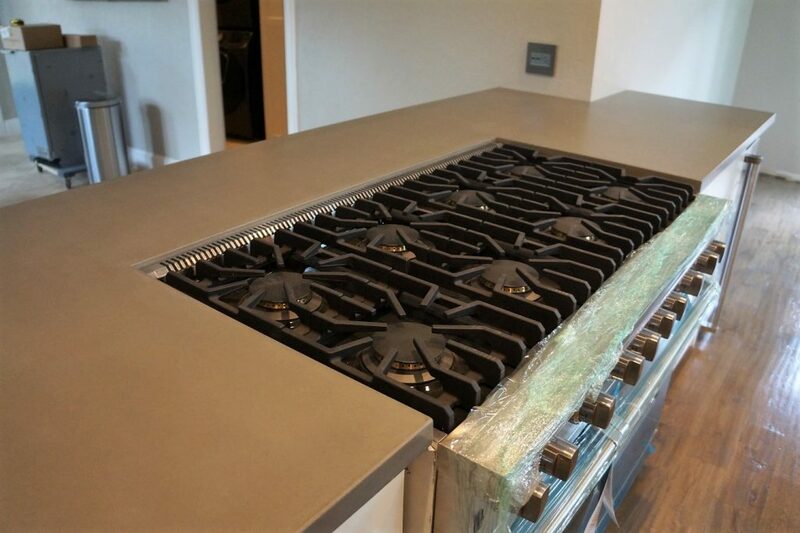 It takes a skilled craftsman to form an opening this precise and we have them. 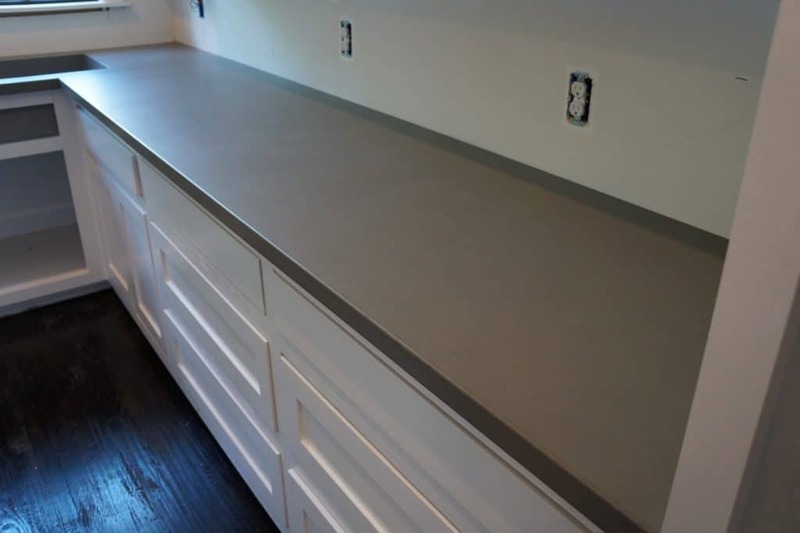 We try to keep seam to a minimum, but when they're needed we keep them tight and fill them with color matched silicone. 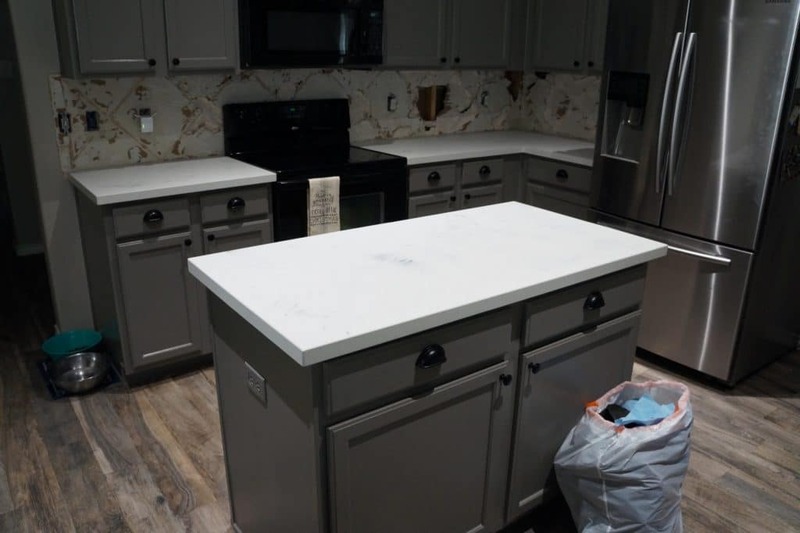 White Marble look concrete countertops. 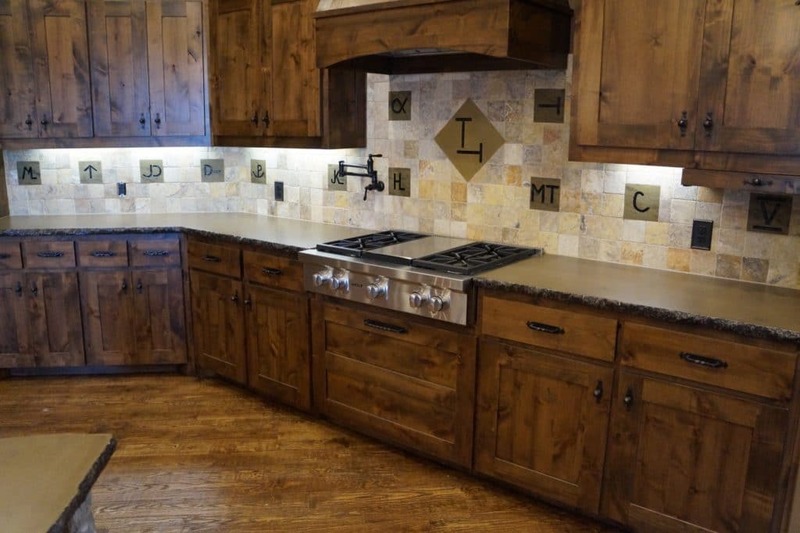 Love that backsplash! 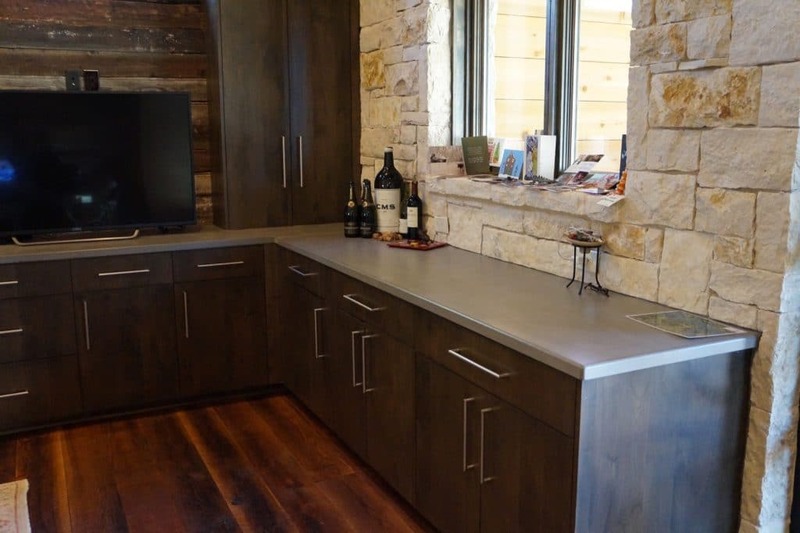 Ebony stained oak cabinets look great with out white concrete countertops. 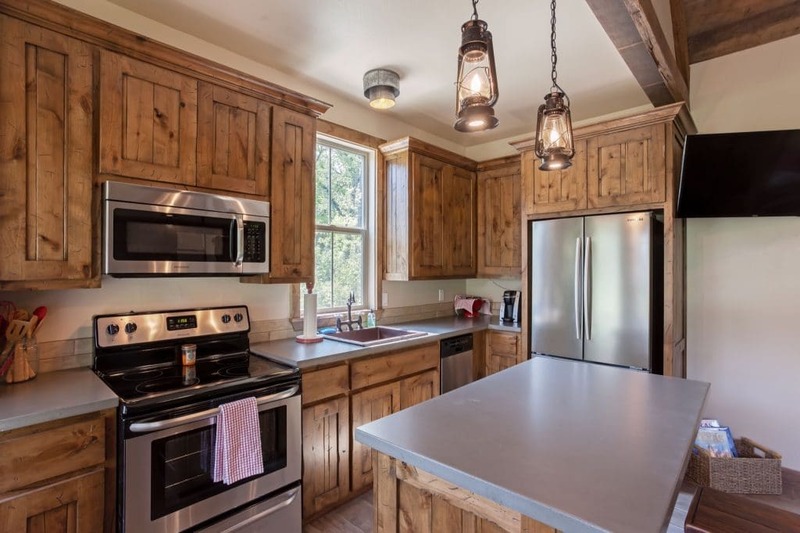 Is it modern or is it rustic? 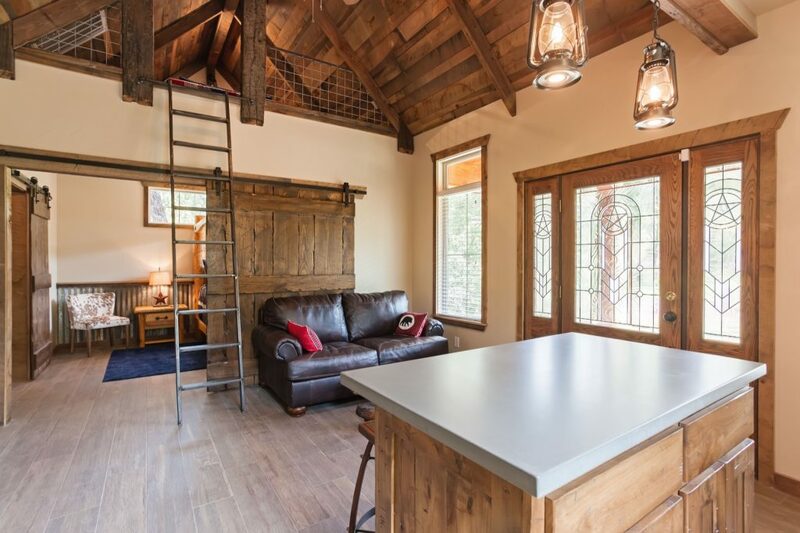 Let's call it modern rustic. 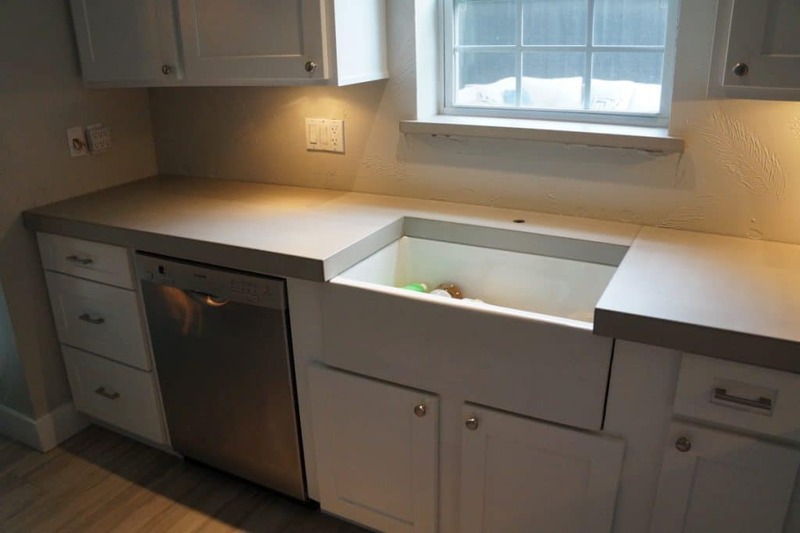 We refer to this job as the small kitchen with the big sink. 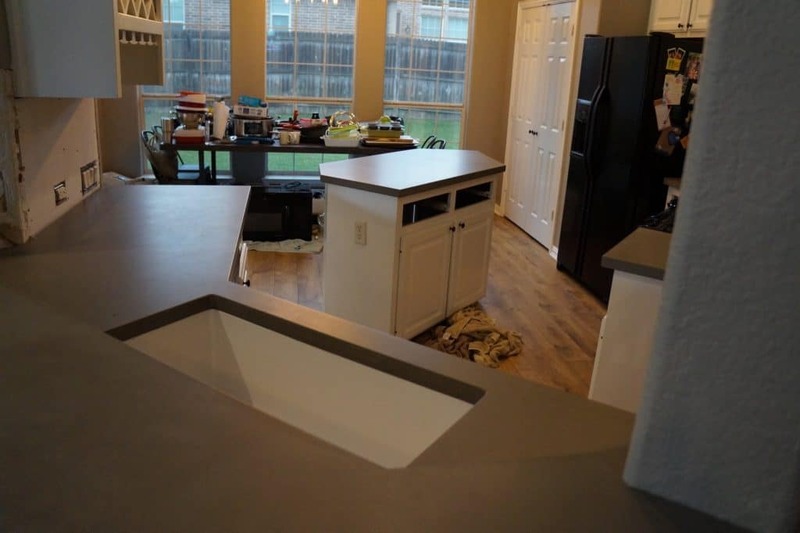 It was installed in a home in McKinney, Texas. 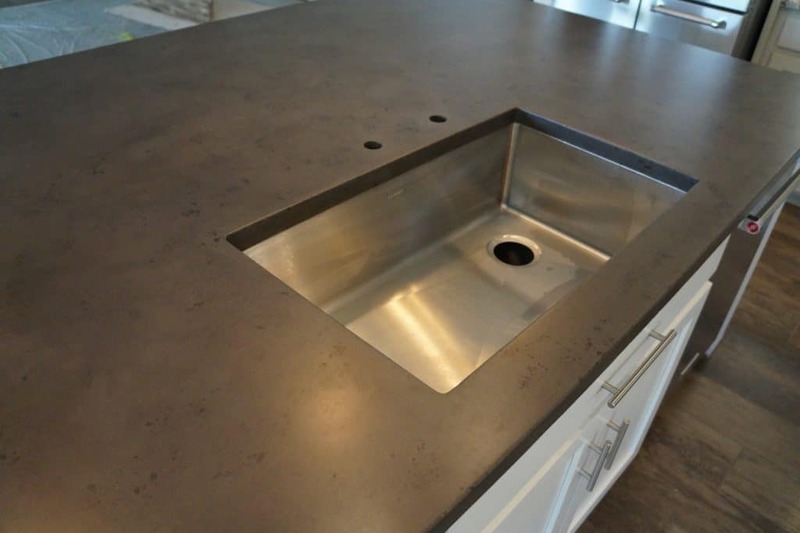 Grey concrete countertops are all the rage right now and here's why. 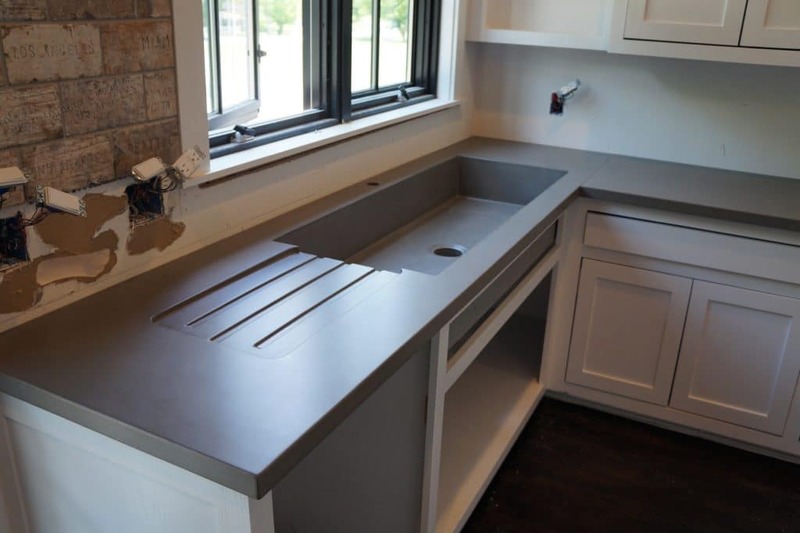 And here's the big sink with an integral drain board that doubles a cutting board holder. 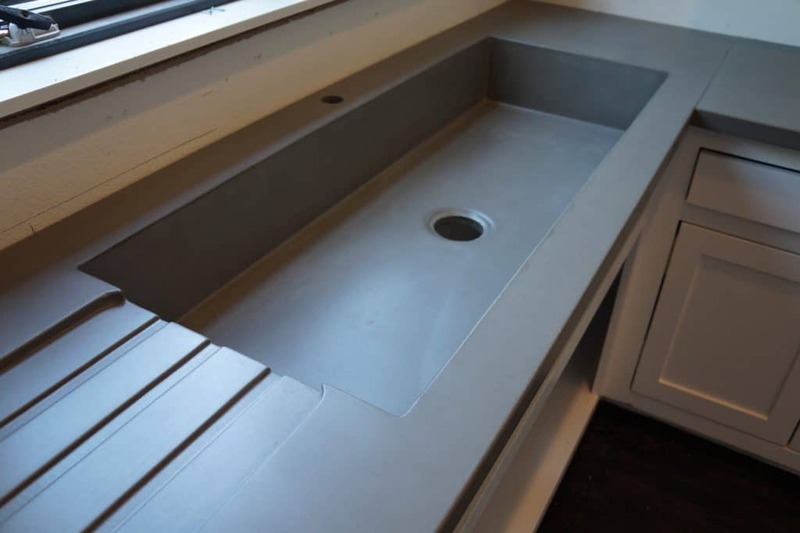 Drain board has a slight slope to the sink to ensure water goes where it's supposed to. 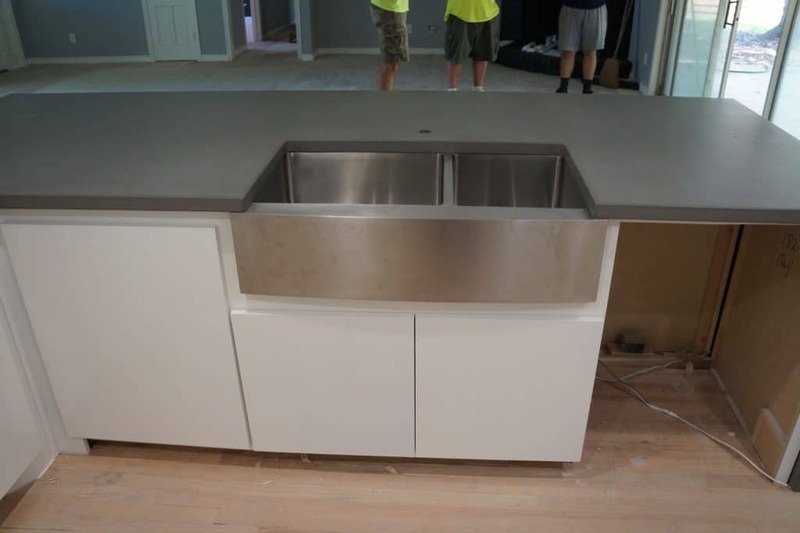 This was a beast to install. 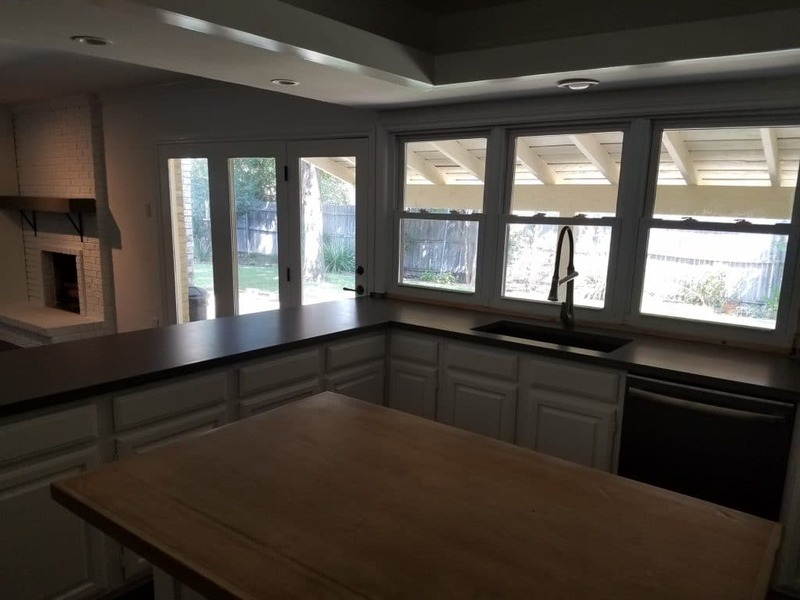 Notice we had to remove the window trim and it still took us multiple tries to get just the right angle so it would go into the hole. 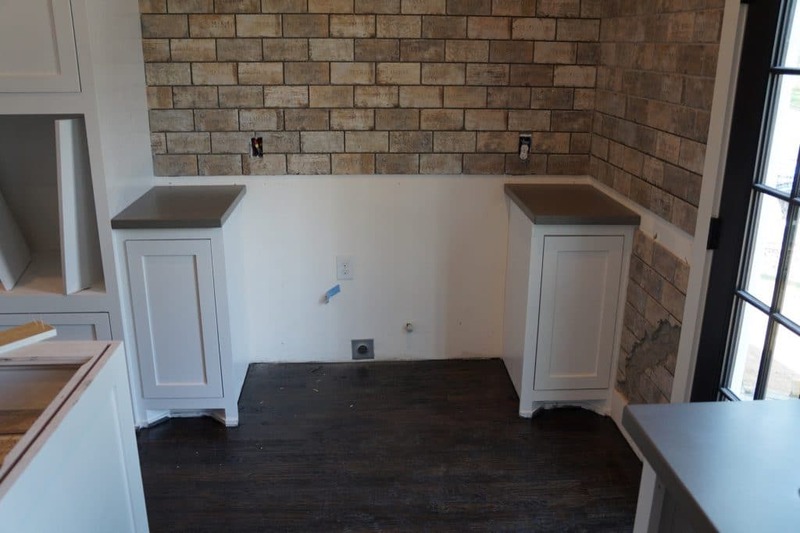 Betting the plumber had a few choice words for us when he had to install the faucet. 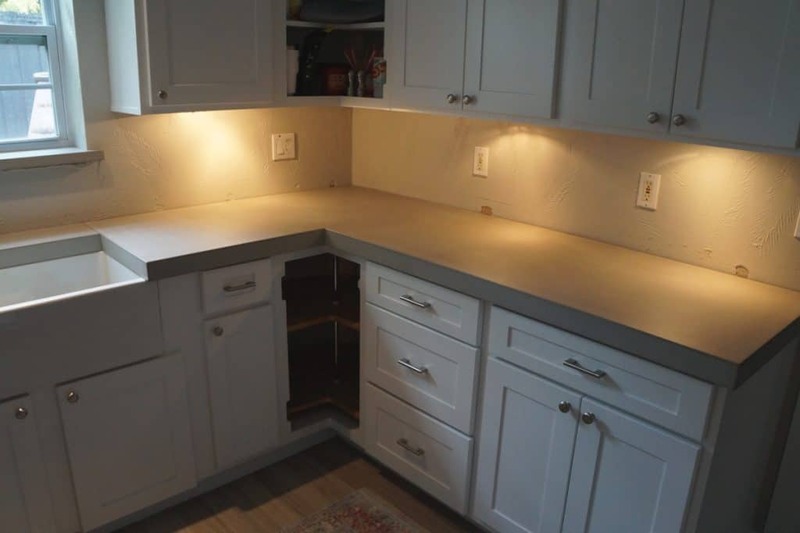 It was tight back there. 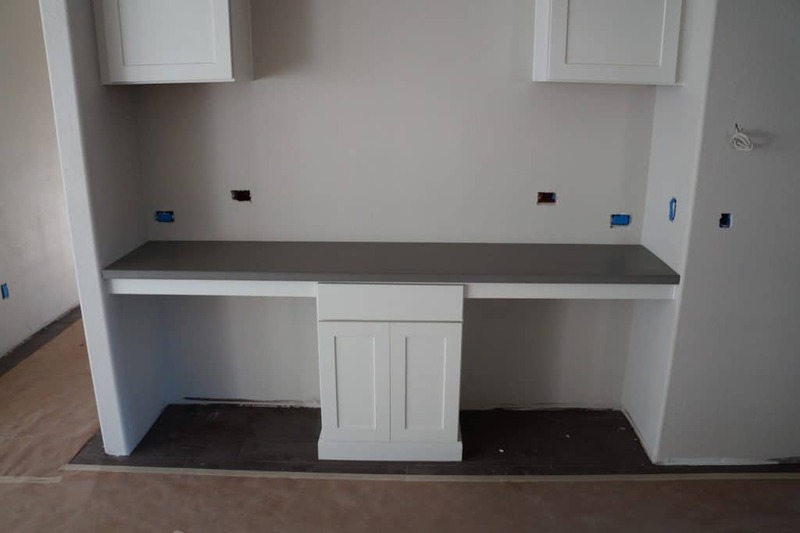 Oh yeah, here's two little pieces of countertop on each side of where the stove will be. 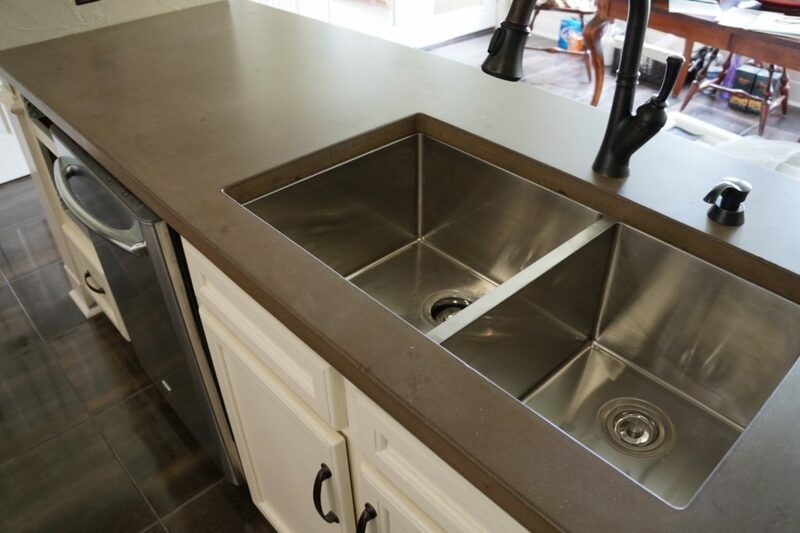 We needed some easy to install pieces after that sink. 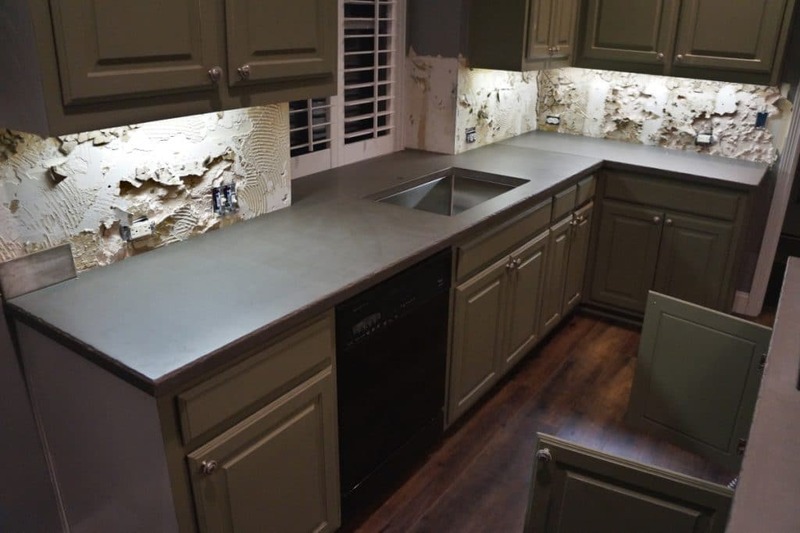 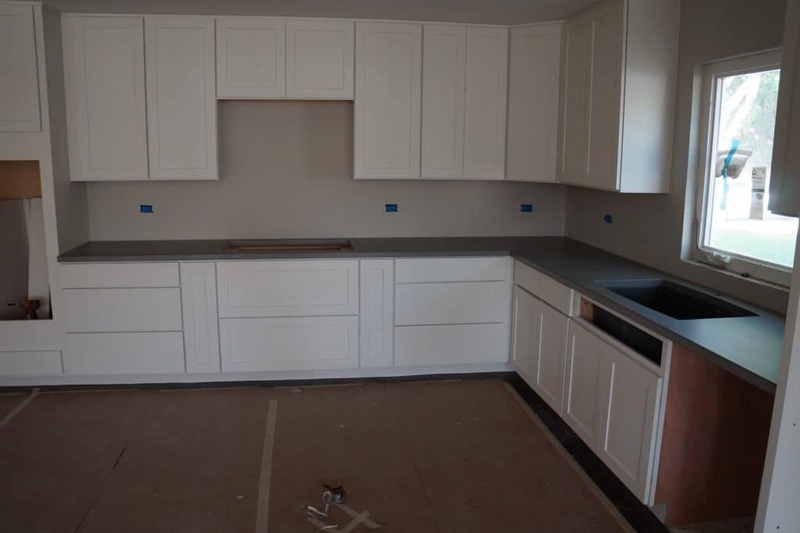 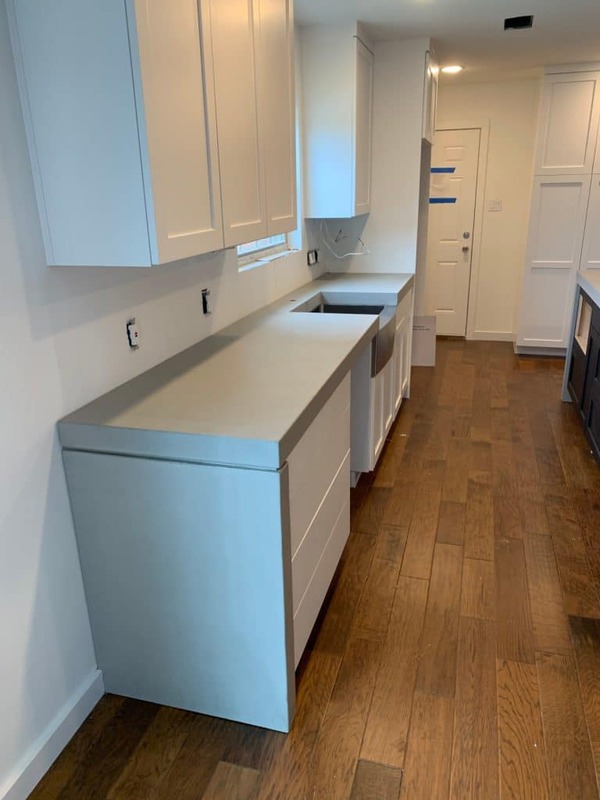 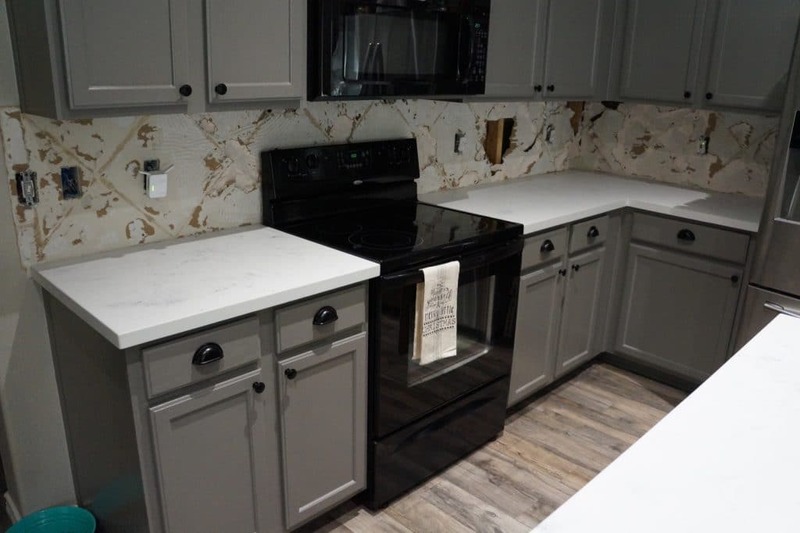 Gray Kitchen Countertops installed in Dallas, Texas. 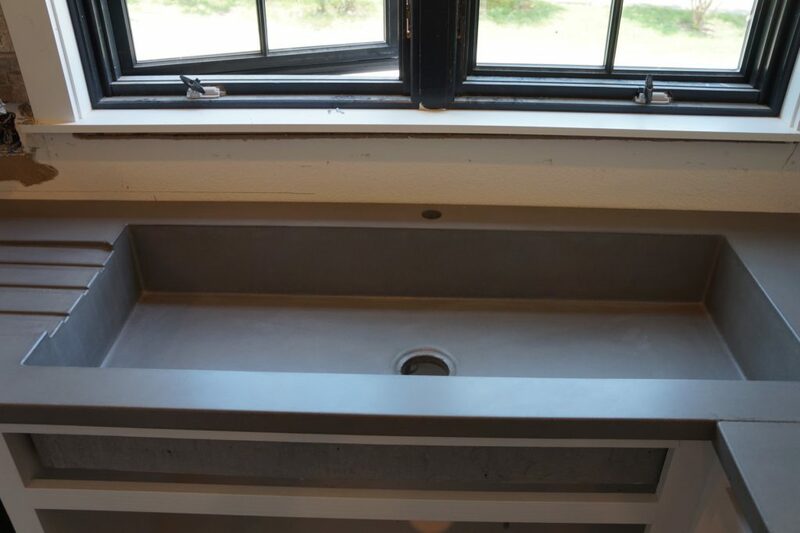 Note the window sill is concrete. 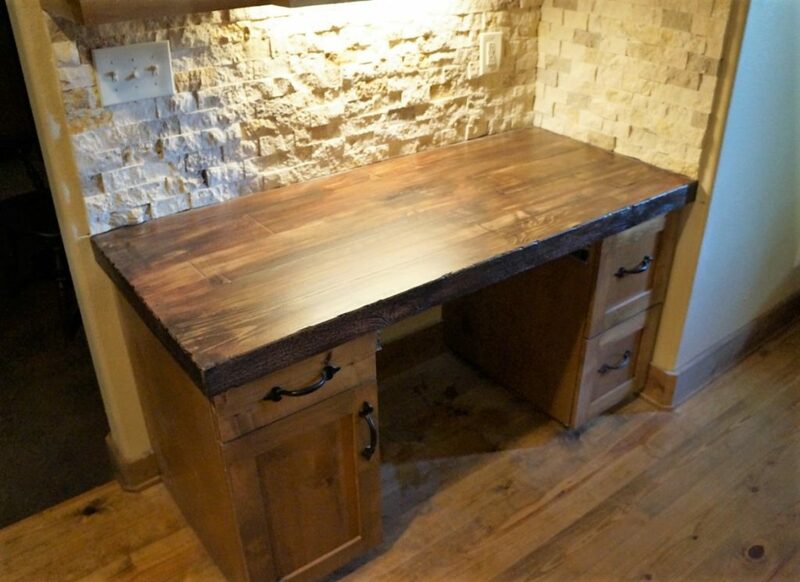 Concrete makes a great desk top. 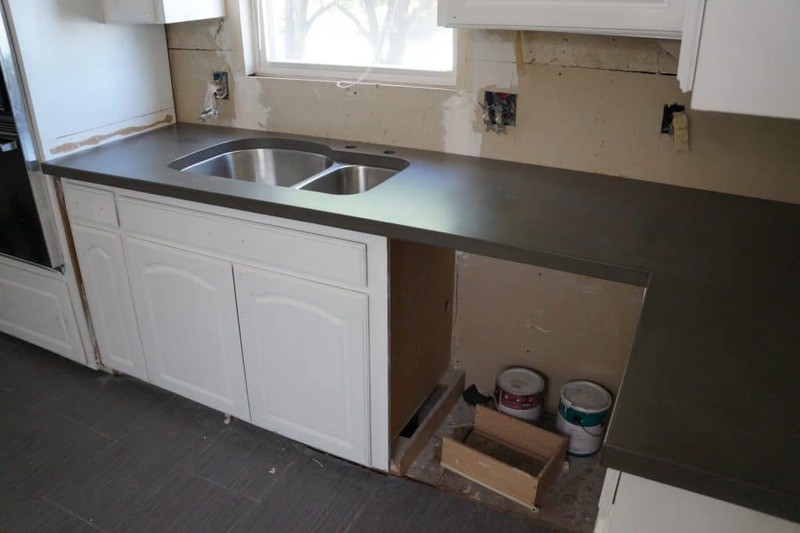 Notice the black composite sink. 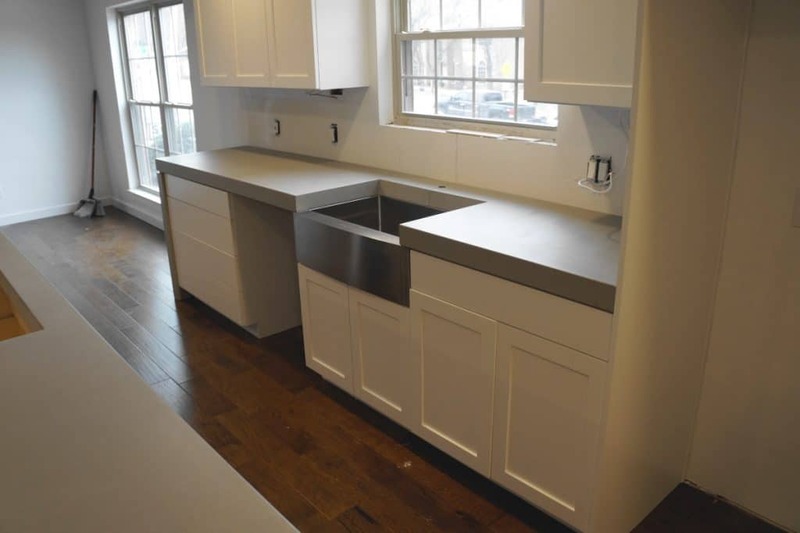 They're a tight fit in standard kitchen cabinets, but give lots of sink space. 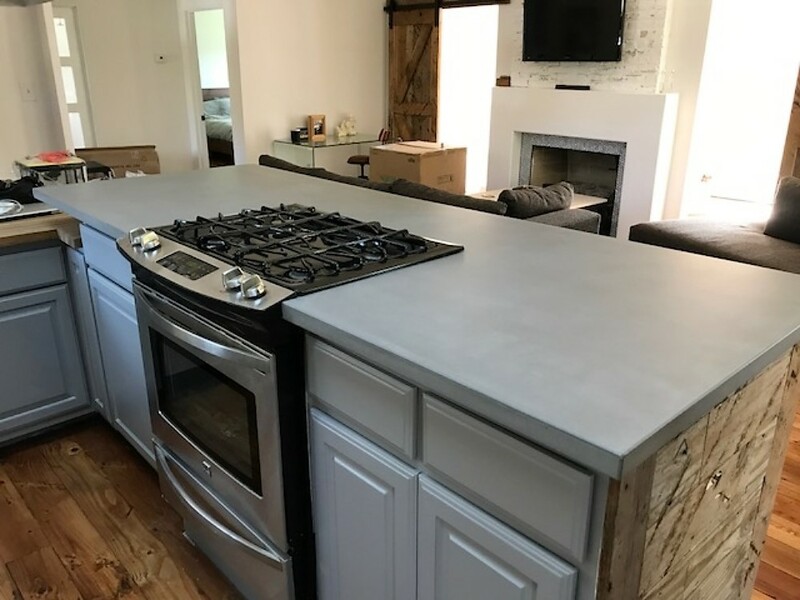 How bout that island? 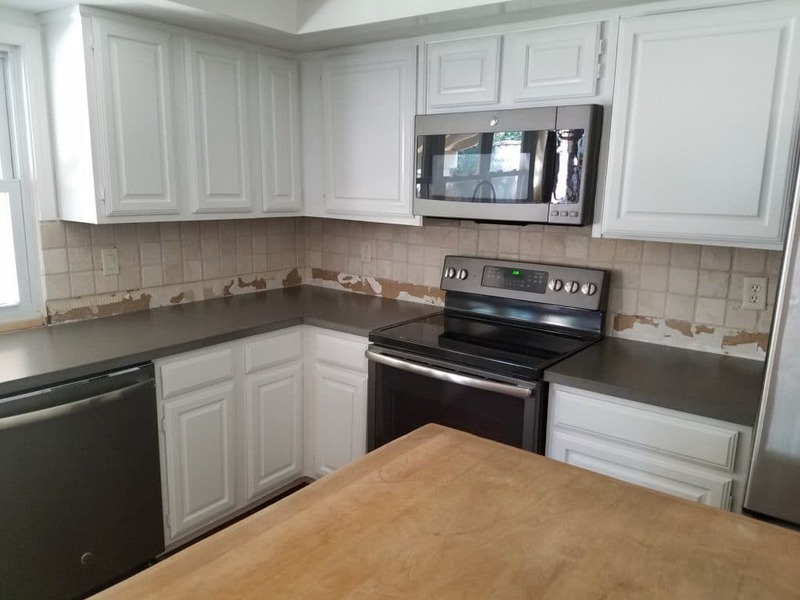 Not sure what shape has six unequal sides. 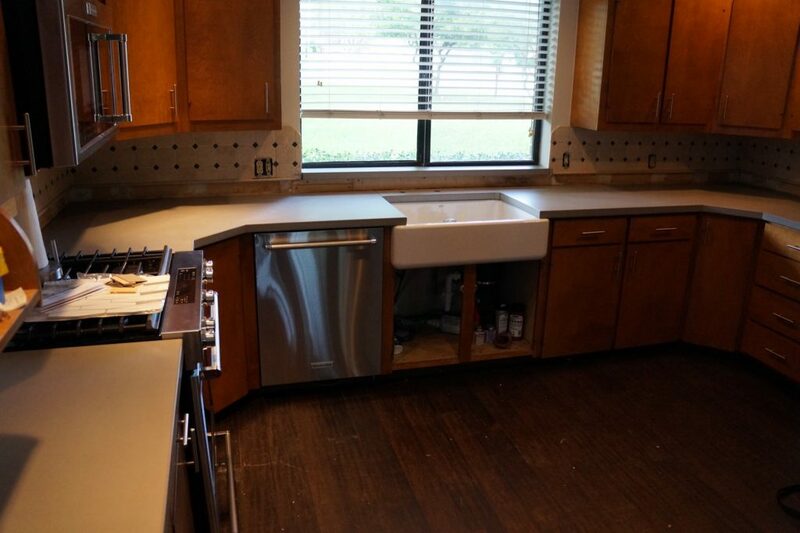 This little kitchen in Denton, Texas has some of the oddest angles of any kitchen we've ever done. 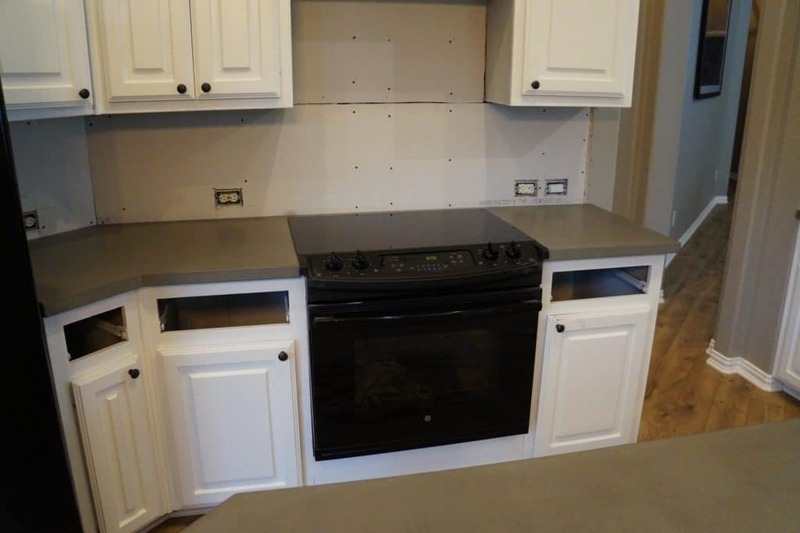 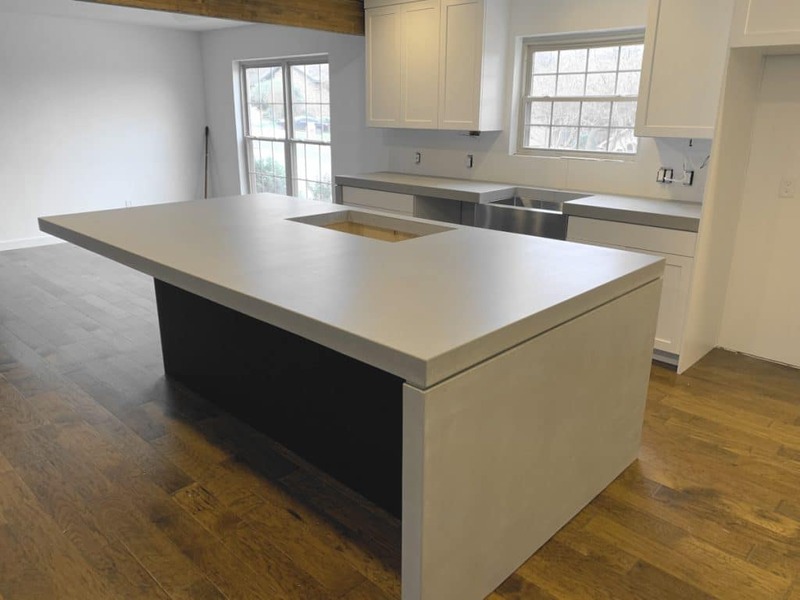 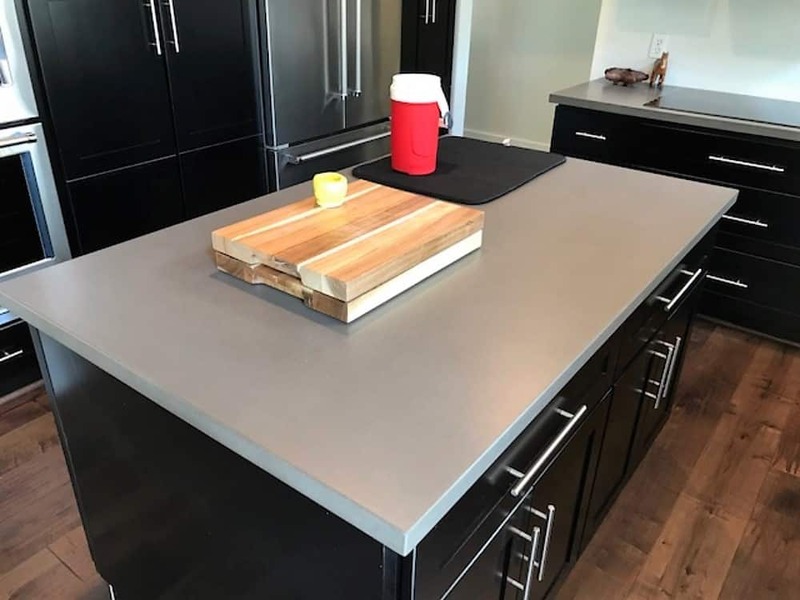 No worries, these gray concrete countertops fit like a glove. 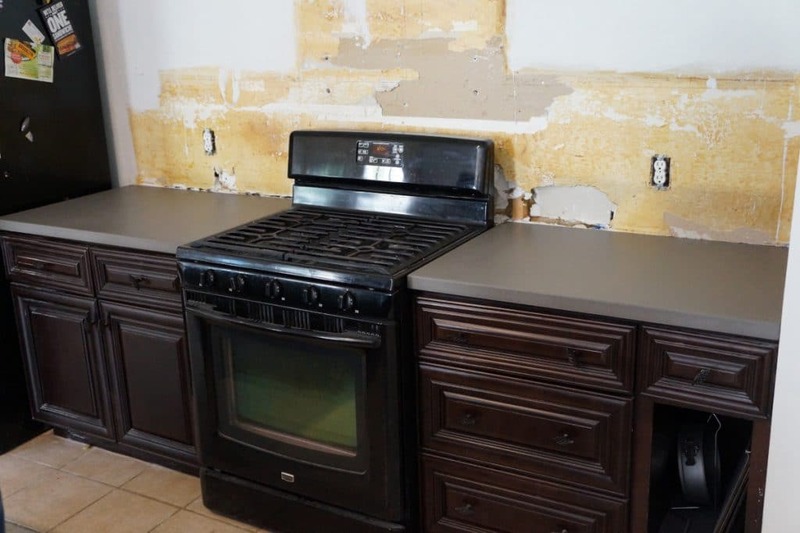 This was our first experience with a stove that is supported by the countertops. 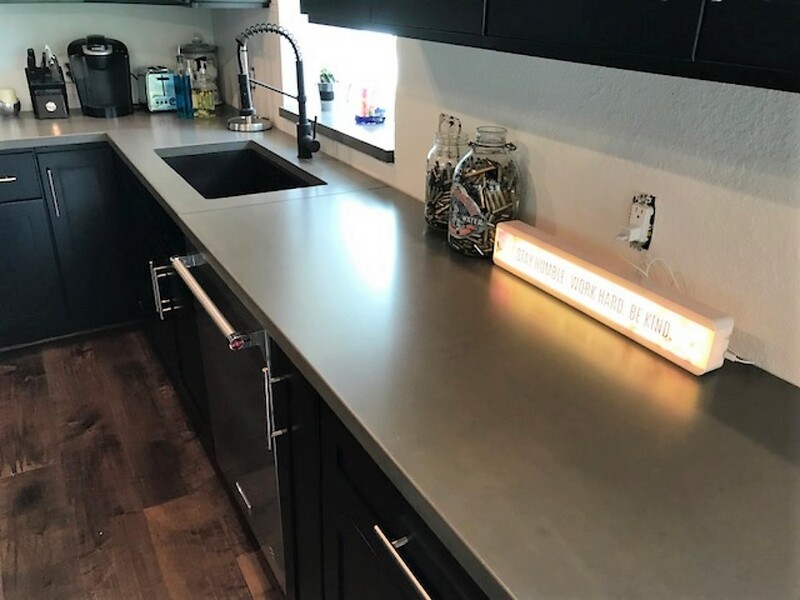 Can't argue with the looks. 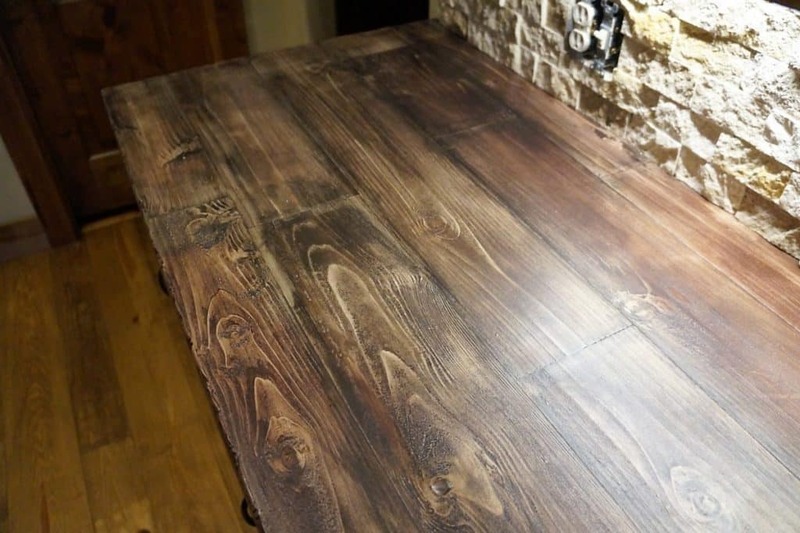 This is all one piece. 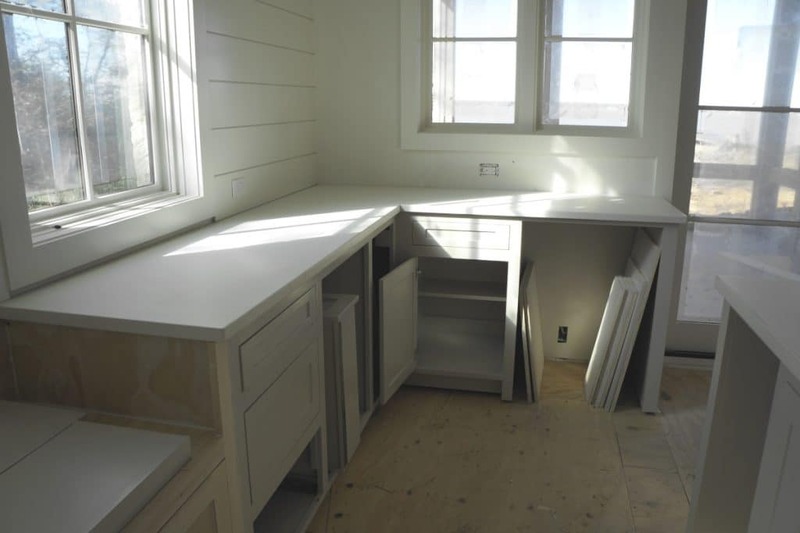 Hardest part was trying to figure out how to load it on the trailer for transport, followed closely by figuring the square footage. 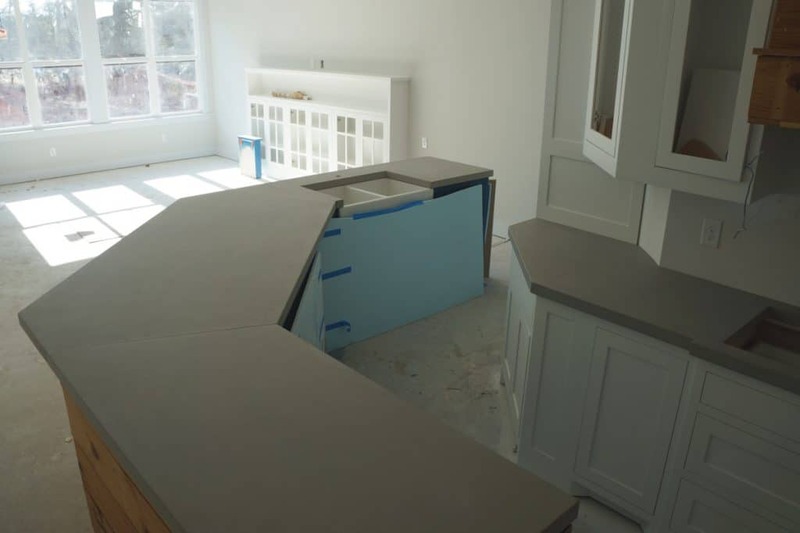 I don't think geometry prepared us for this shape. 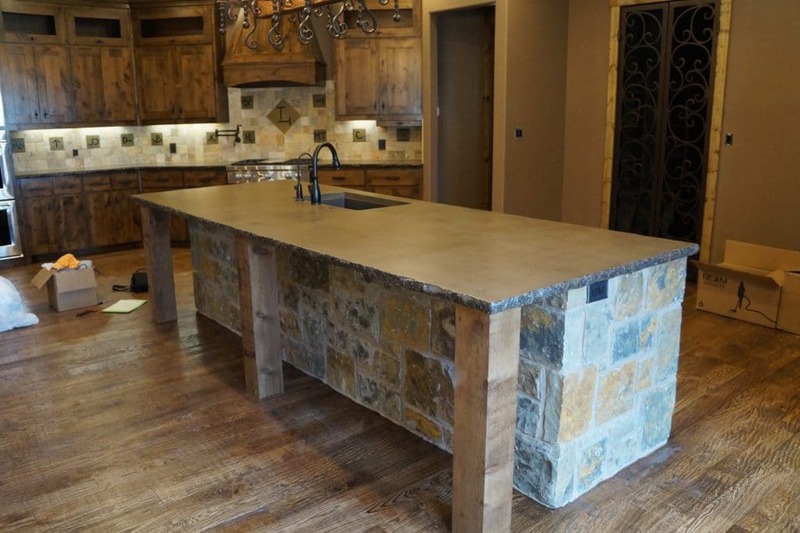 Brown Kitchen Island with chiseled edge installed in Allen, Texas. 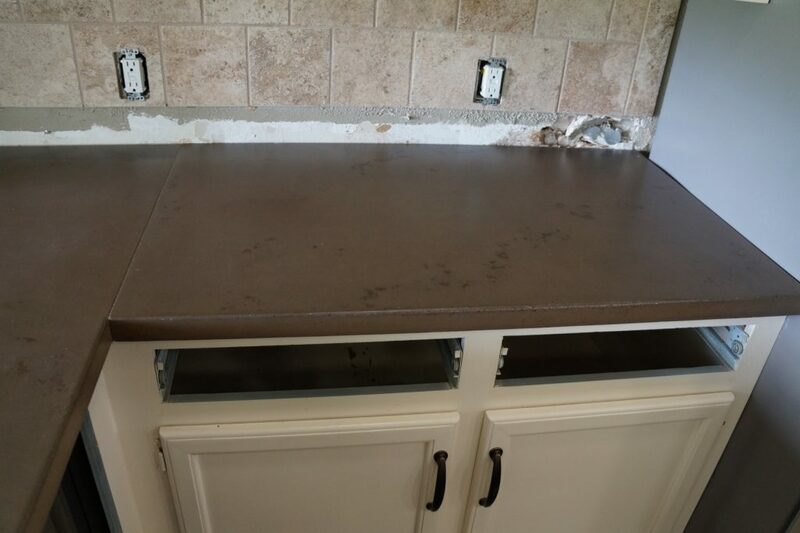 This is one of those instances where we replaced granite that had broken. 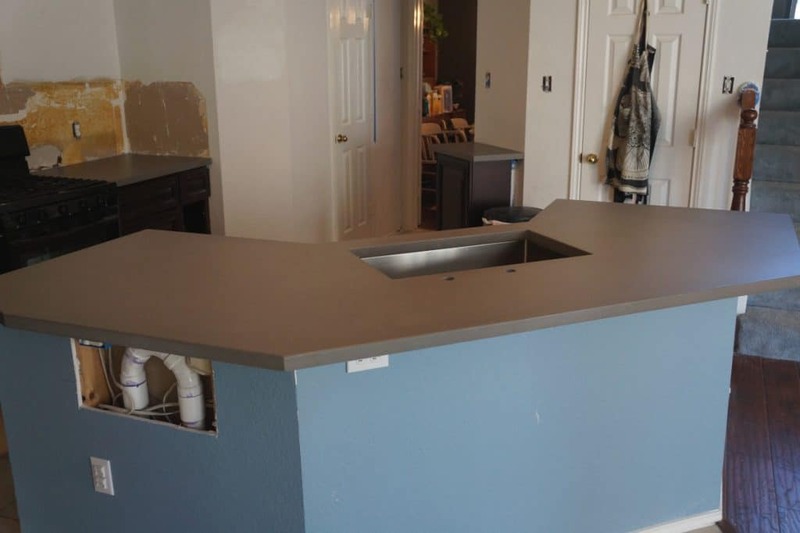 We won't get into specifics of how it broke, but lets just say there was alcohol and feats of strength involved. 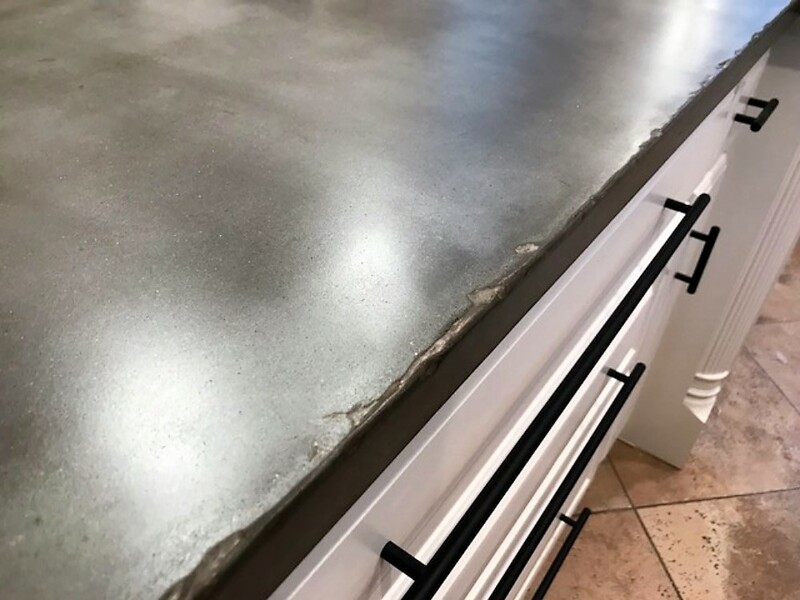 No worries for future feats, our concrete is up to the task. 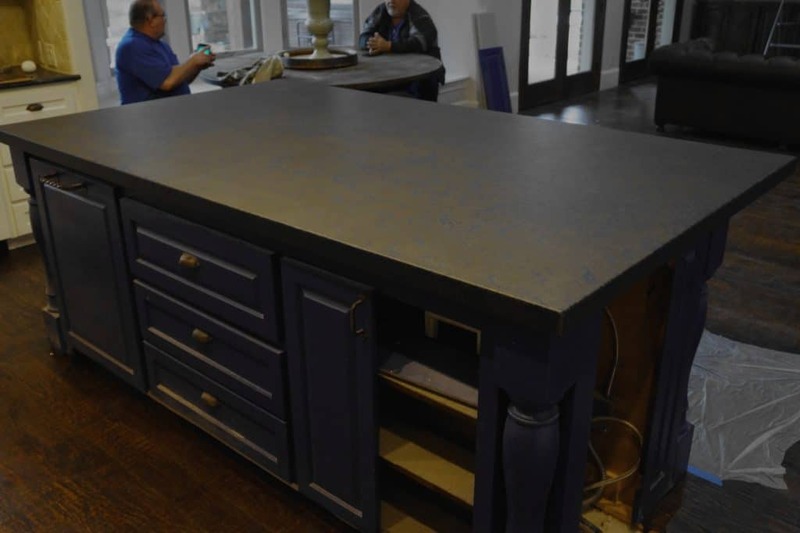 Kitchen Island installed in Decatur, Texas for Mann Made Construction. 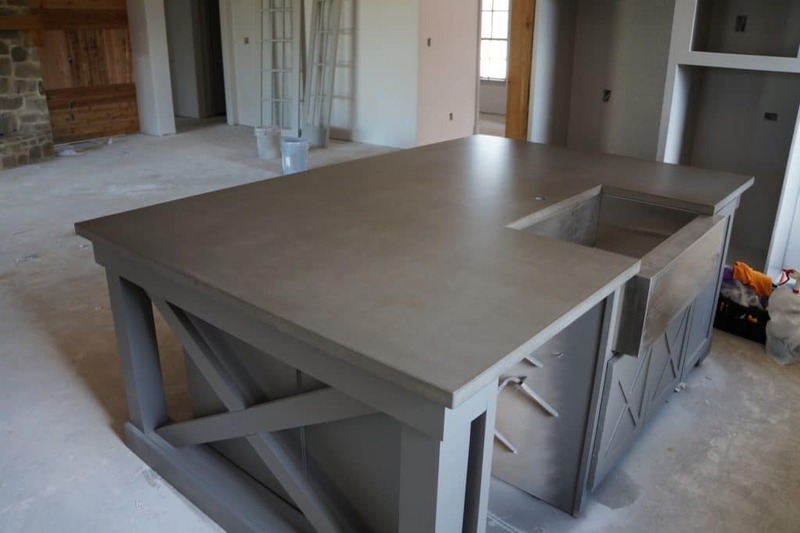 This is one of our gray finishes with a two-tone effect. 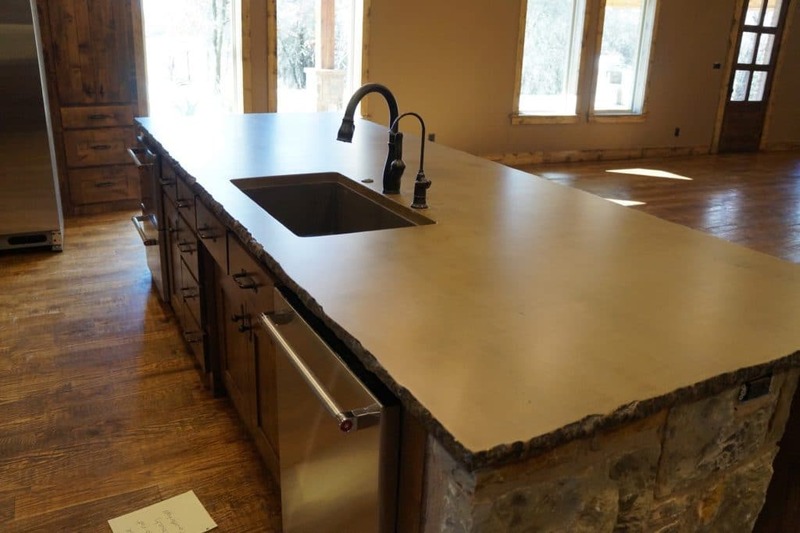 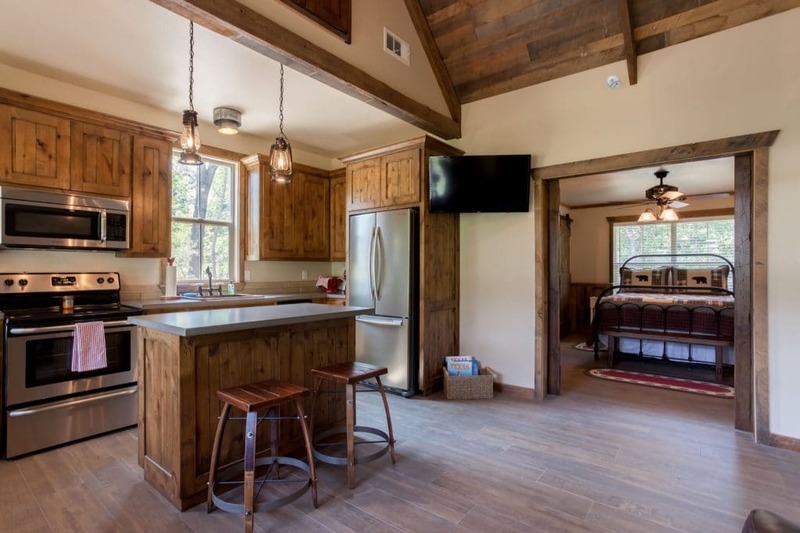 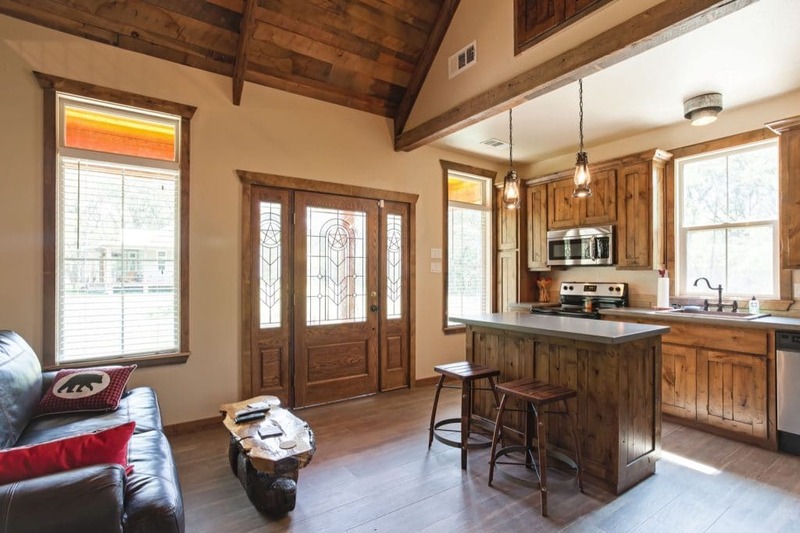 Another shot of the Kitchen Island in Decatur, Texas. 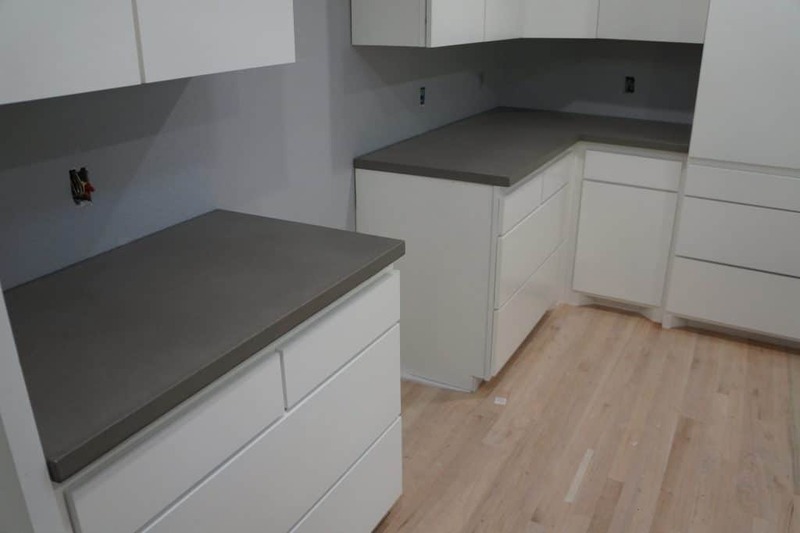 This shows the two-tone gray finish a bit better. 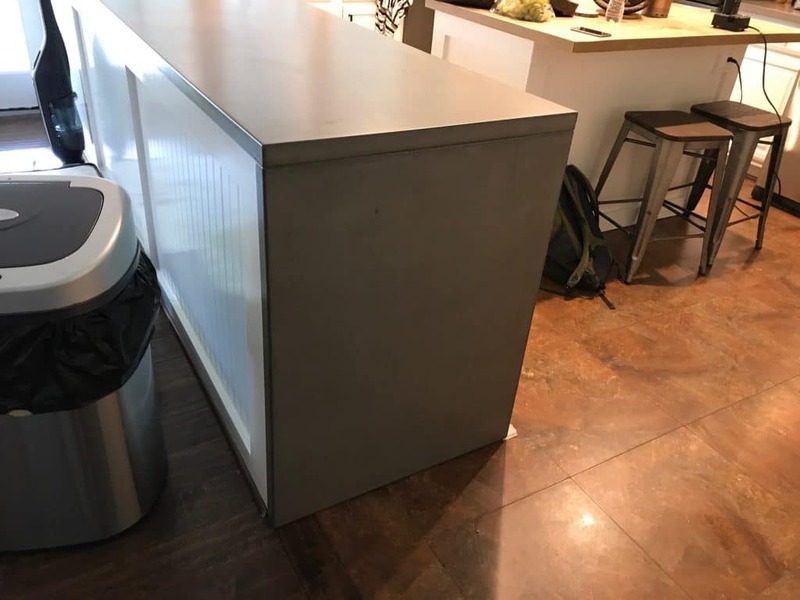 Free bag of trash with every install! 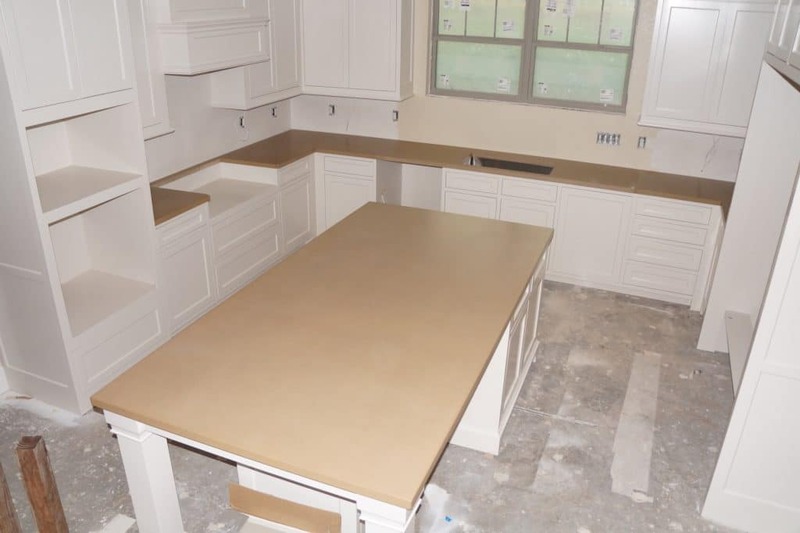 Course who would notice with those great looking countertops. 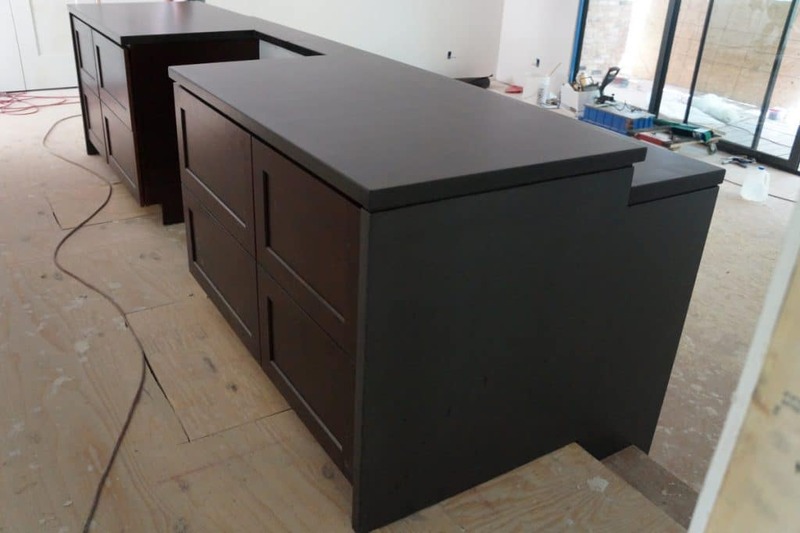 This island was so long that when we loaded it on our deliver cart, we couldn't drive it up the trailer ramp without dragging the end of the piece on the ground. 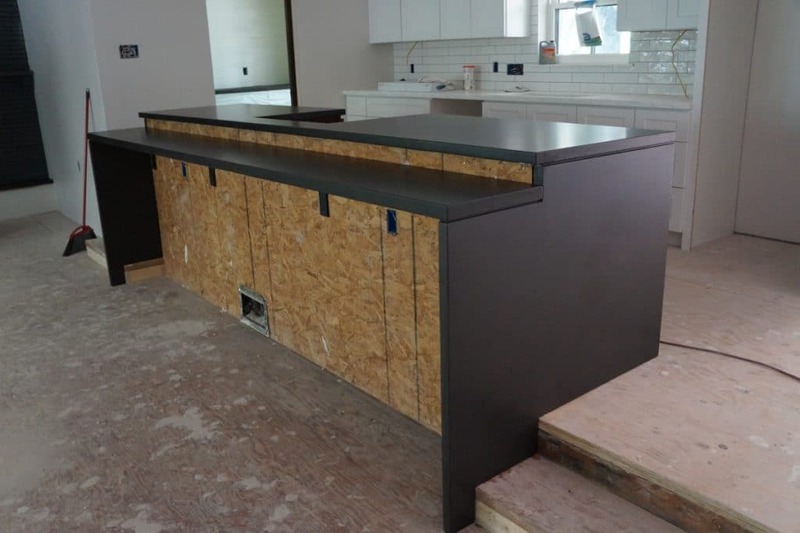 We had to make an extension ramp to make the angle less severe so we could load and unload it. 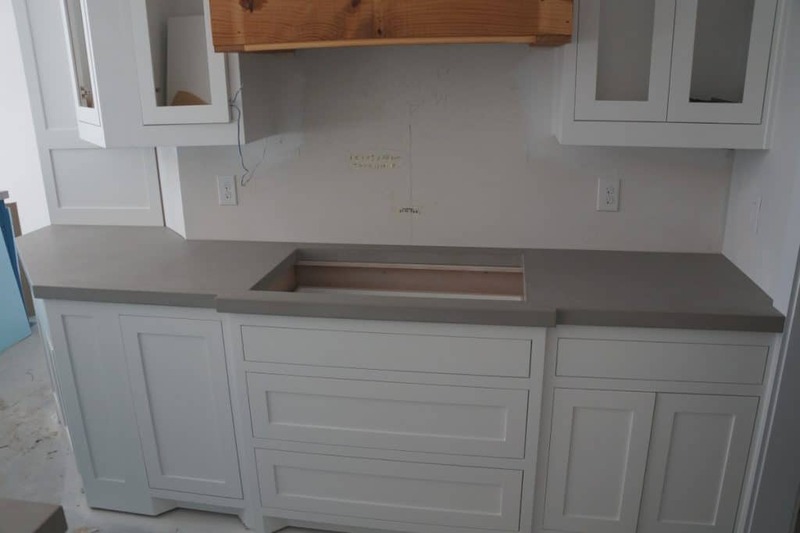 Cedar posts weren't needed for support. 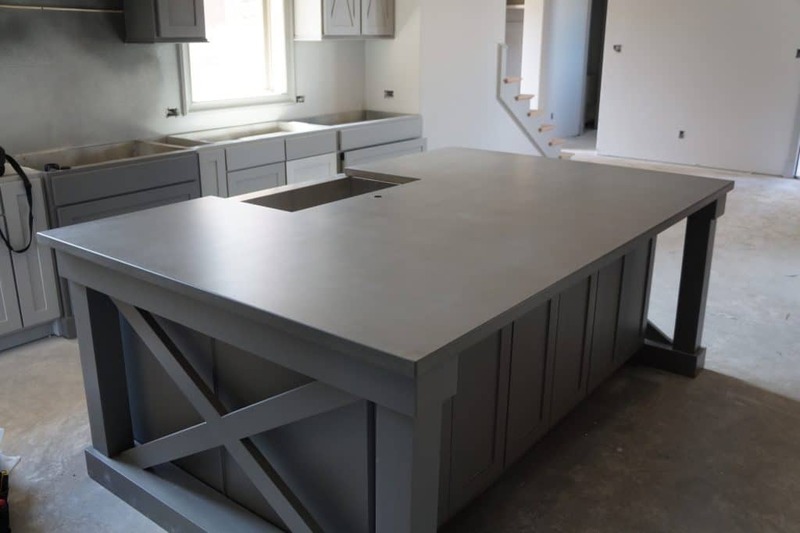 Our concrete countertops are strong enough to have 1/3 of the piece cantilever out unsupported, but you can't argue with the look. 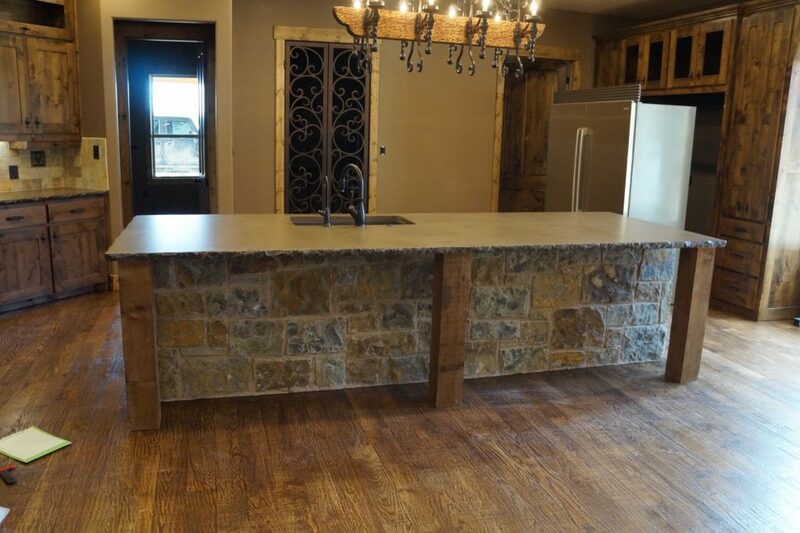 This install was about 1 1/2 hours from the shop on a working cattle ranch. 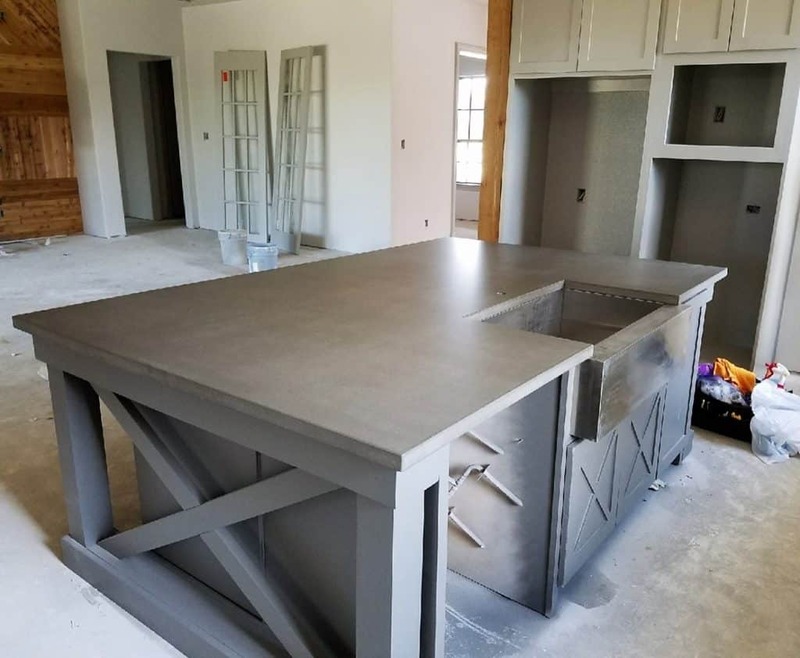 We had gravel roads and several cattle guards to traverse on the trip and we were delivering the longest piece we'd ever made. 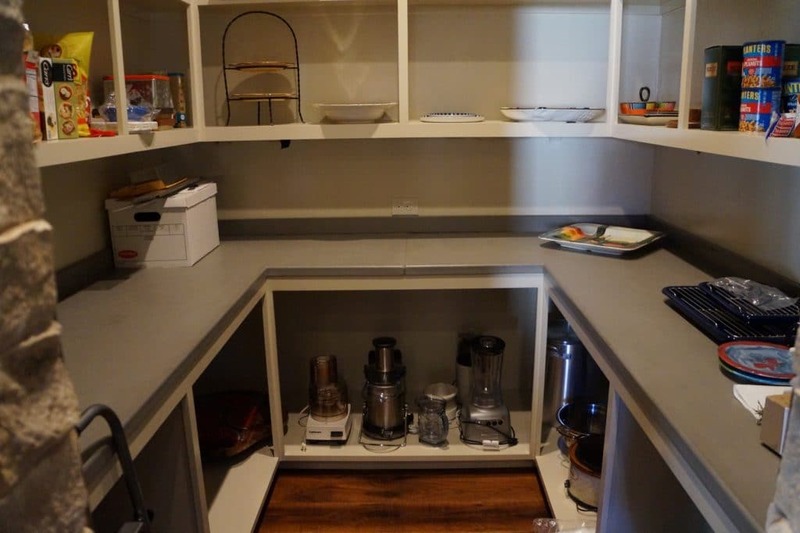 Needless to say, I was a nervous wreck the entire trip. 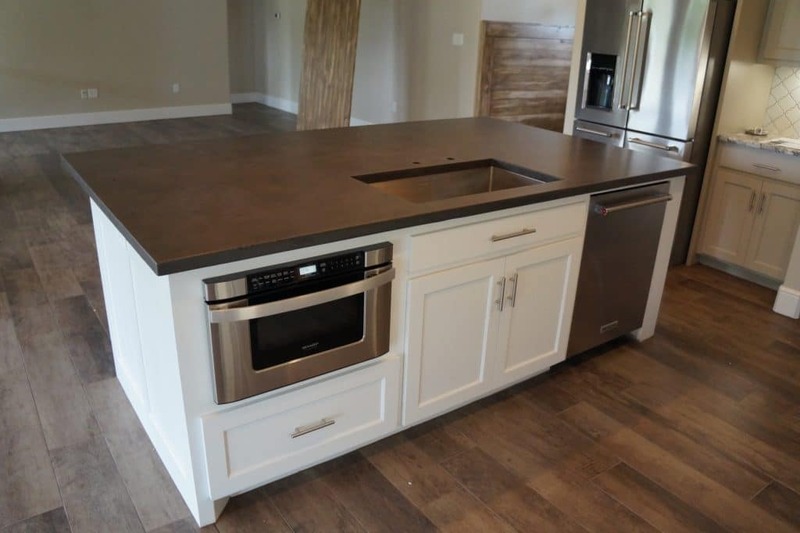 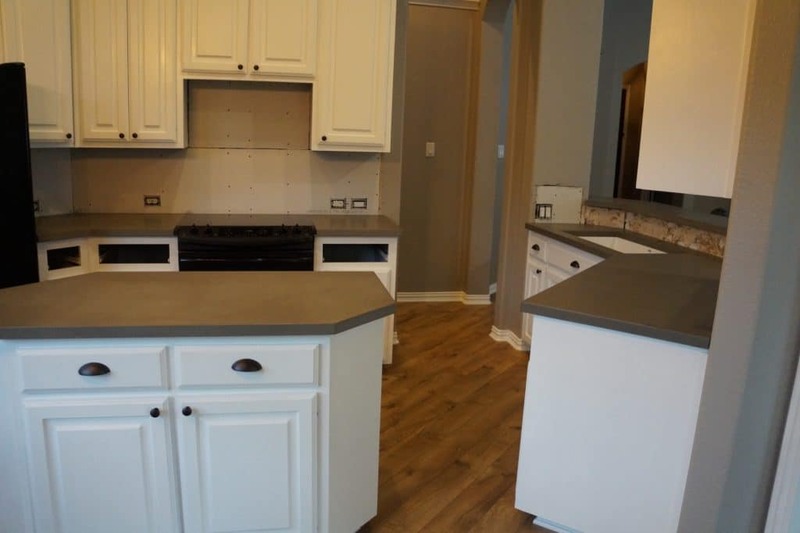 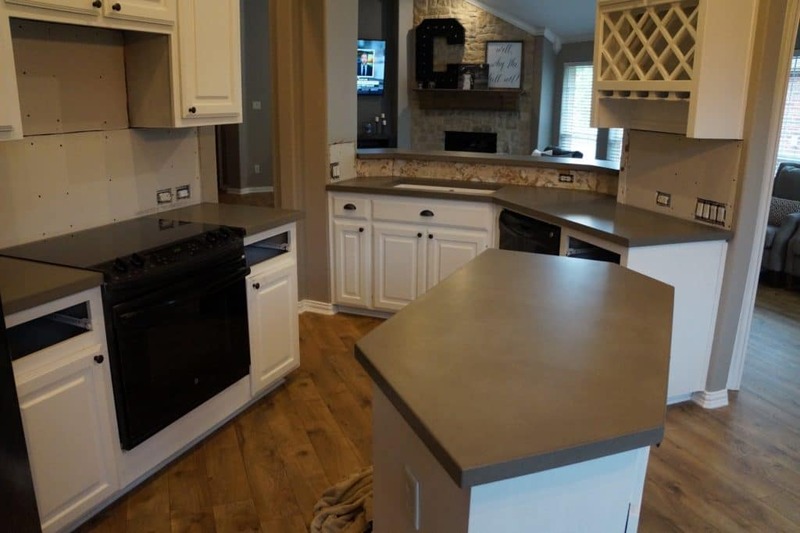 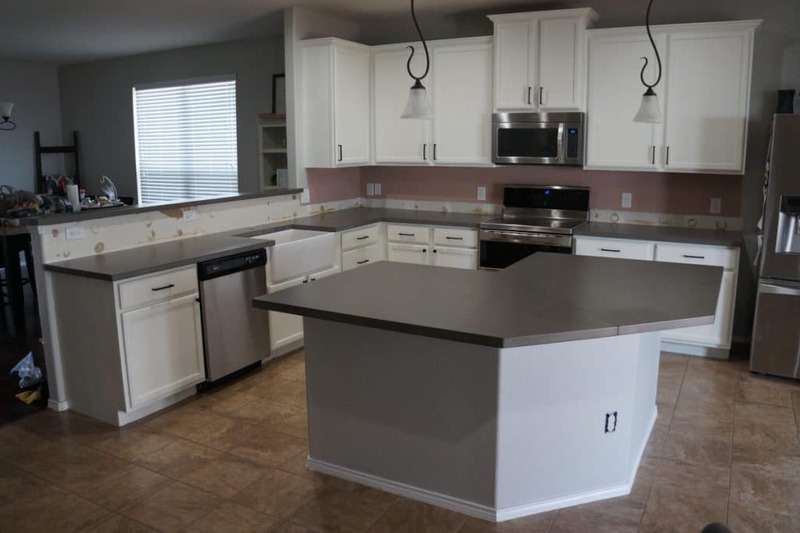 Brown with dark Brown fill Concrete, Kitchen countertops with chiseled edge installed in Montague, Texas. 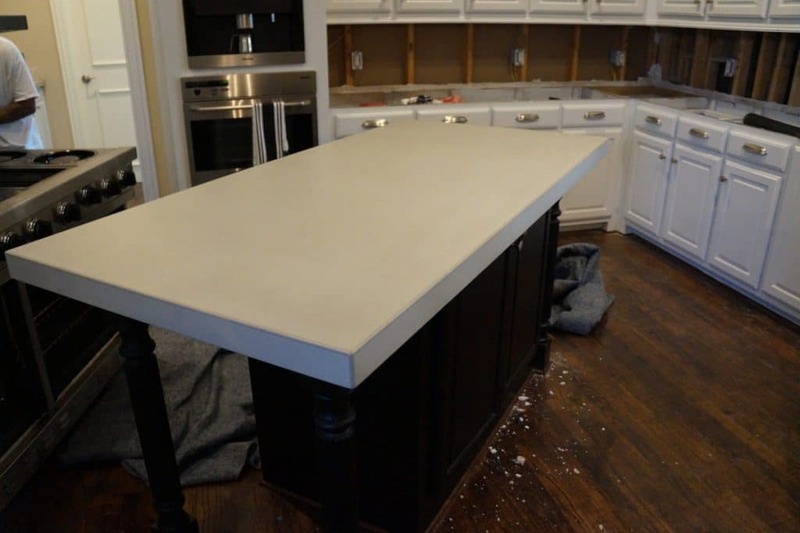 The island was close to 12 feet long and weighed over 1100 lbs. 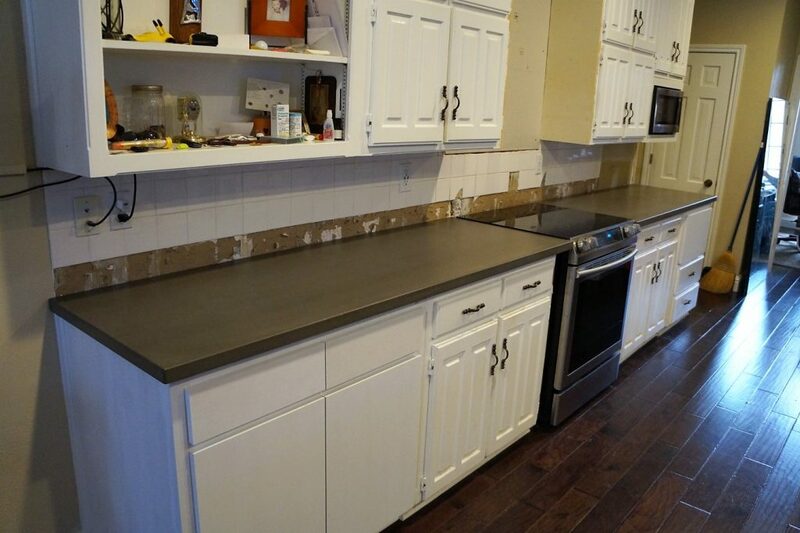 The lighting makes it look brown, but this is actually grey with brown fill. 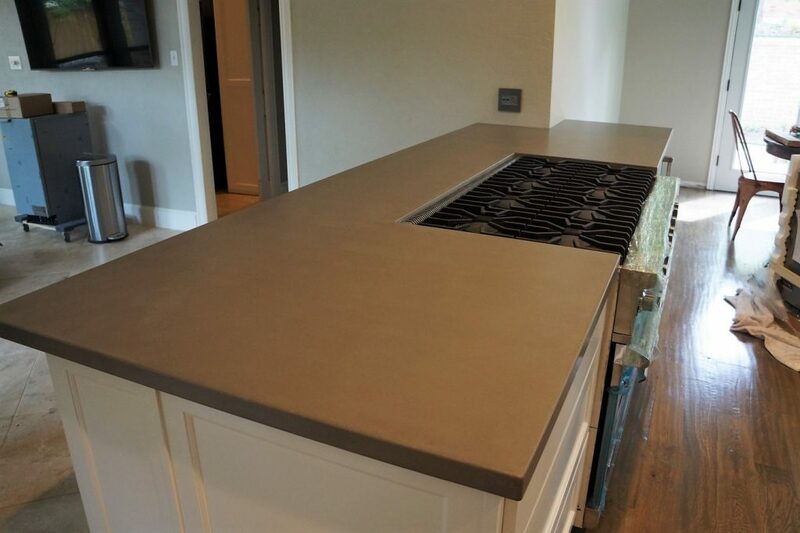 Notice the detail on that chiseled edge. 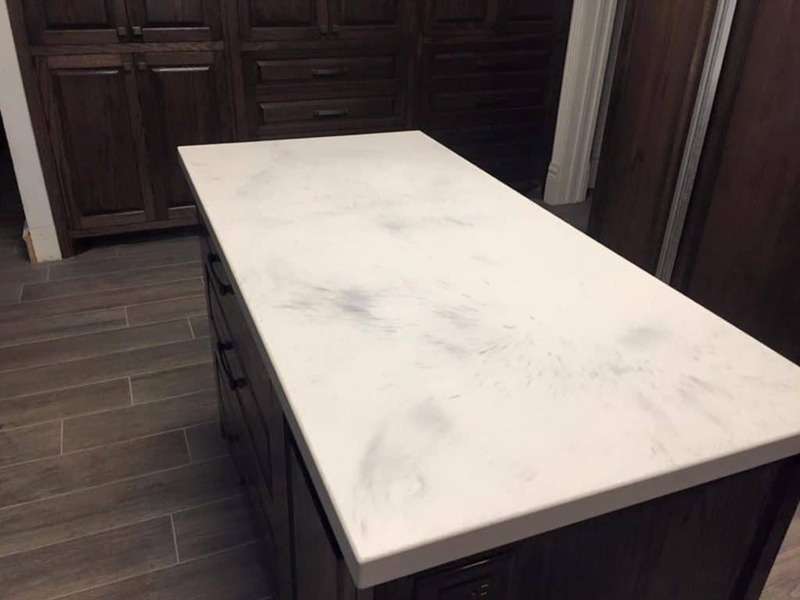 Looks rough but it's smooth to the touch. 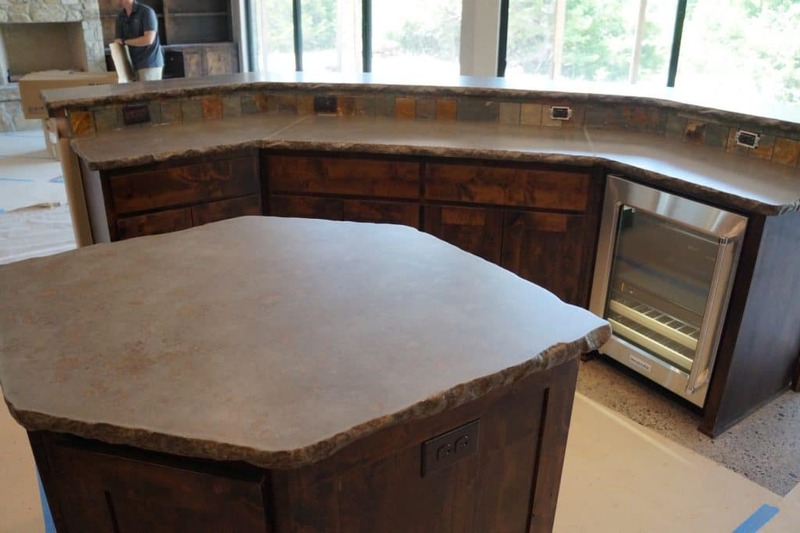 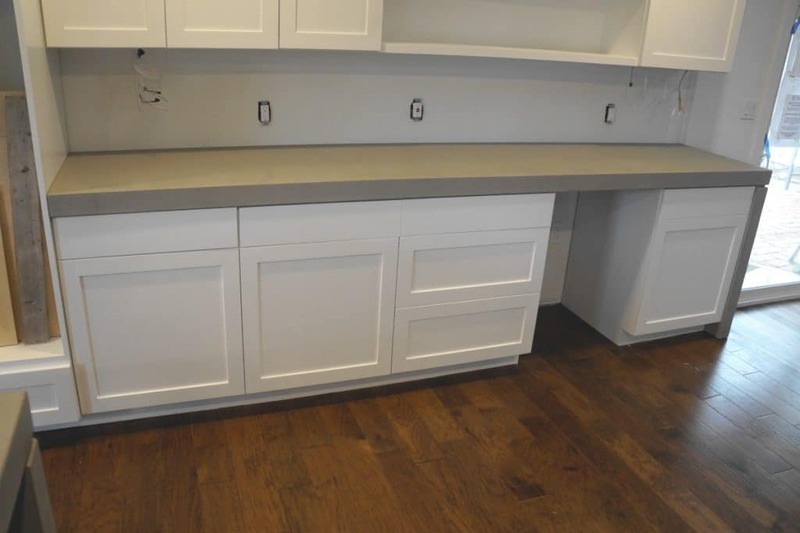 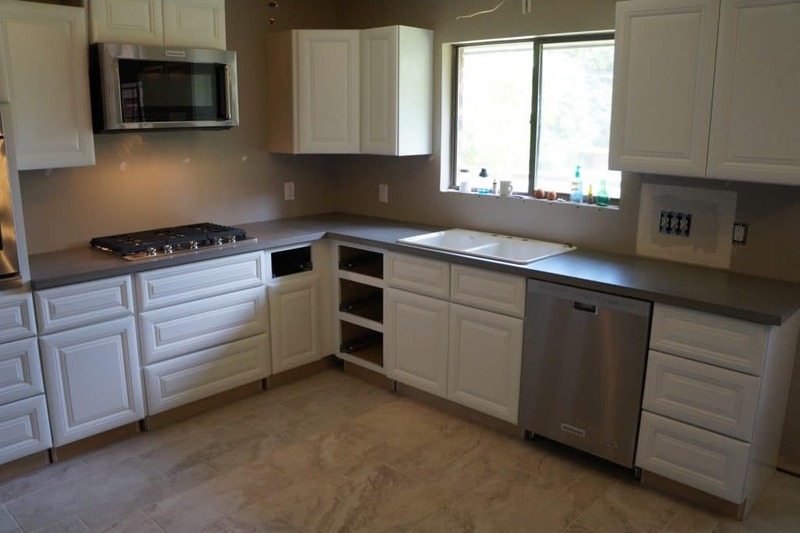 The brown fill really ties the countertops in with the cabinets. 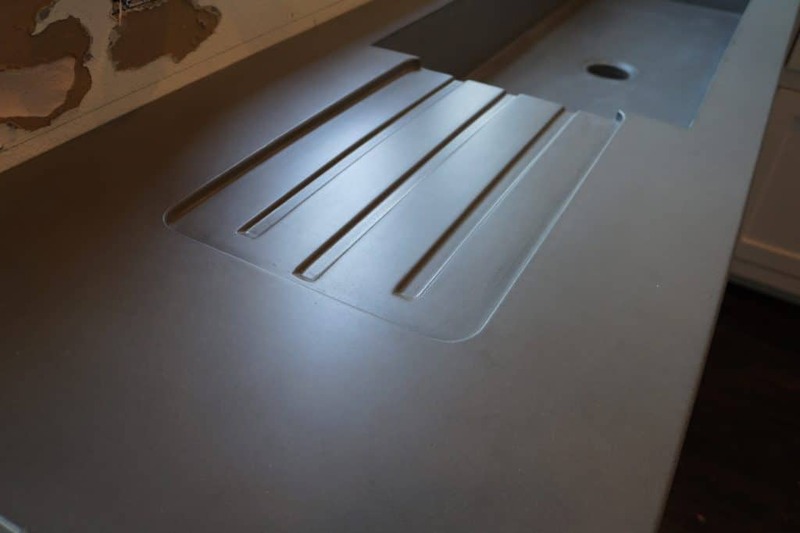 Here's a good shot of the fill coloring. 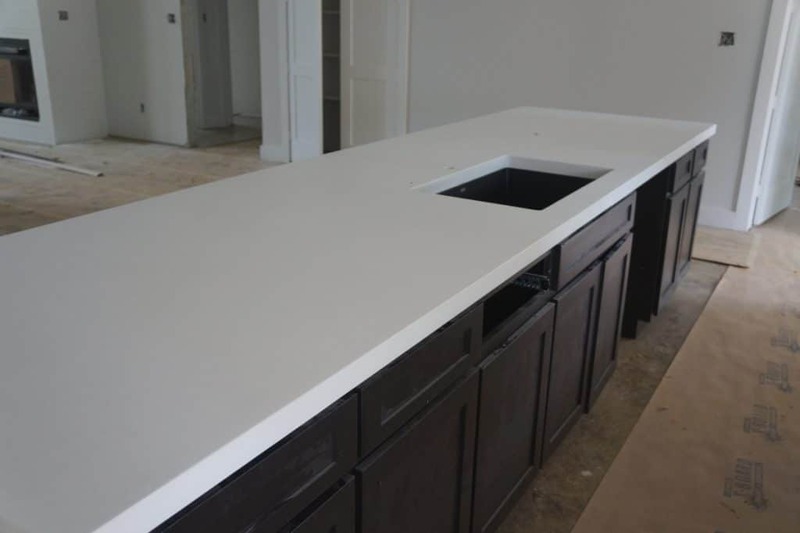 This was a memorable job here in Aubrey, Texas. 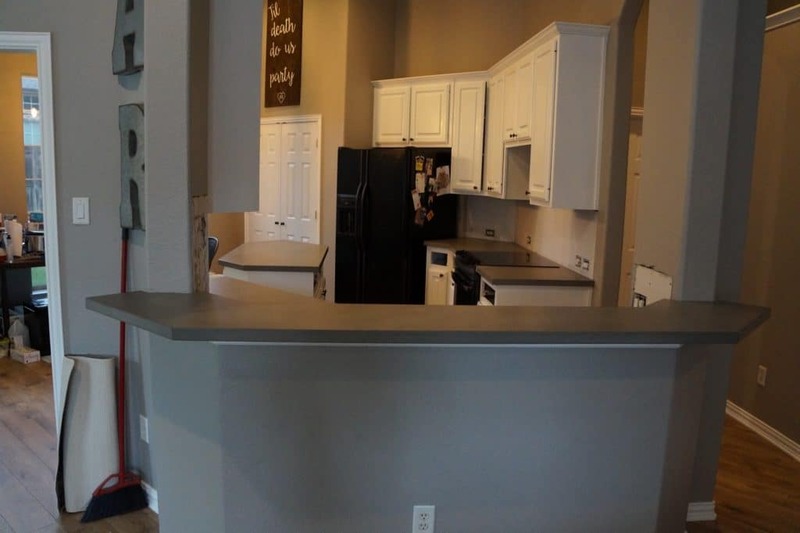 We set the alarm off going in. 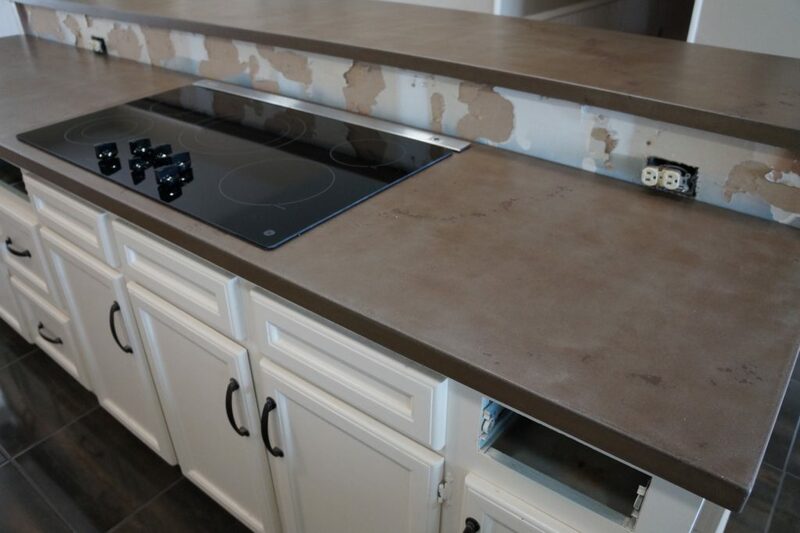 Got it shut off and went to work installing the Kitchen Countertops. 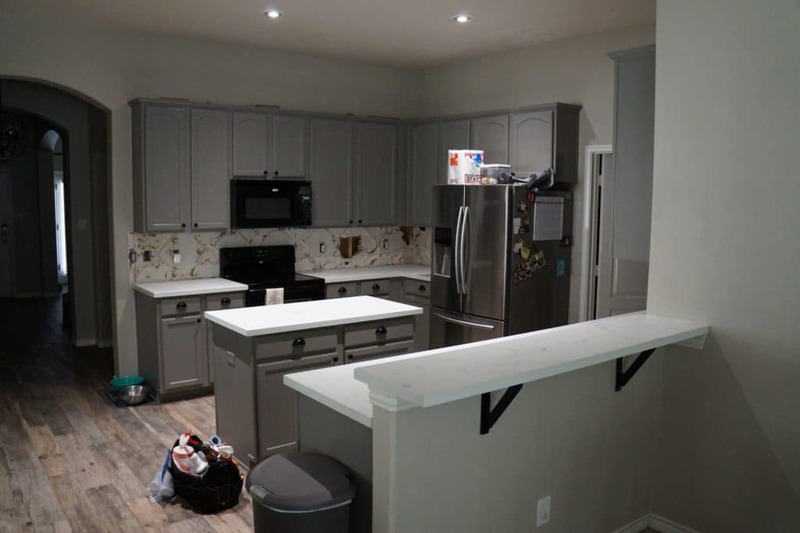 Some time later we were interrupted by a Denton County Sheriff Deputy pointing his gun at us asking what we were doing. 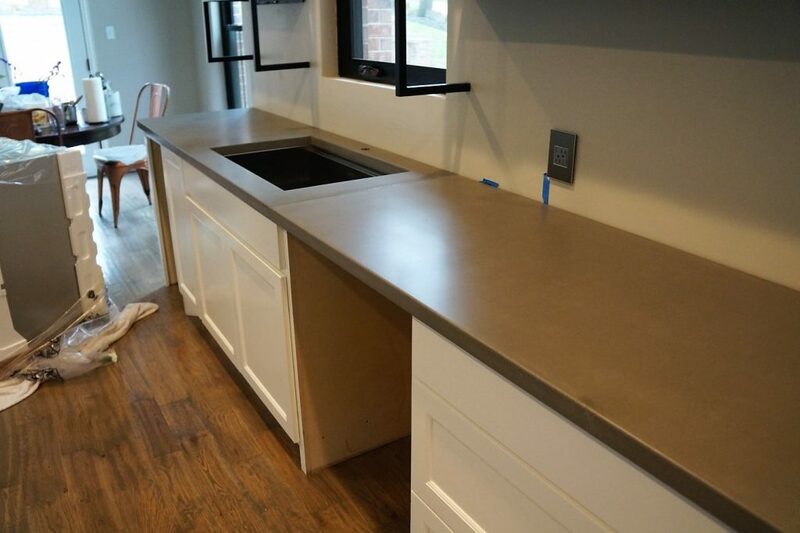 We explained that we were installing the finest concrete countertops money could buy. 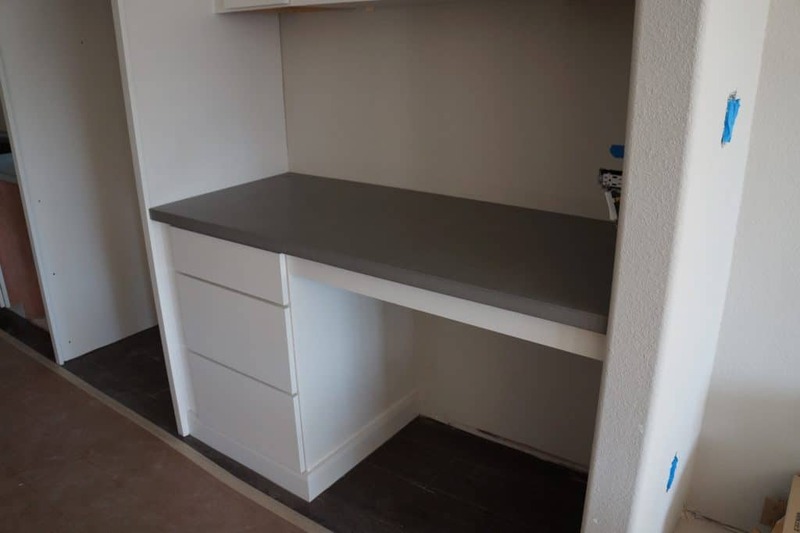 He said carry on and took one of my cards. 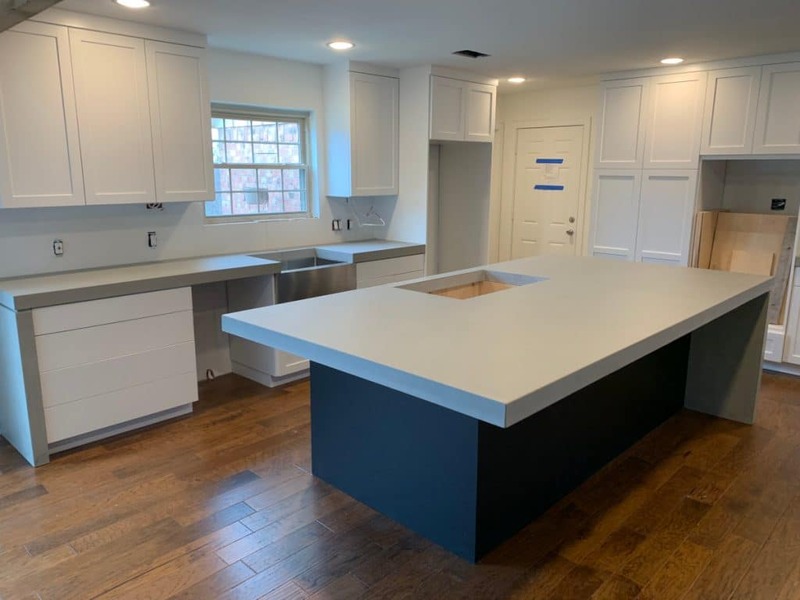 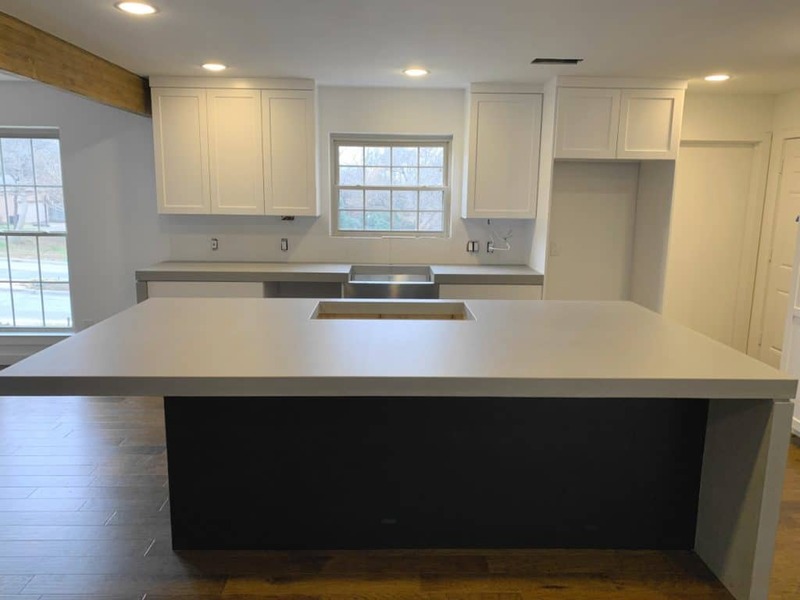 Gray Countertops with white cabinets give this newly renovated house in University Park a modern feel. 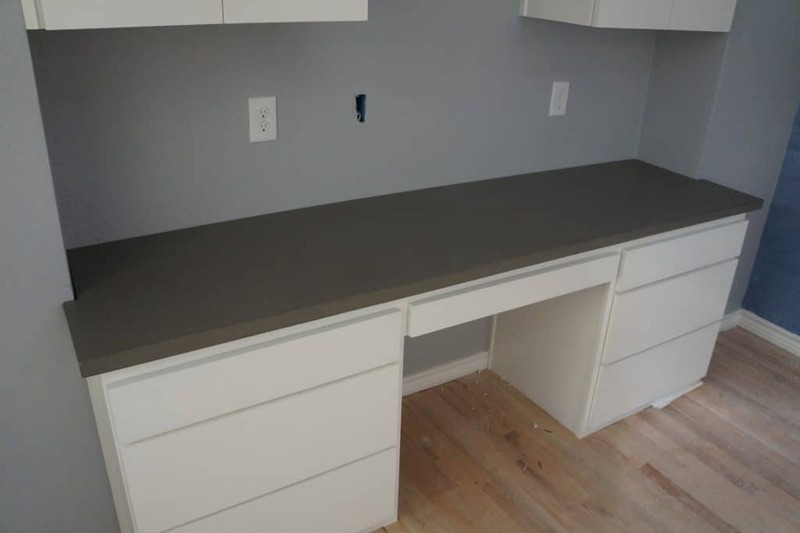 Gray Concrete Desk area right off the kitchen. 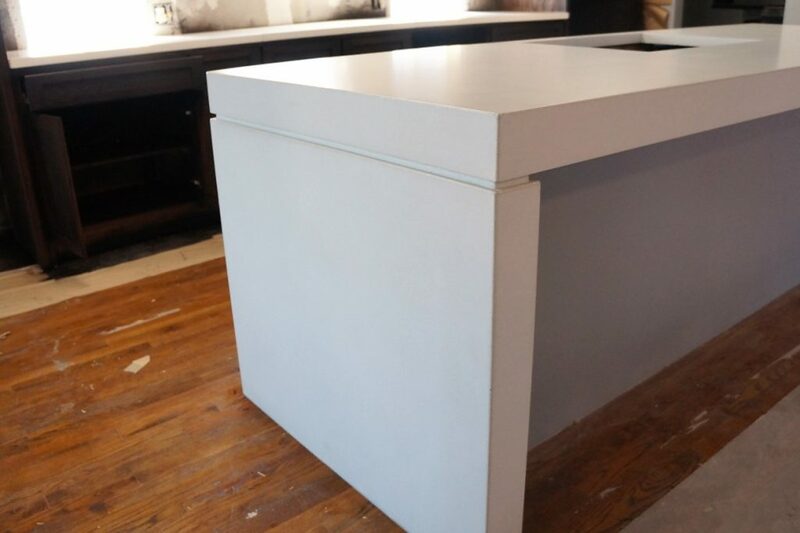 Check out those legs! 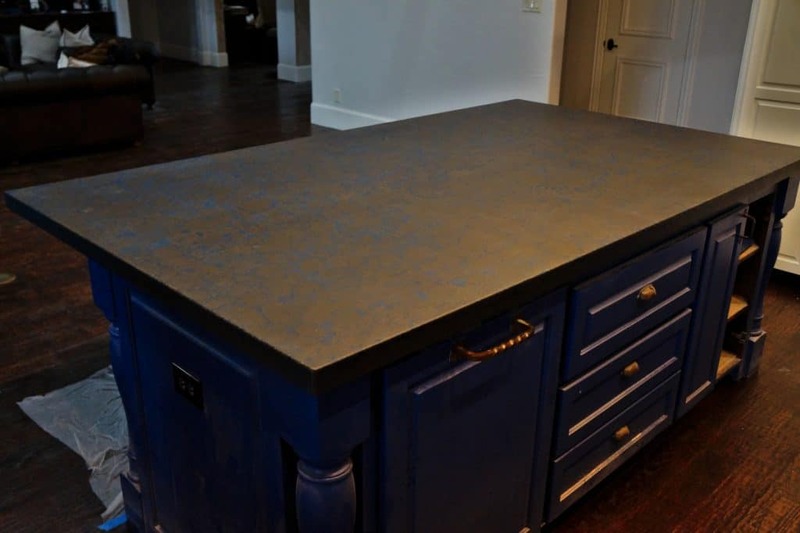 Countertops look good too. 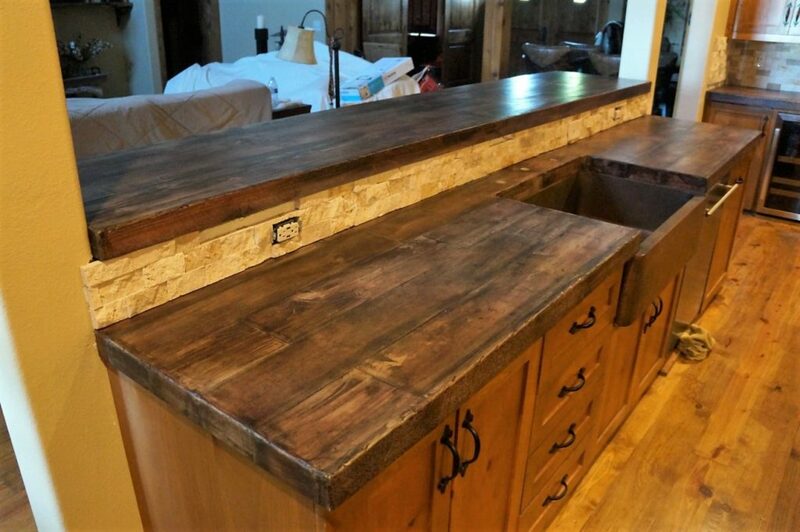 So much cool stuff going on here, now look at the countertops. 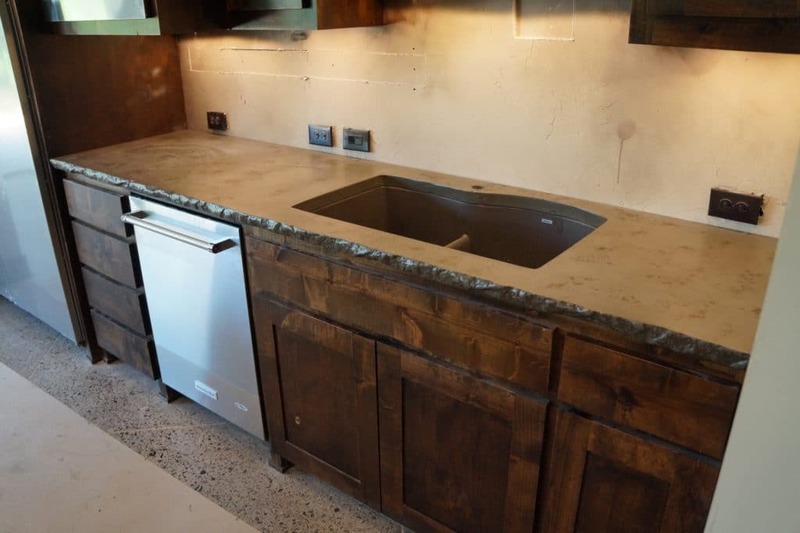 The waterfall was added a couple of weeks later and really completed the look. 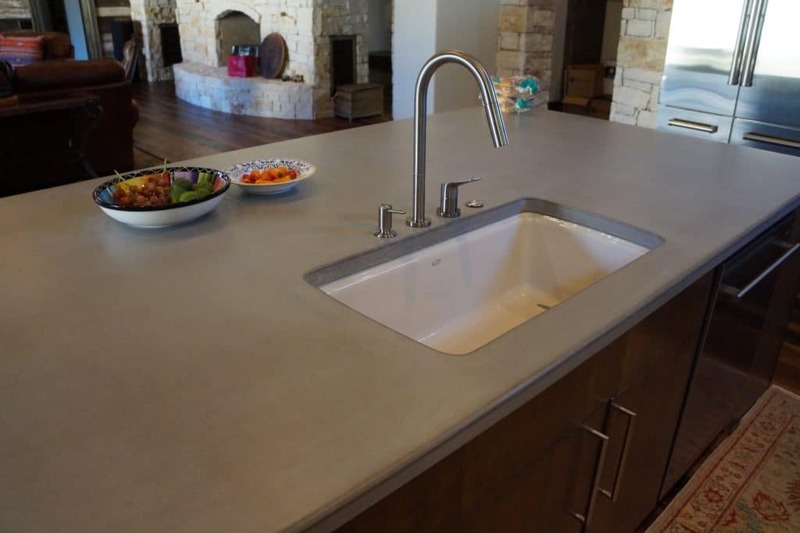 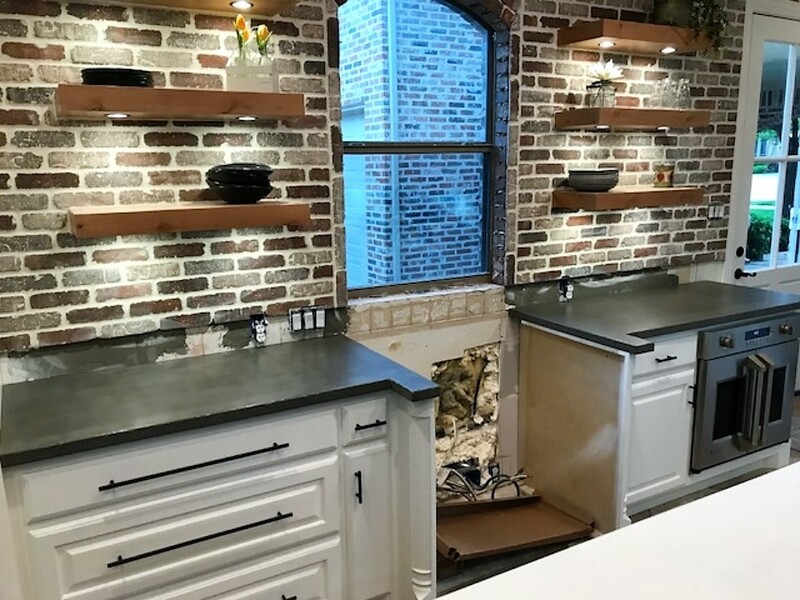 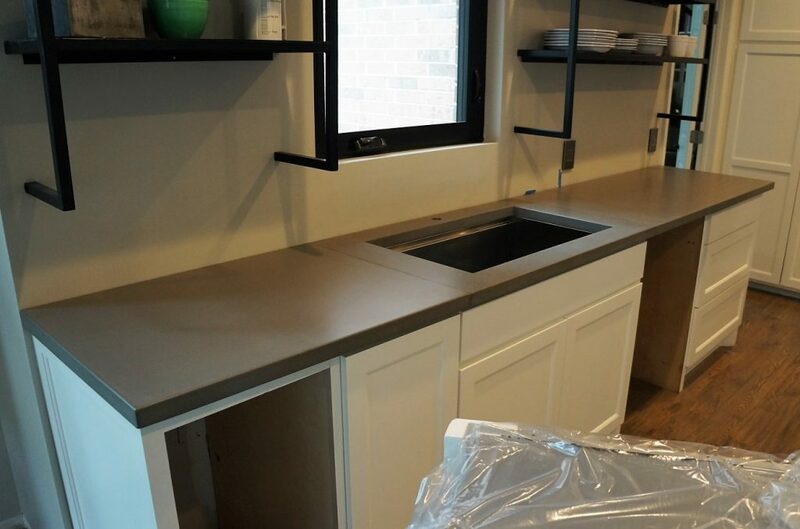 Gray Concrete Countertops installed in Dallas, Texas and yes, the mantle in the background is concrete. 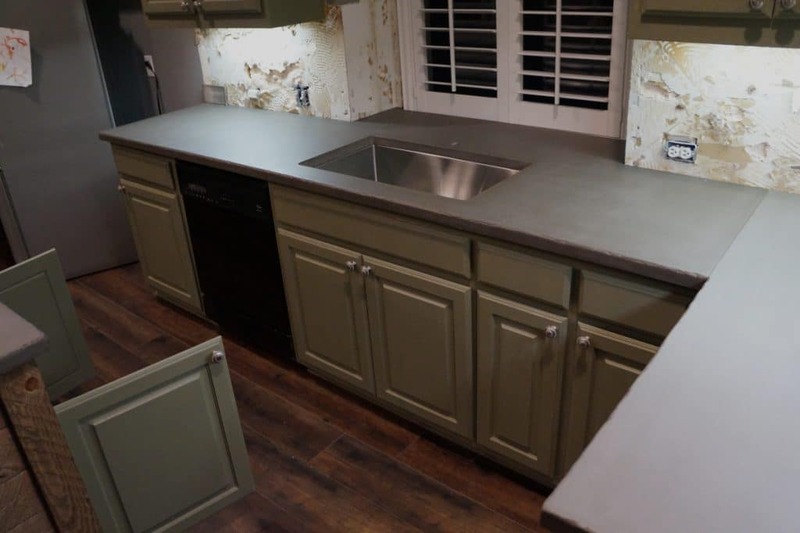 Gray Concrete Kitchen Countertops in The Texan, one of the cabins for rent at The Cabins on Bearpen Creek in Royse City, Texas. 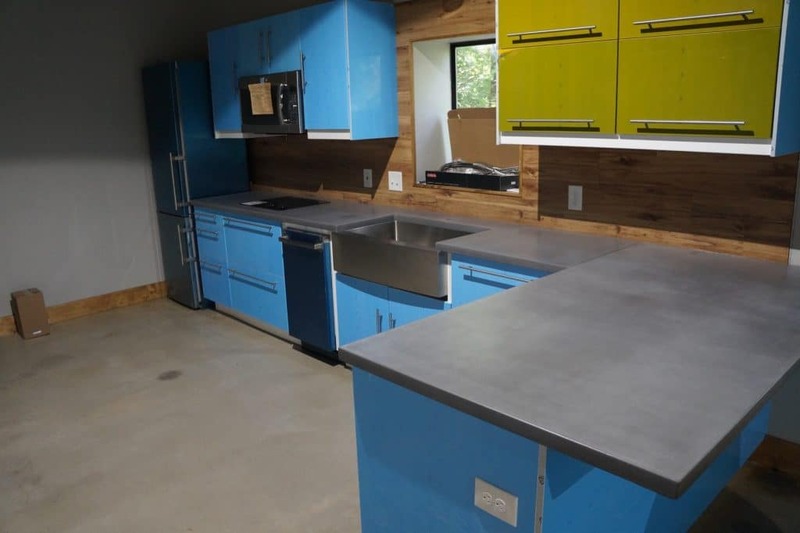 Yes, The cabin is amazing, but look at the concrete island top.